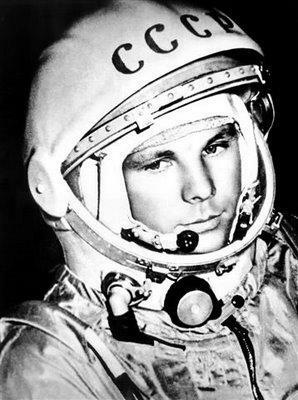 On this day in April 12, 1961, Yuri Gagarin became the first human to go into space. 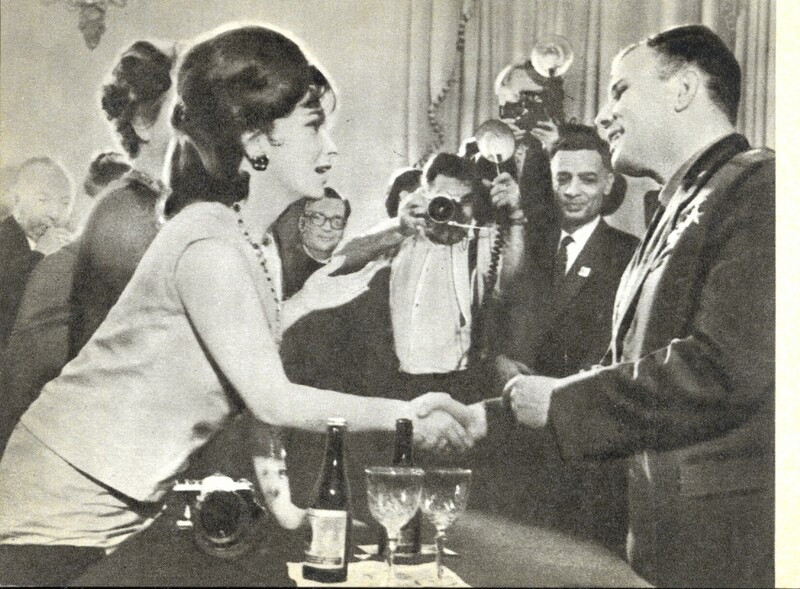 This event was one of the greatest achievements of the 20th century and is still remembered fifty years on. 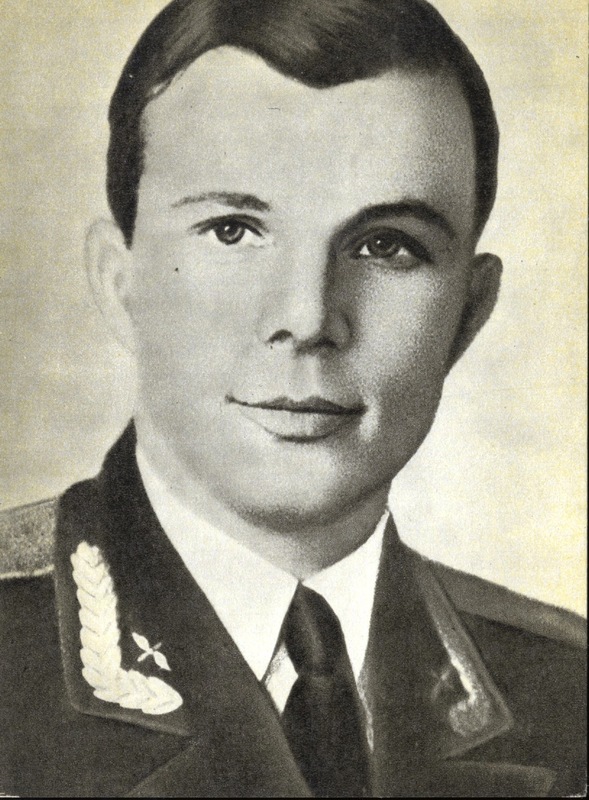 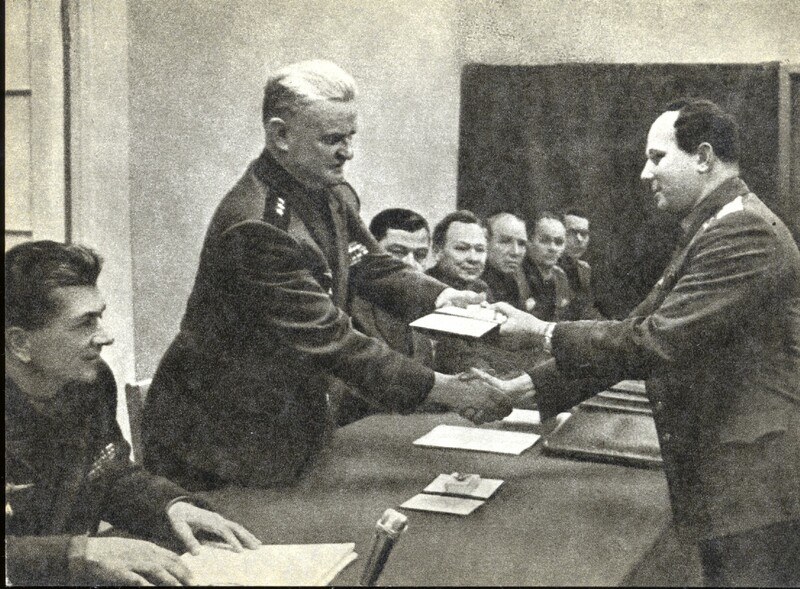 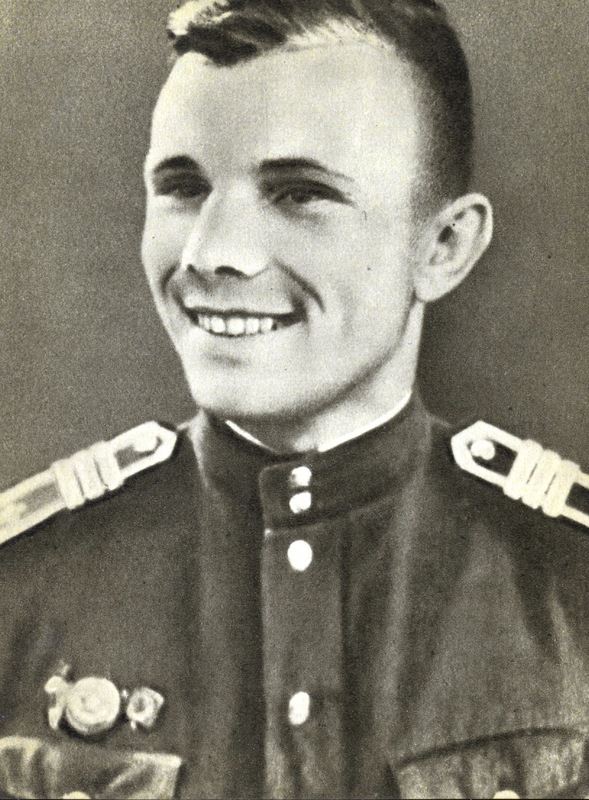 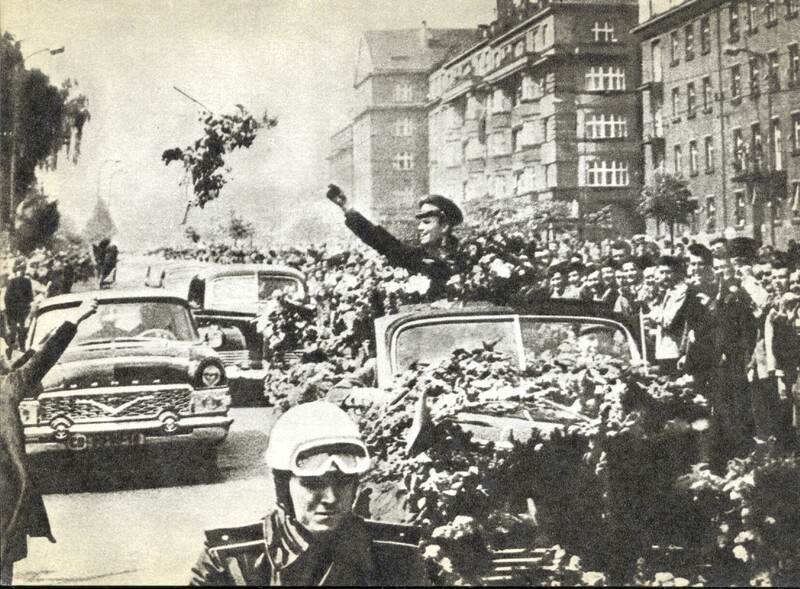 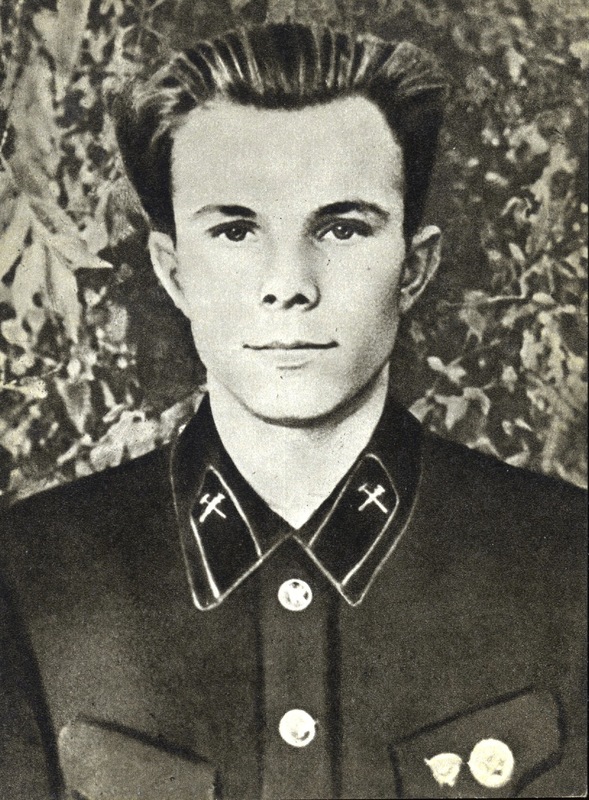 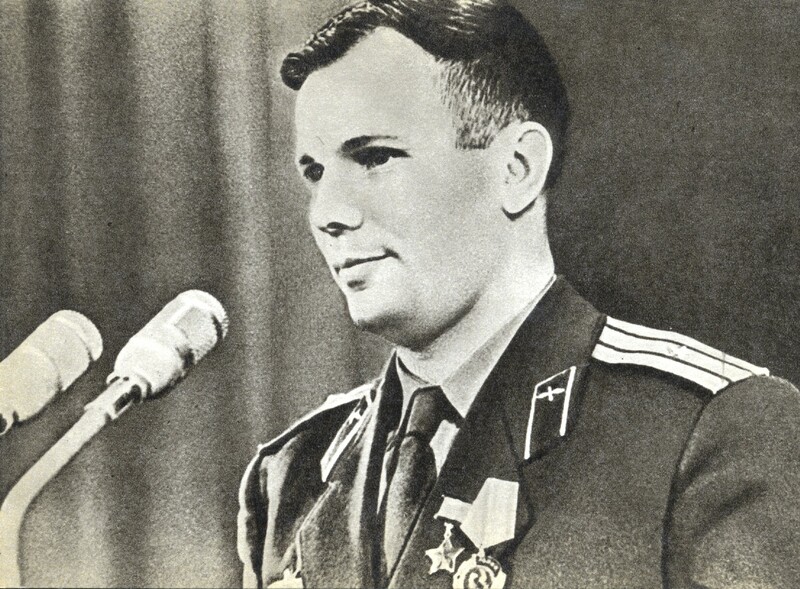 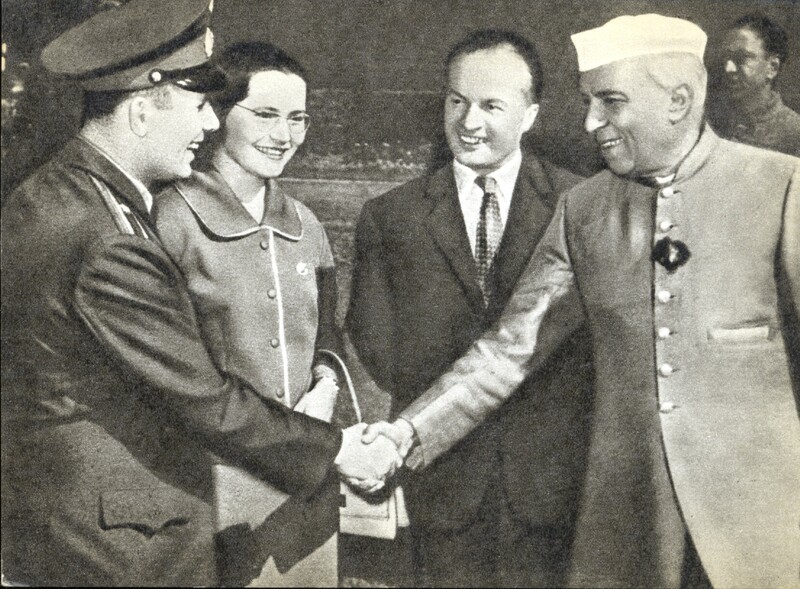 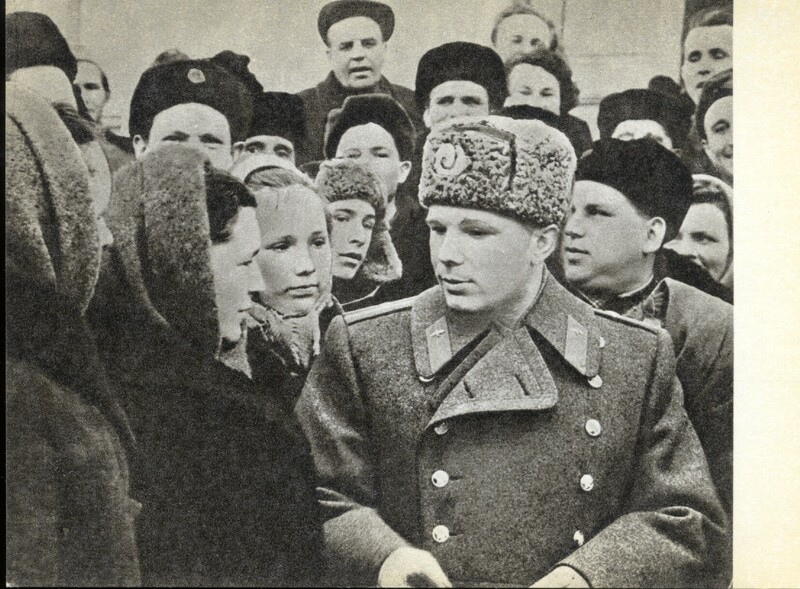 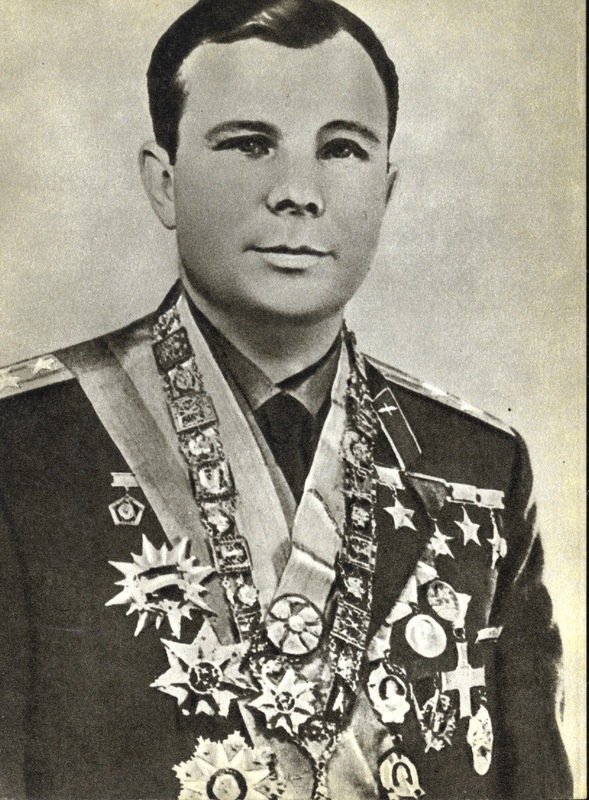 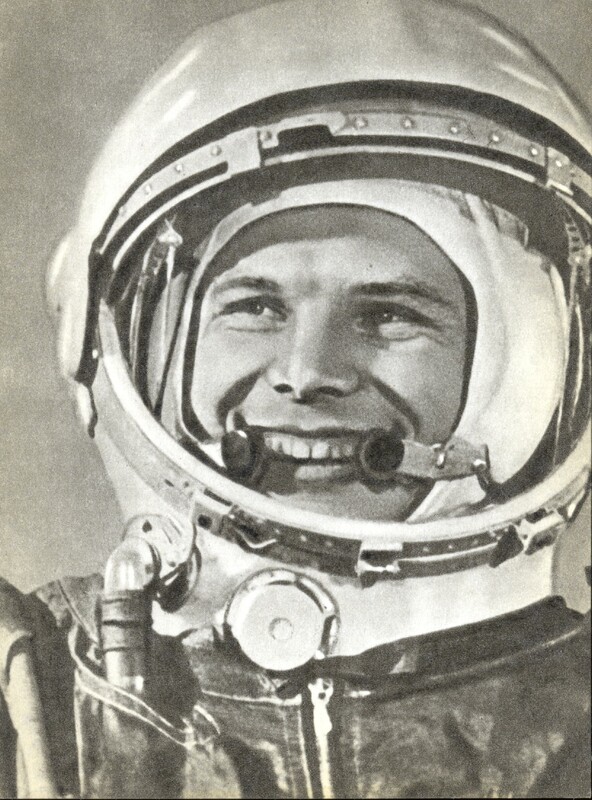 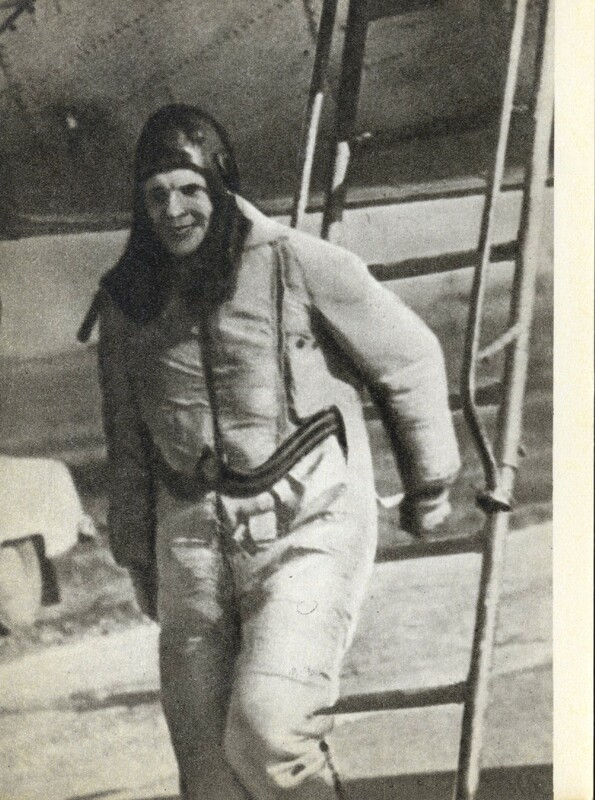 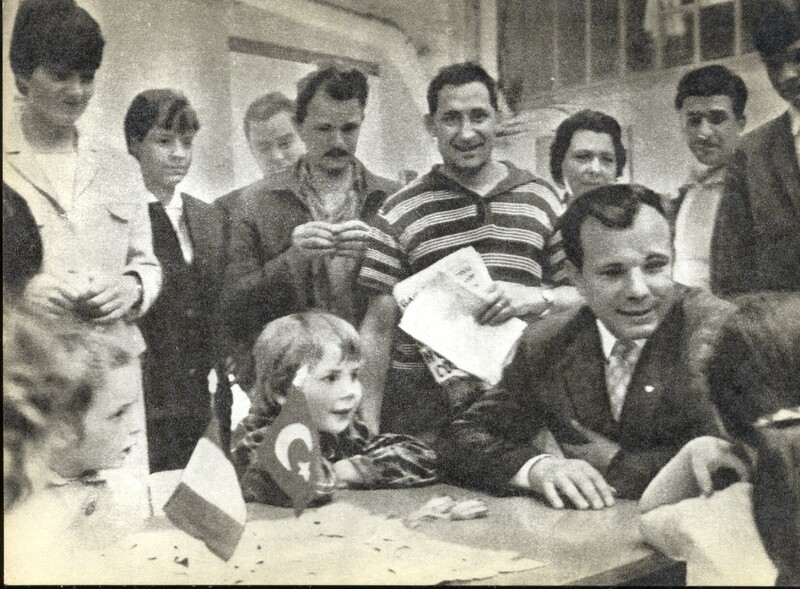 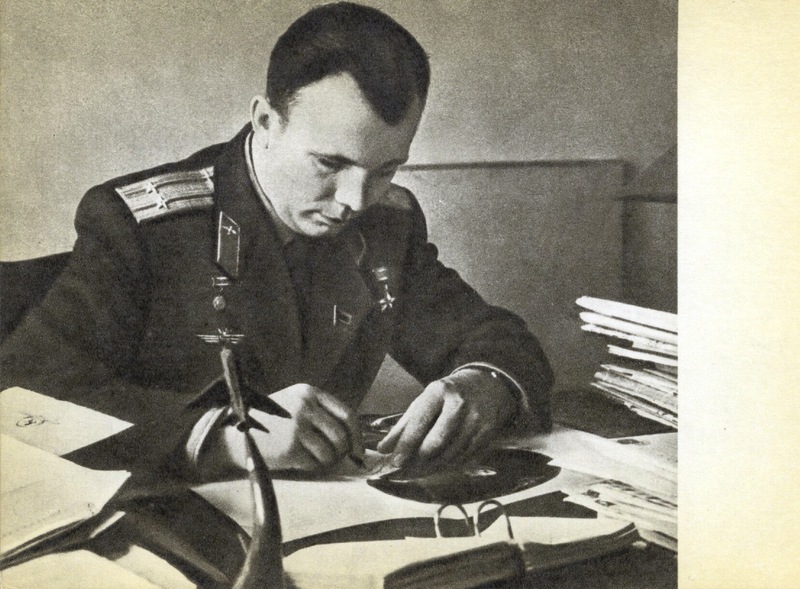 Soon becoming a celebrity to the people of the Soviet Union and the rest of eastern Europe, Yuri Gagarin was then one of the great figures representing the Soviet Union at it’s height. 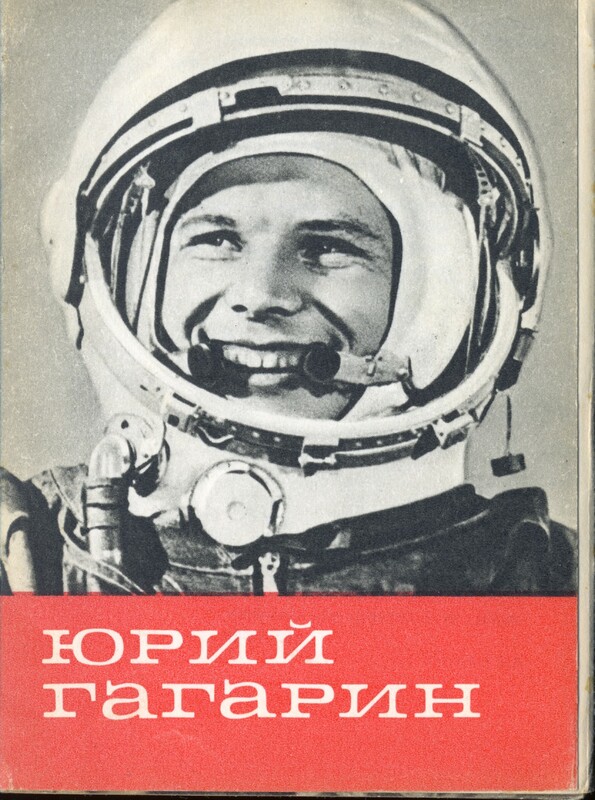 In honor of the 50th anniversary of this momentous achievement, below is a postcard collection dating from 1969 showing photographs from various parts of the cosmonaut’s life. 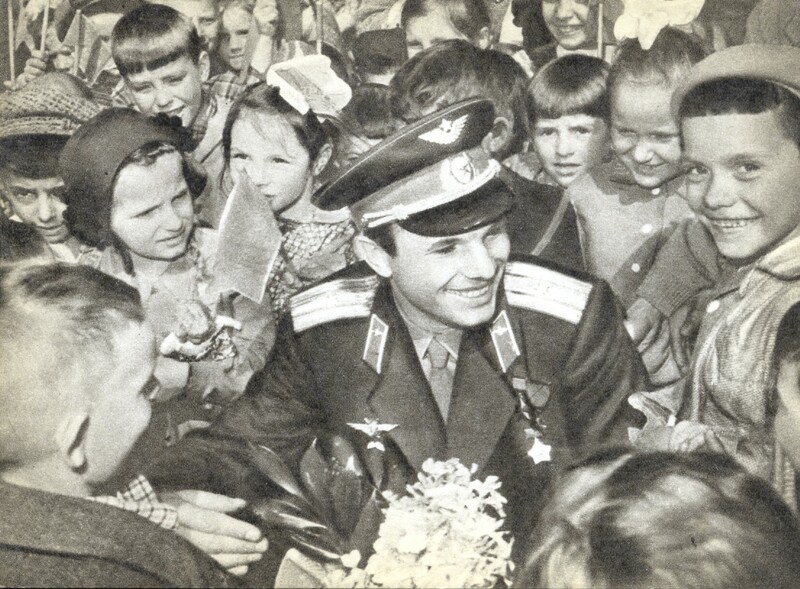 For a man who has attained such a groundbreaking achievement, the life and legacy of Yuri Gagarin will hopefully continue to be remembered for another fifty years. 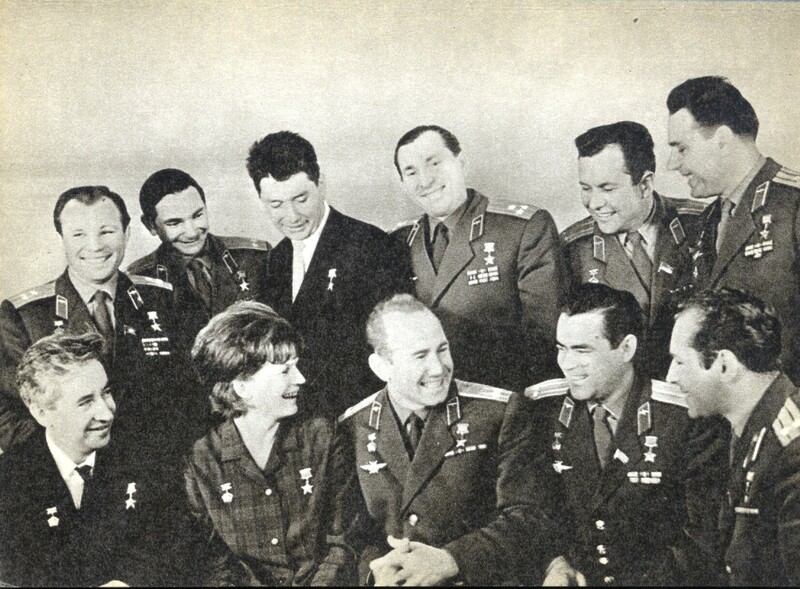 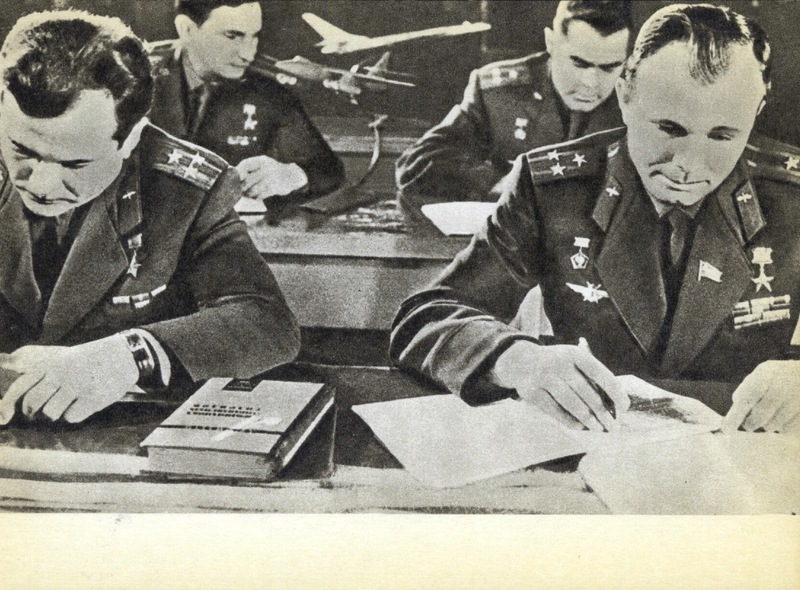 Furthermore, below are several articles of interest in relation to the 50th anniversary of the launch of Vostok 1. 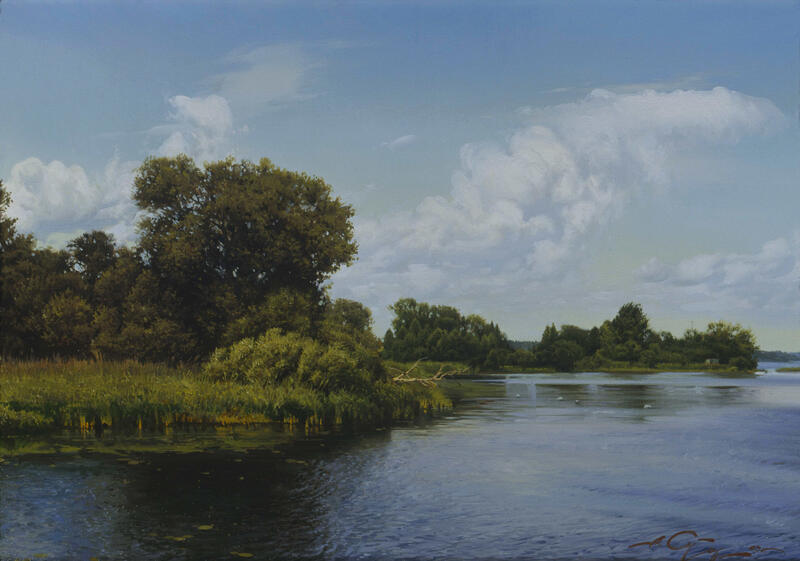 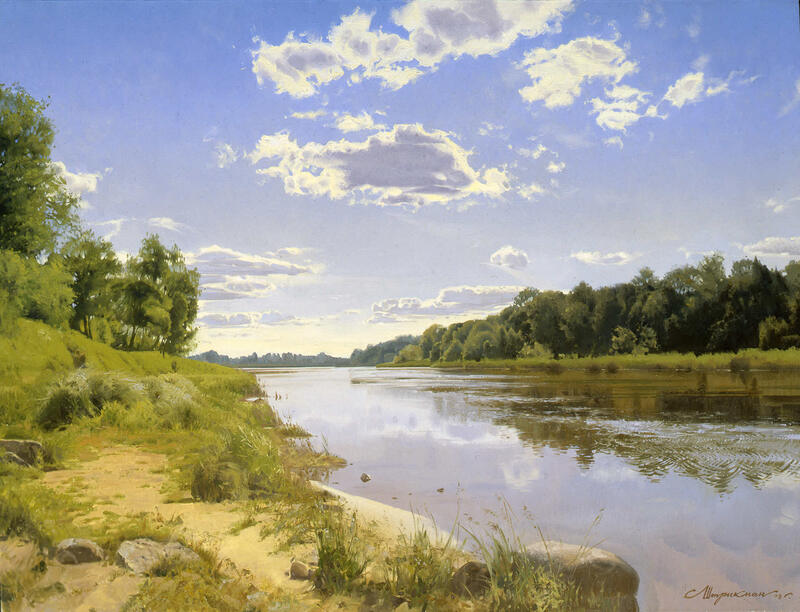 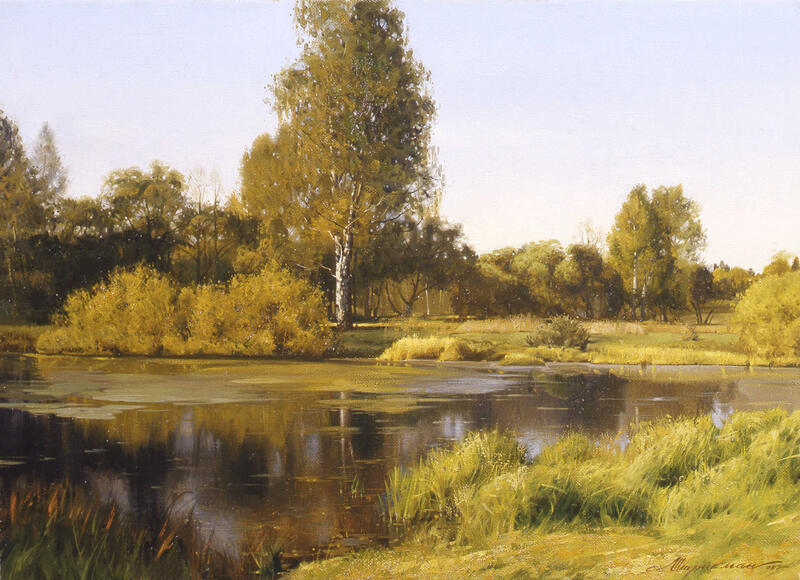 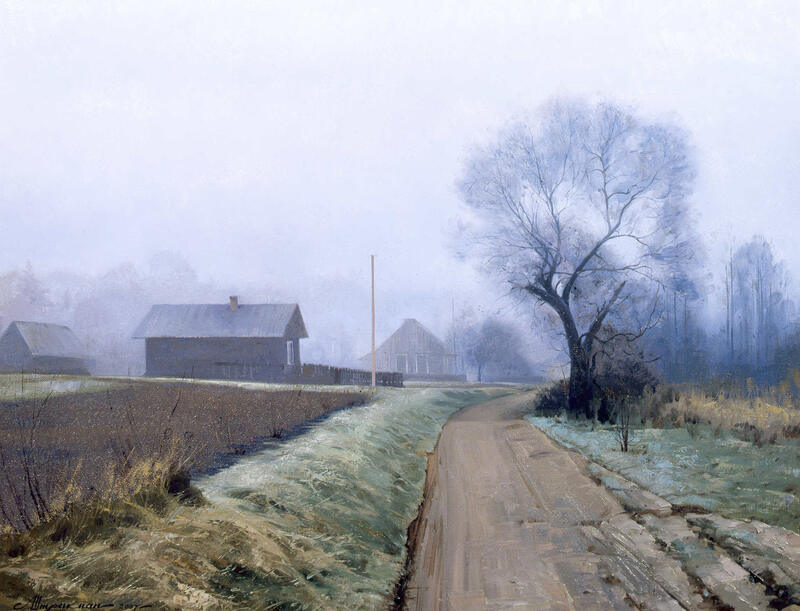 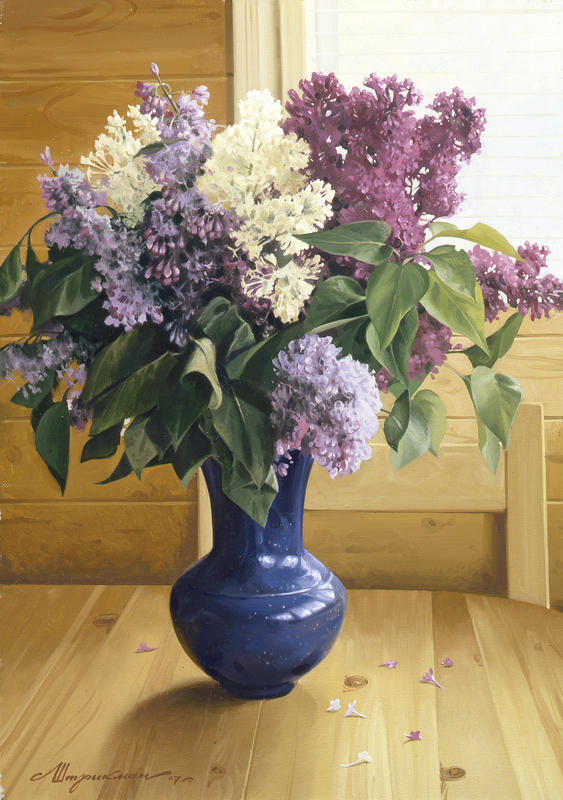 New Russian Classics (www.realartist.ru) is a website which seeks to promote and sell works by modern Russian artists in the genre of realism. 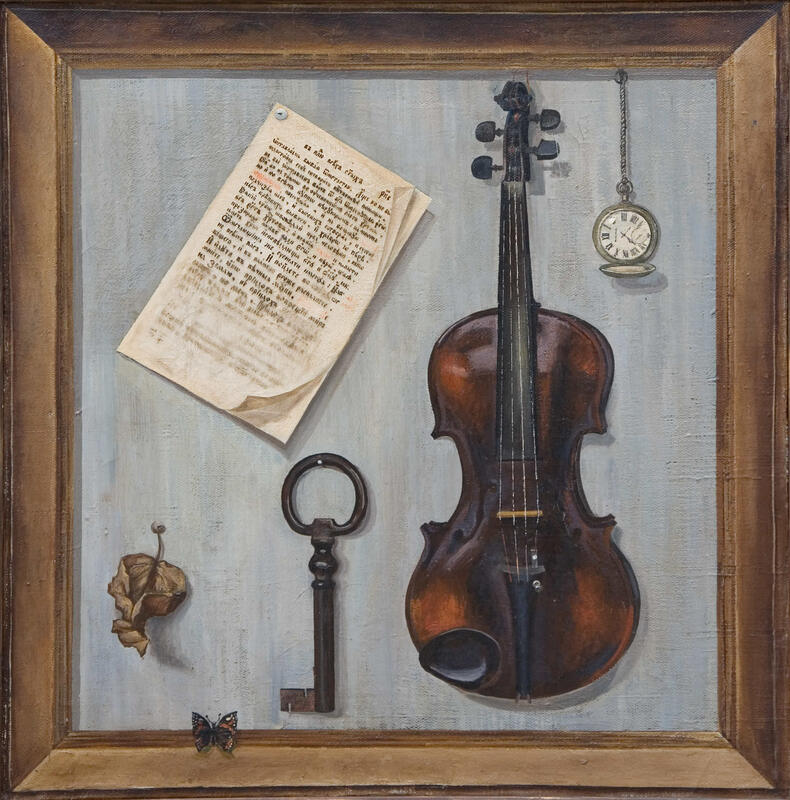 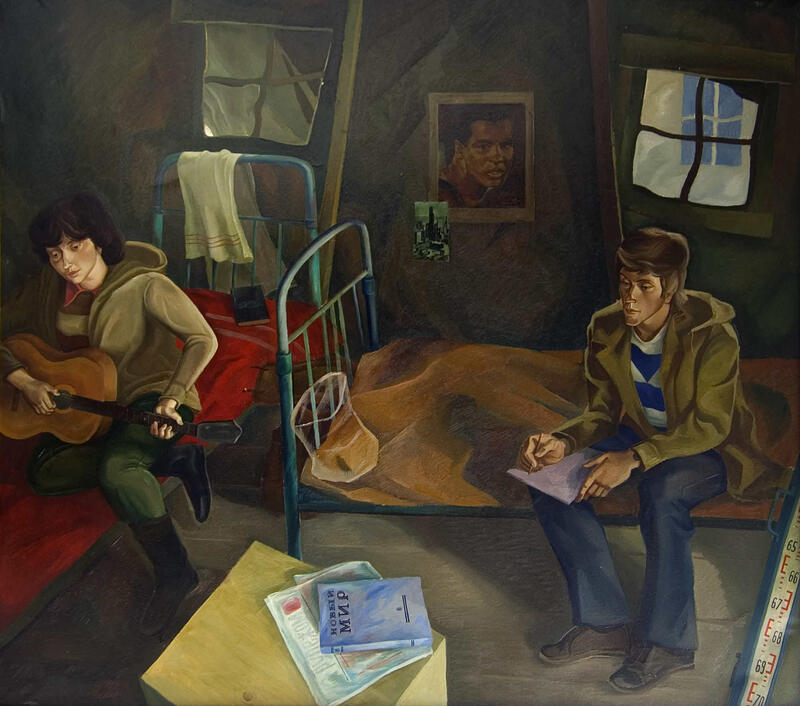 While the site doesn’t appear to have been updated since 2009, the paintings available on it are worth a look, the majority of which are shown in this post. 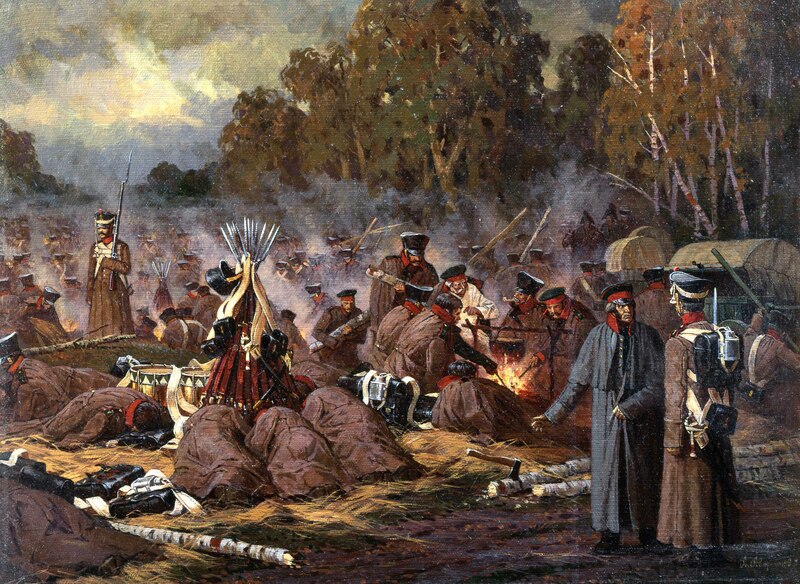 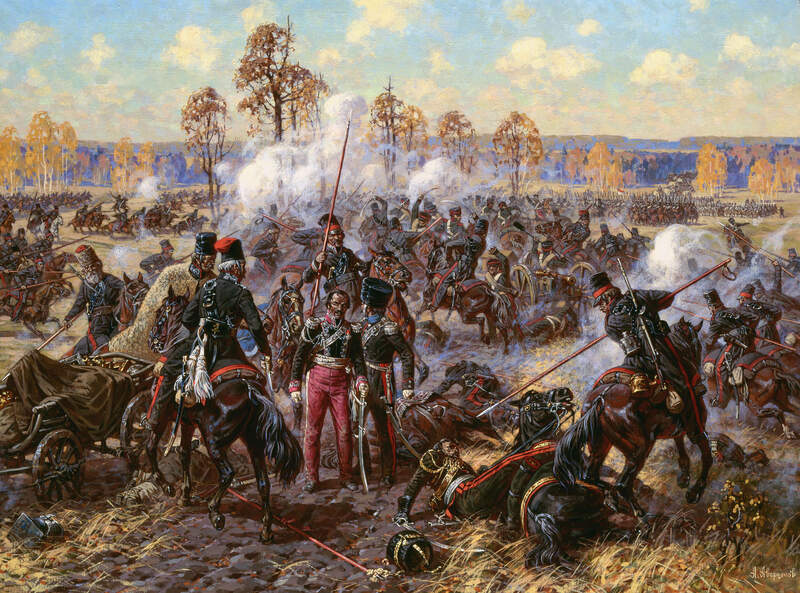 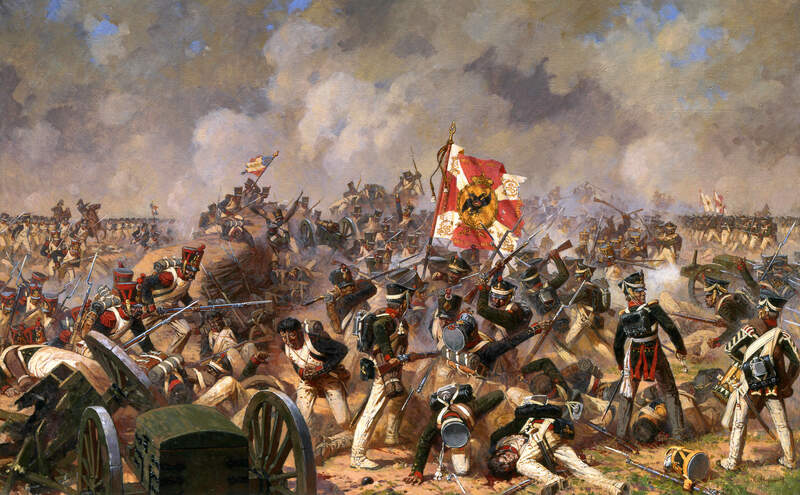 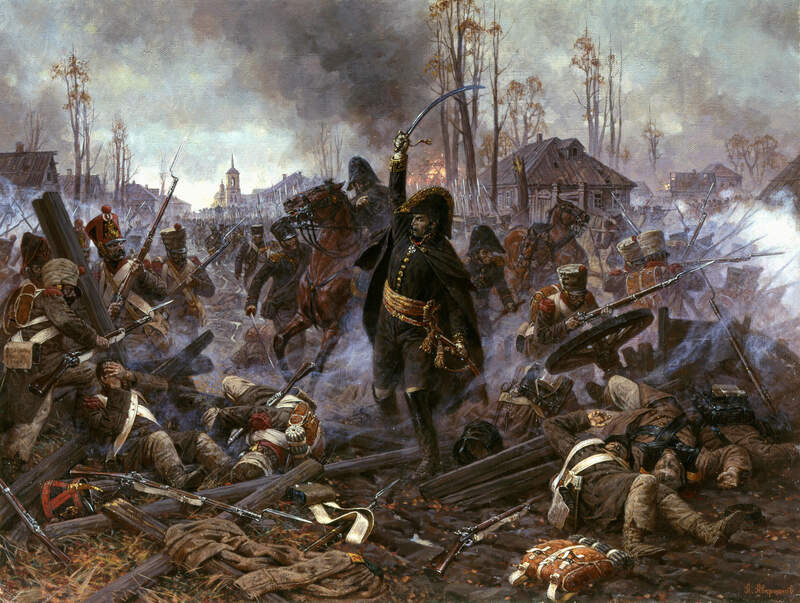 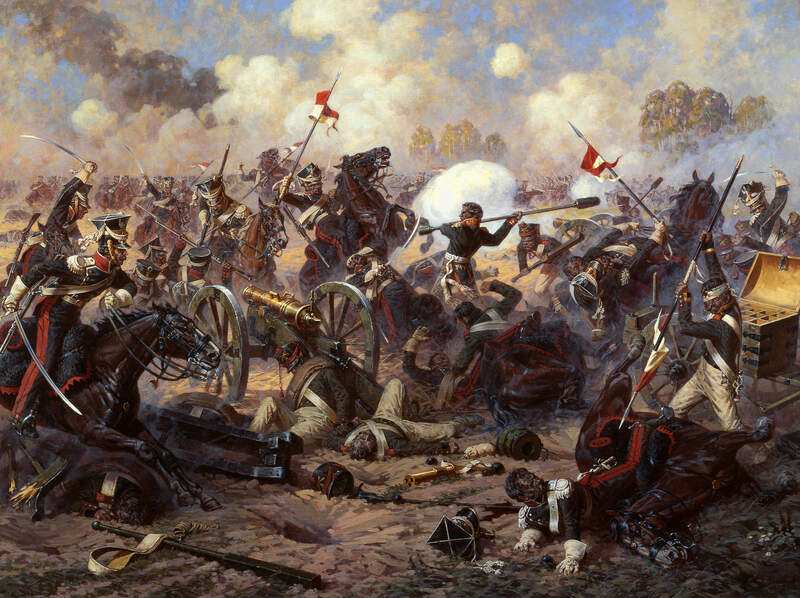 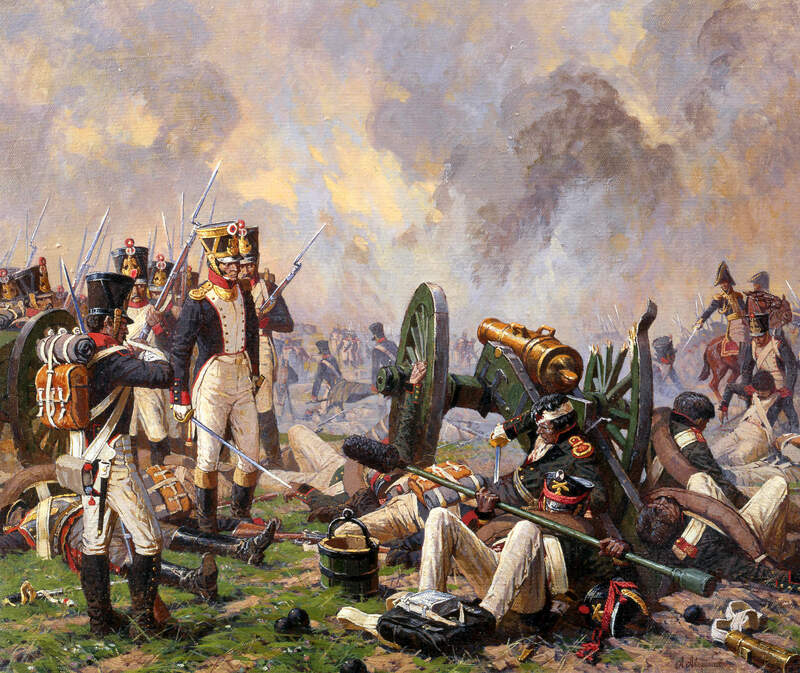 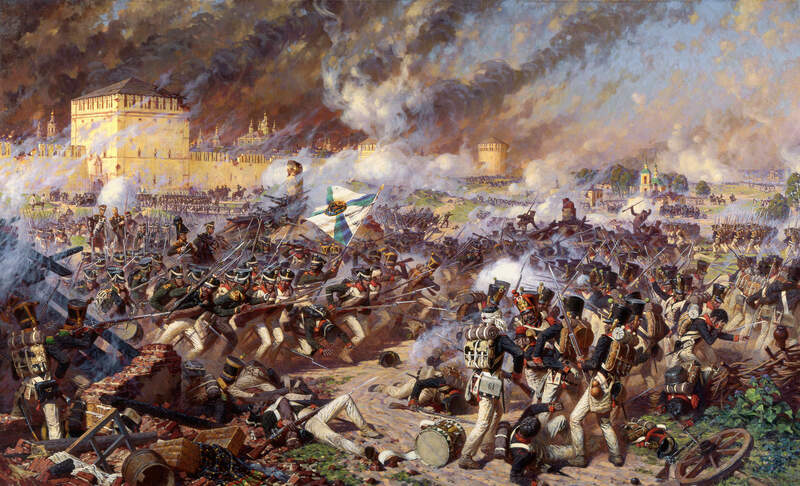 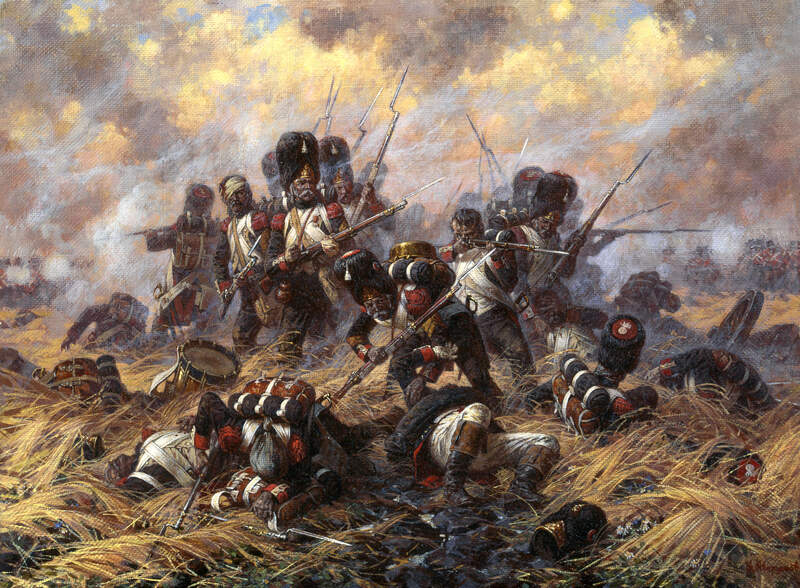 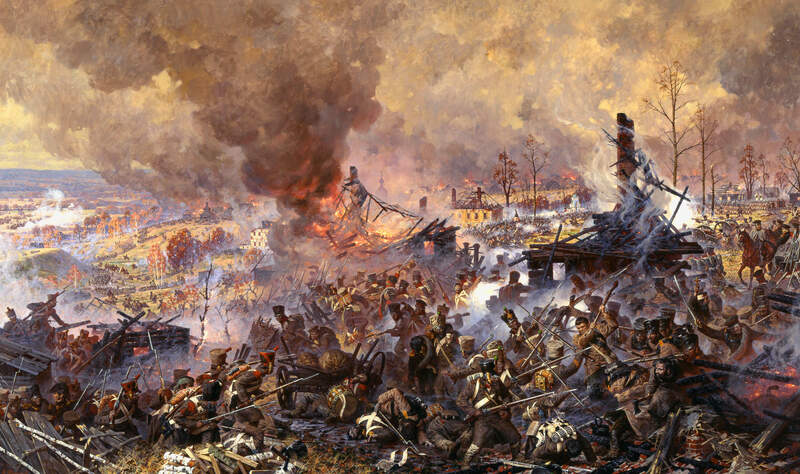 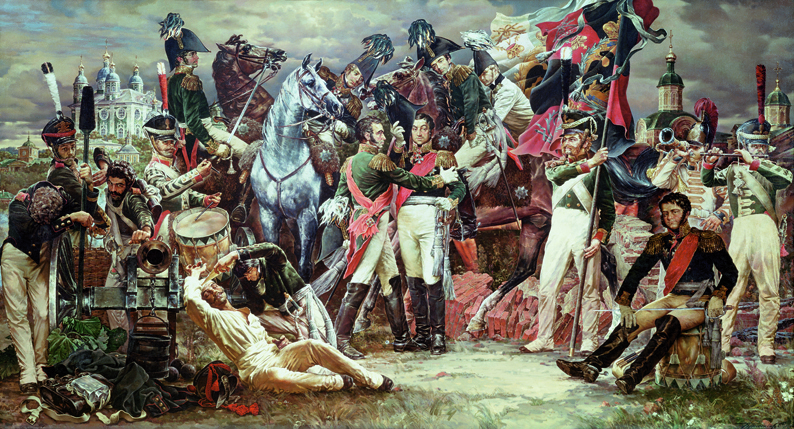 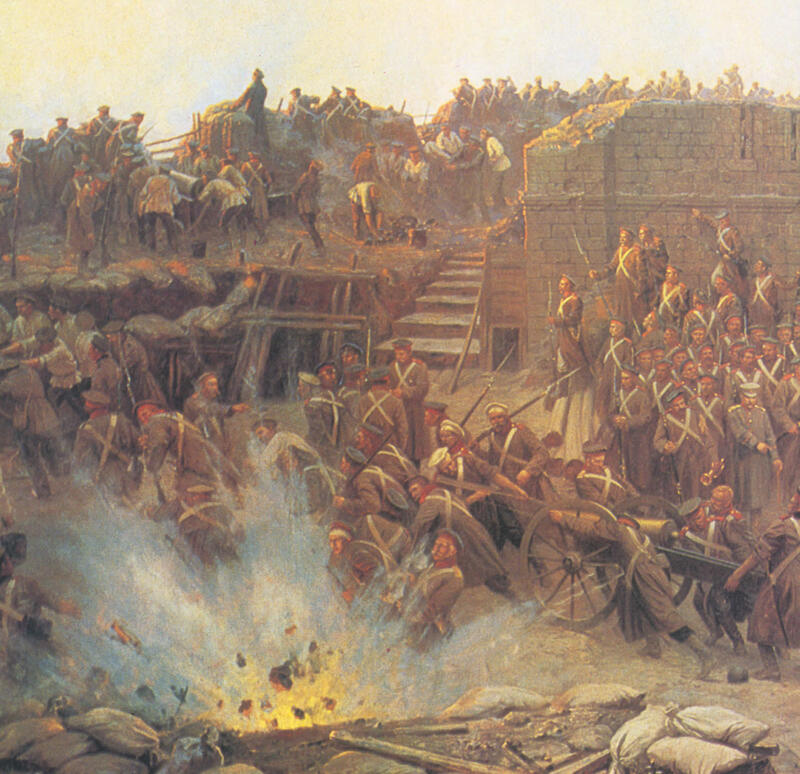 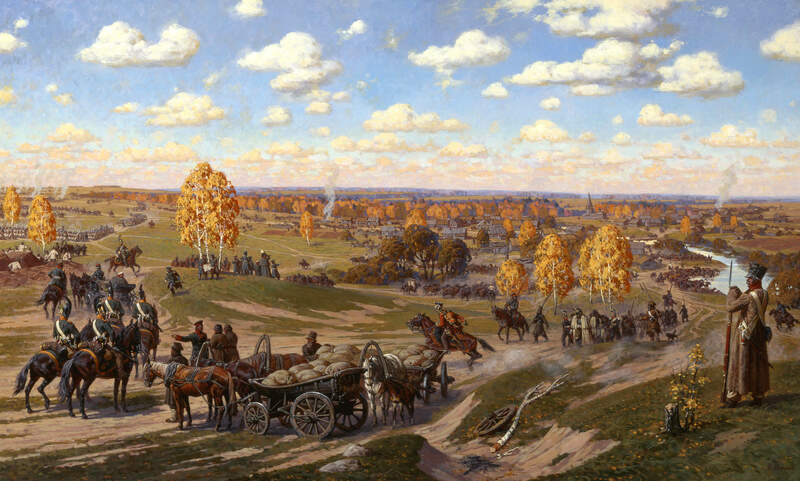 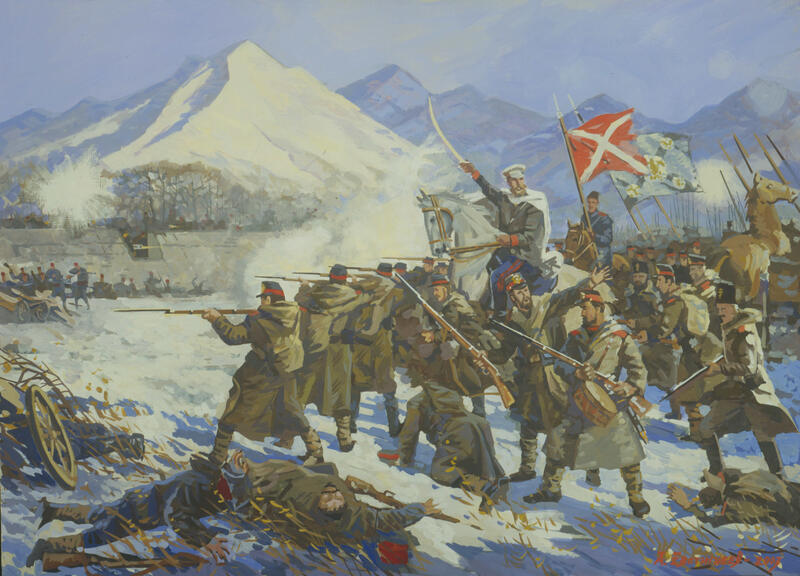 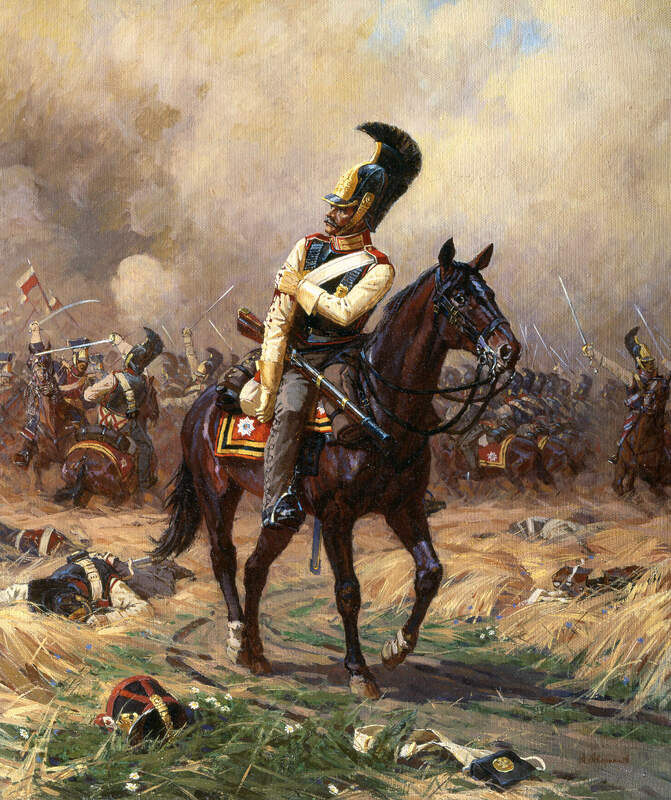 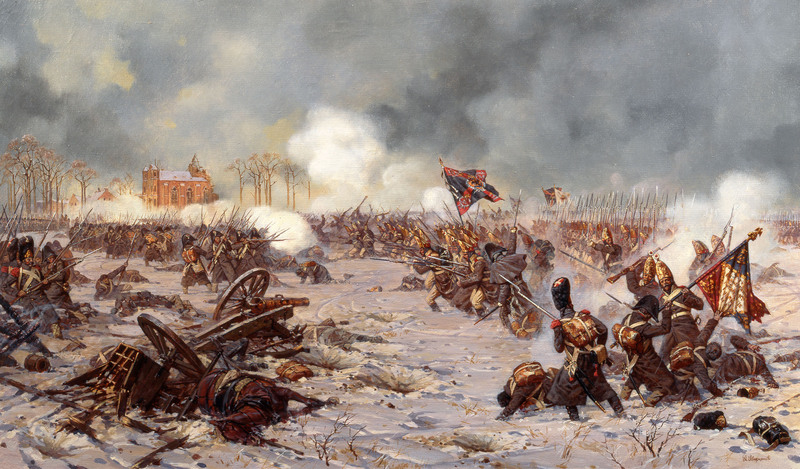 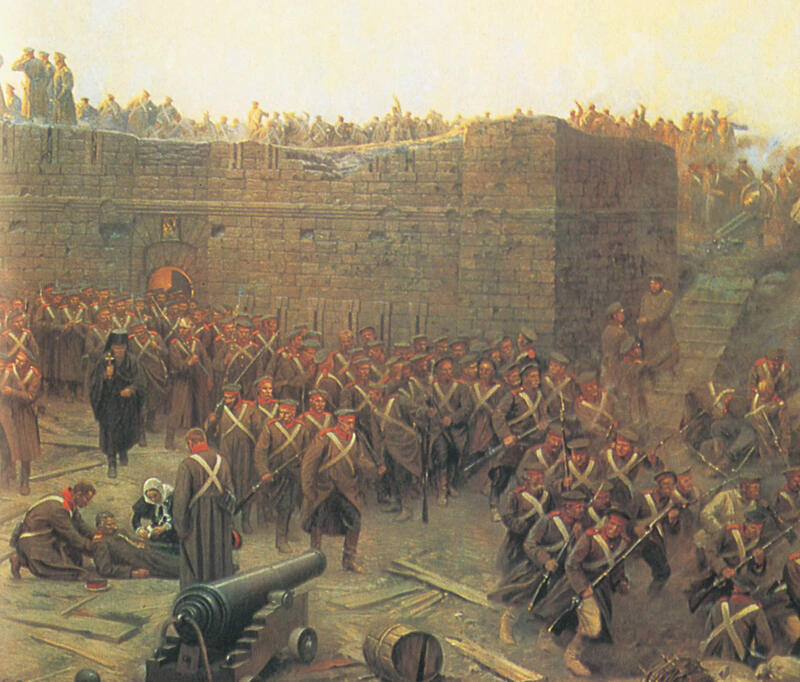 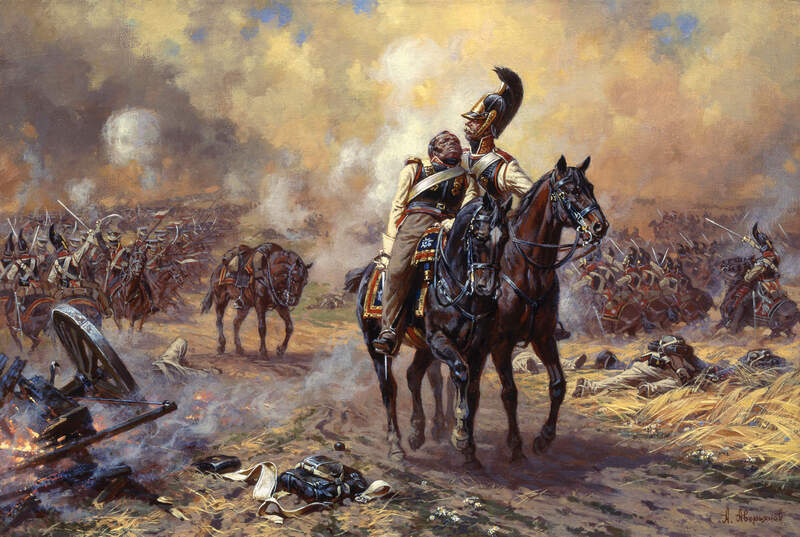 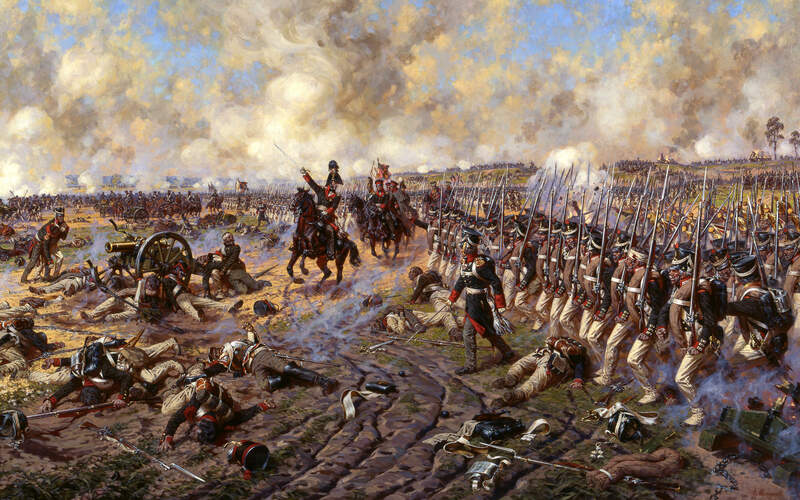 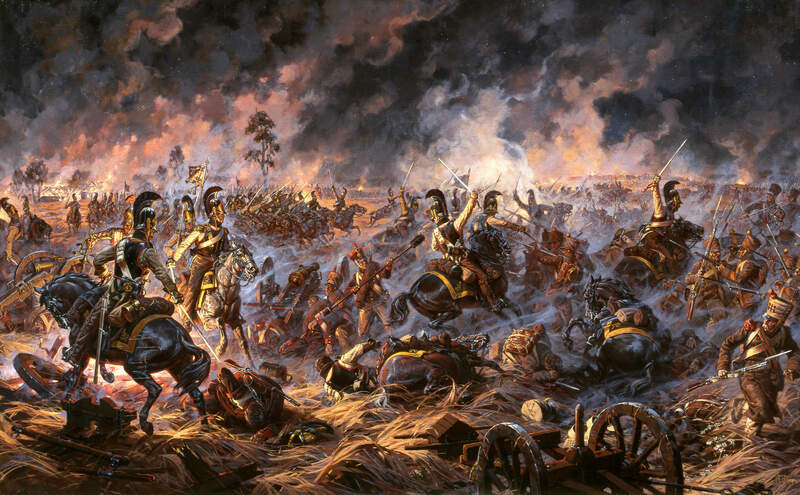 Aleksandr Yurievich Averyanov is an artist famous for painting Russian battle scenes such as the Battle of 1812. 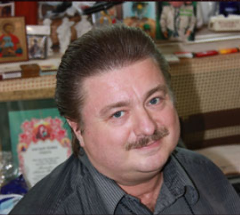 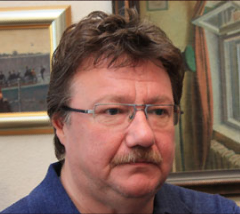 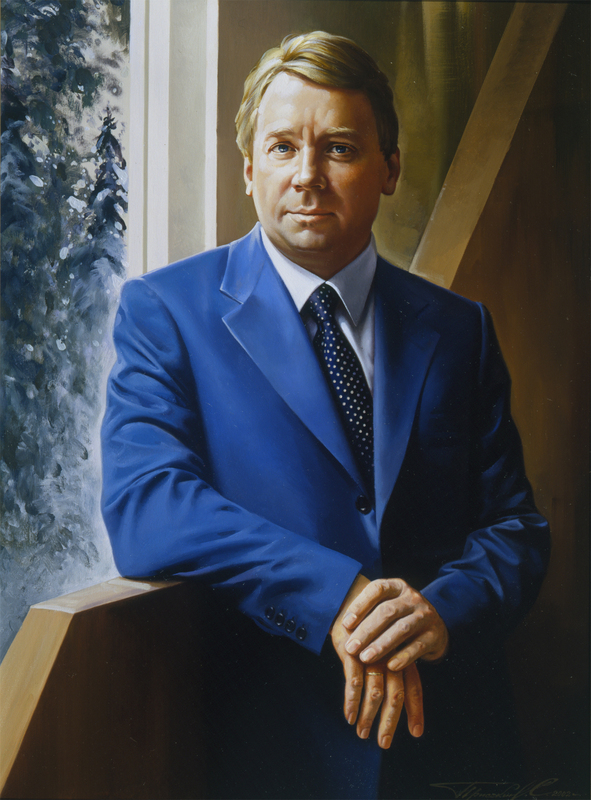 Born in 1950 in the town of Lopasnya, Averyanov graduated from the M.I. 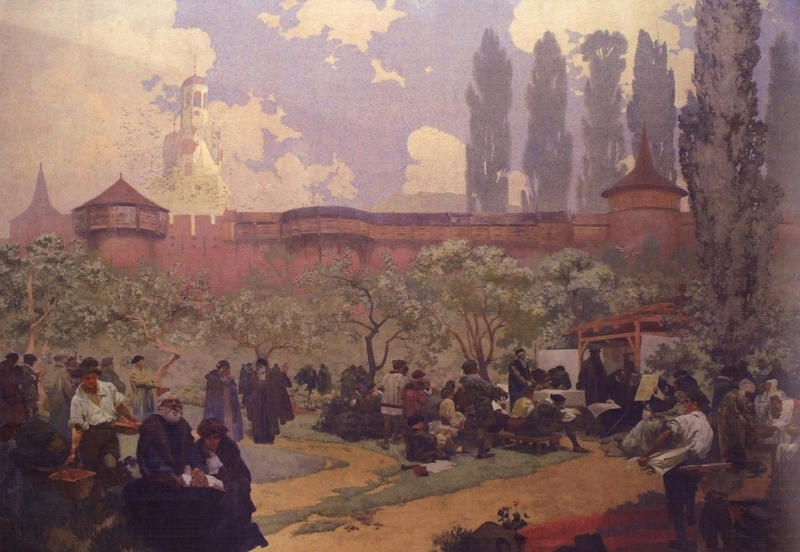 Kalinin Moscow School of Art. 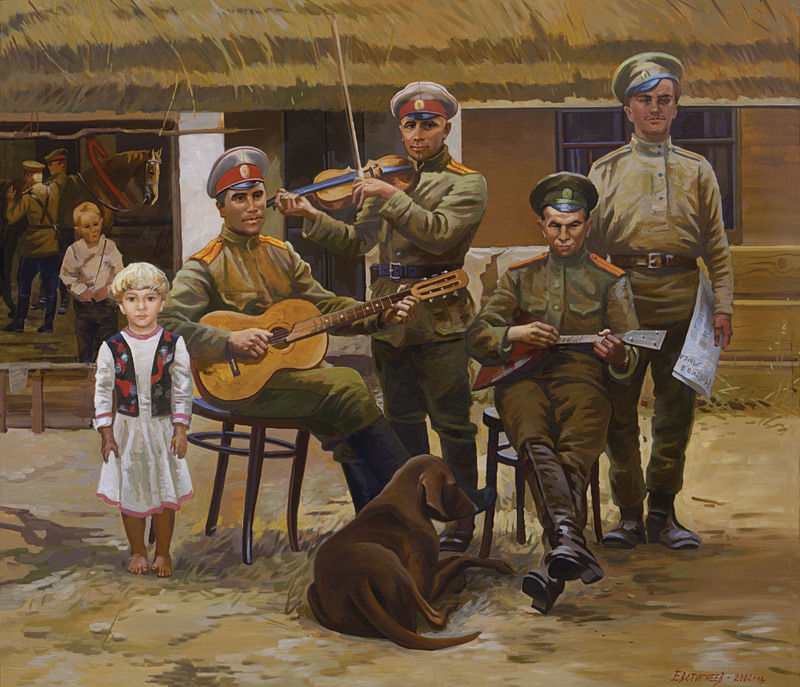 Inspired by the works of his teacher, Sergey Prisekin, Averyanov is known for his paintings displaying Russian scenes of war, placing him at the forefront of traditionalist art revival during the 90’s. 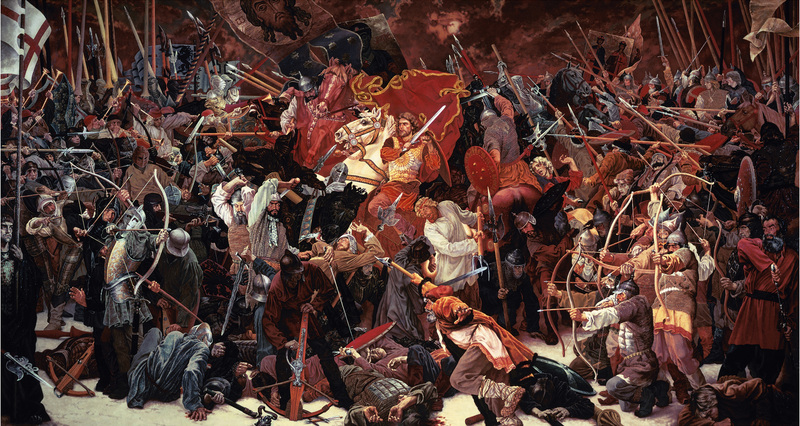 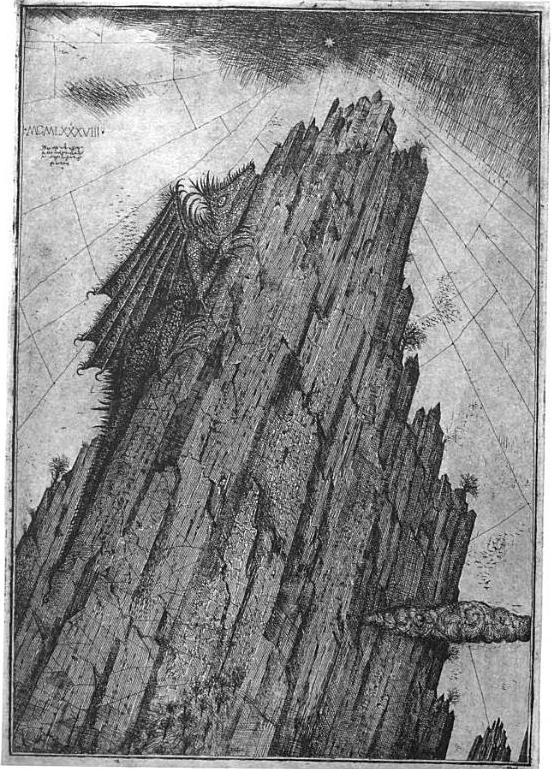 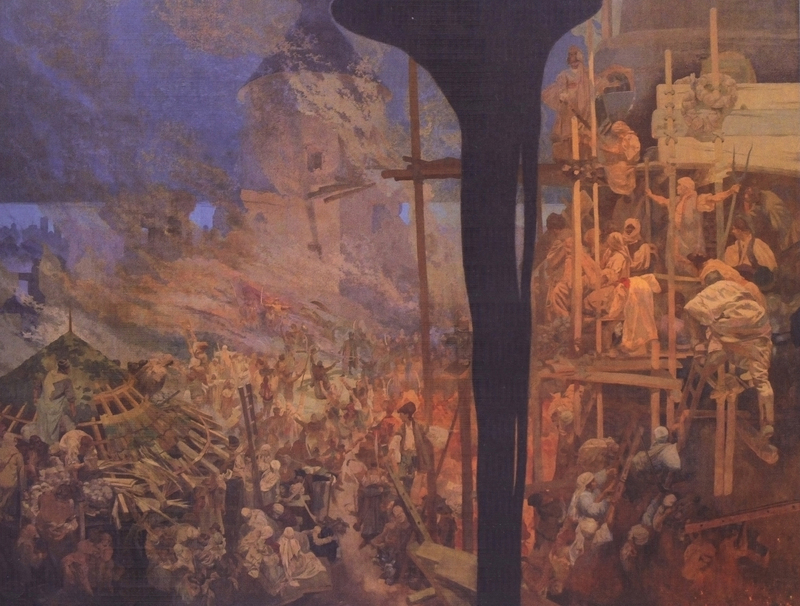 Averyanov’s simulataneous depiction of the chaos of war and nature of the lands in which they are set in have earned his works a place in several museums and private collections. 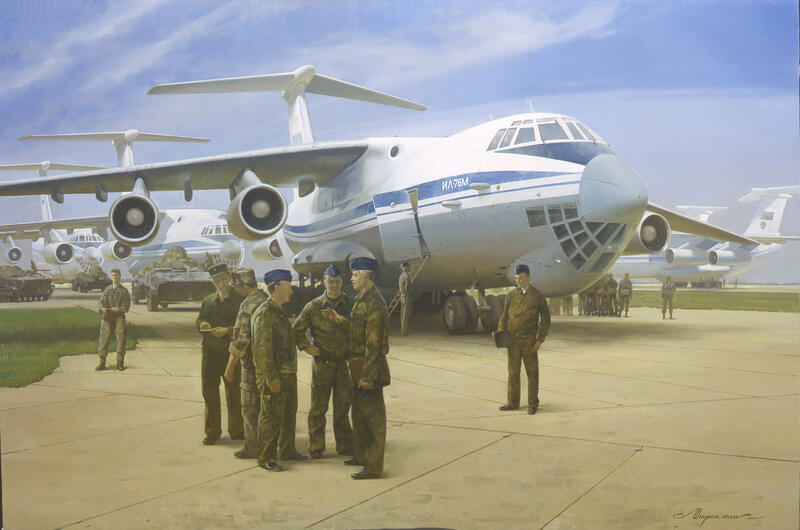 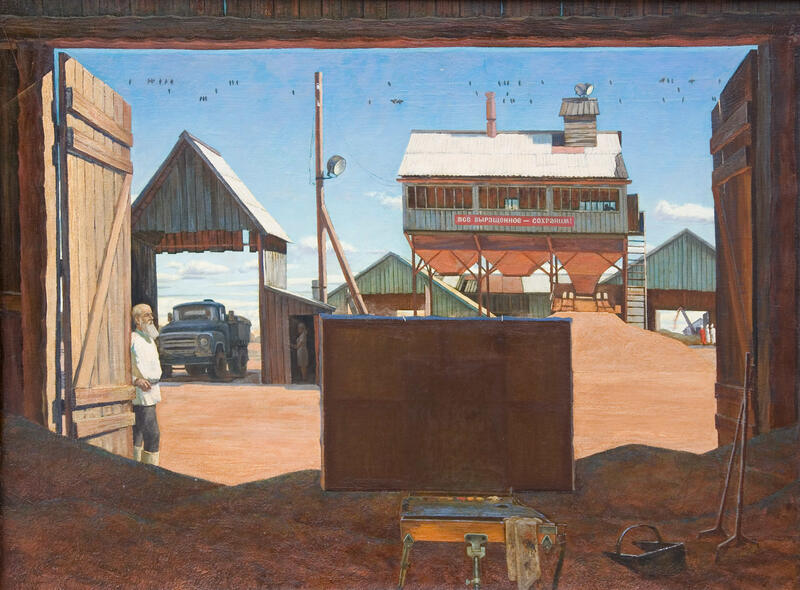 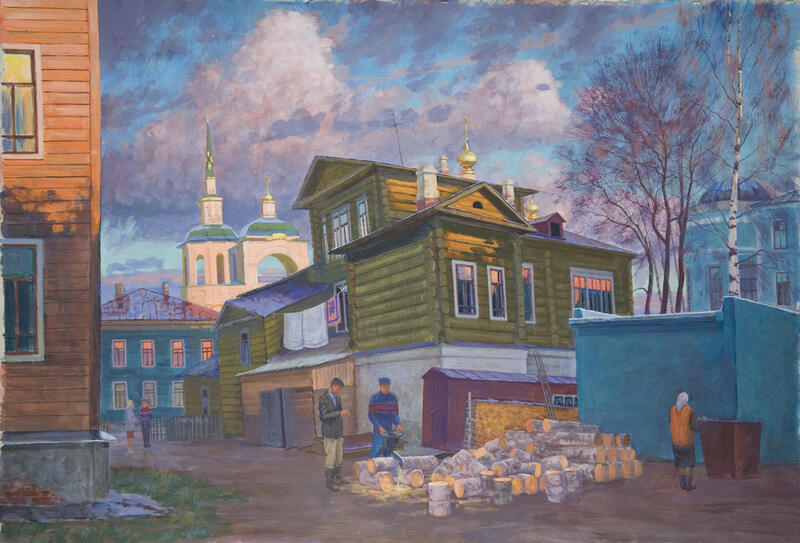 The site’s second artist is Aleksey Vitalievich Yevstigneyev, a landscape artist who depicts scenes of both the past and present. 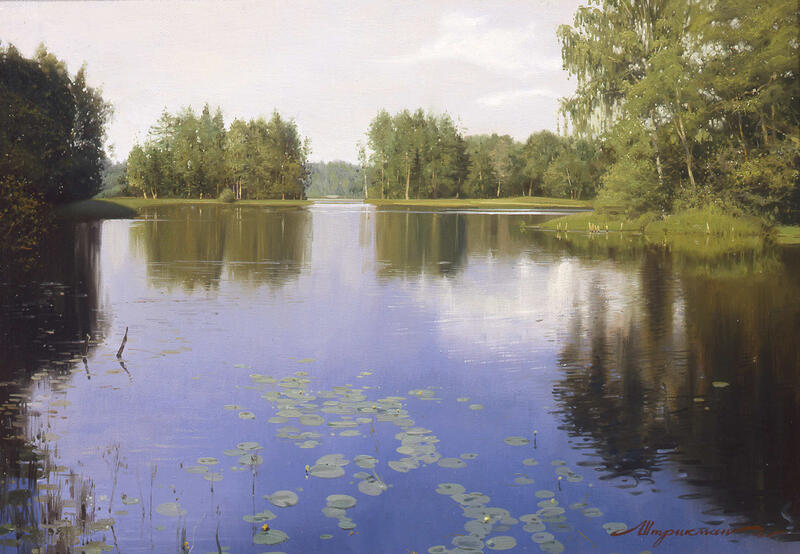 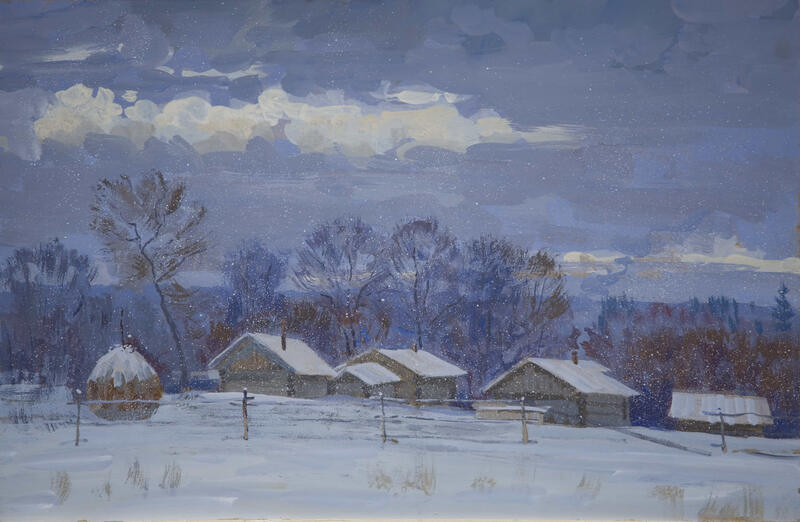 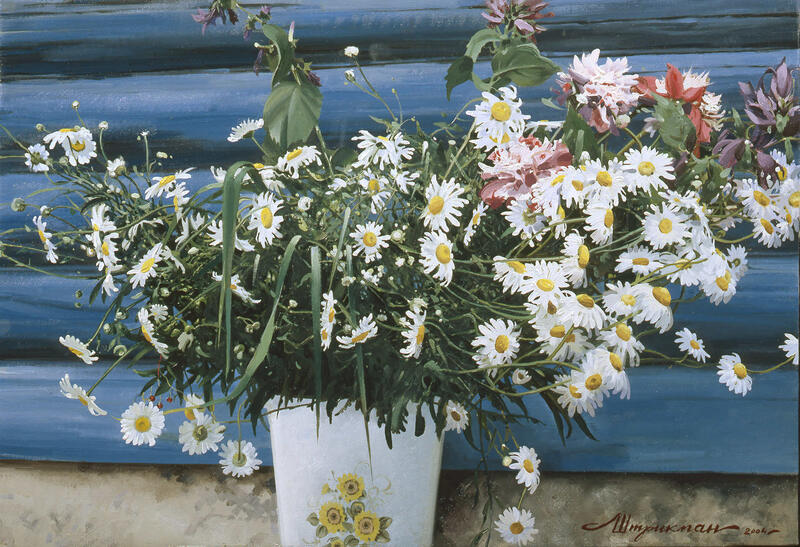 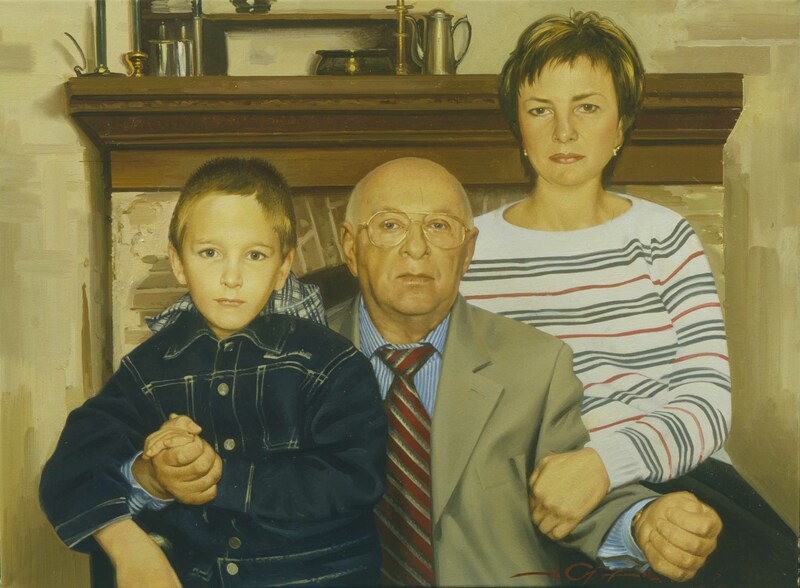 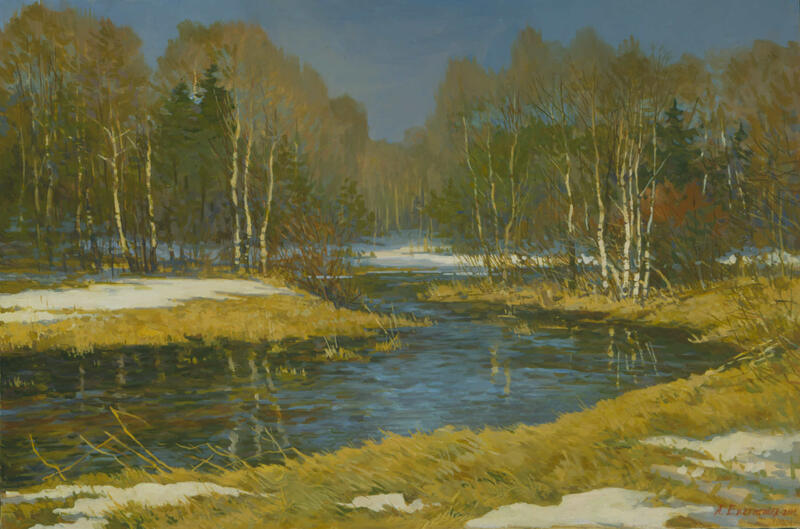 Born in Moscow on 1955, Yevstingneyev graduated from the Surikov Institute of Art and in 1984 became a member of the Union of Artists of the USSR and has been recognized by the American Biographic Society and the Russian Academy of Arts for his works. 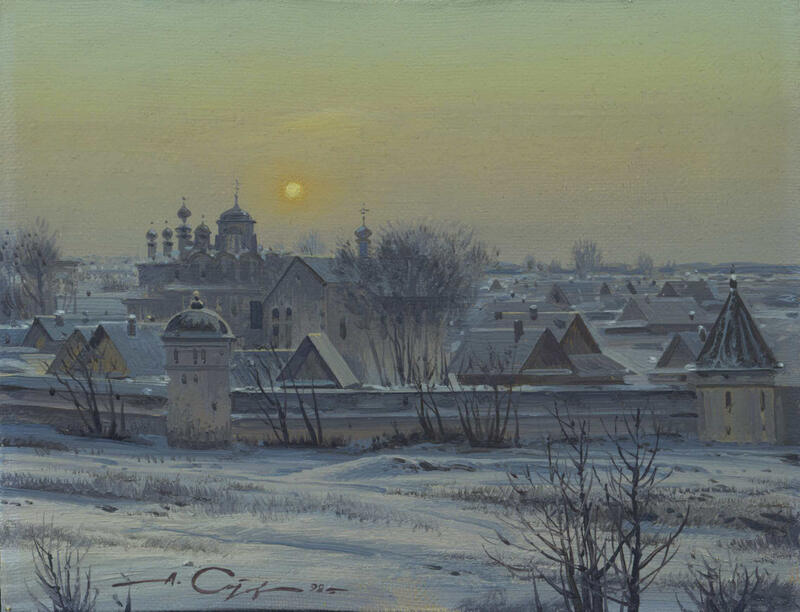 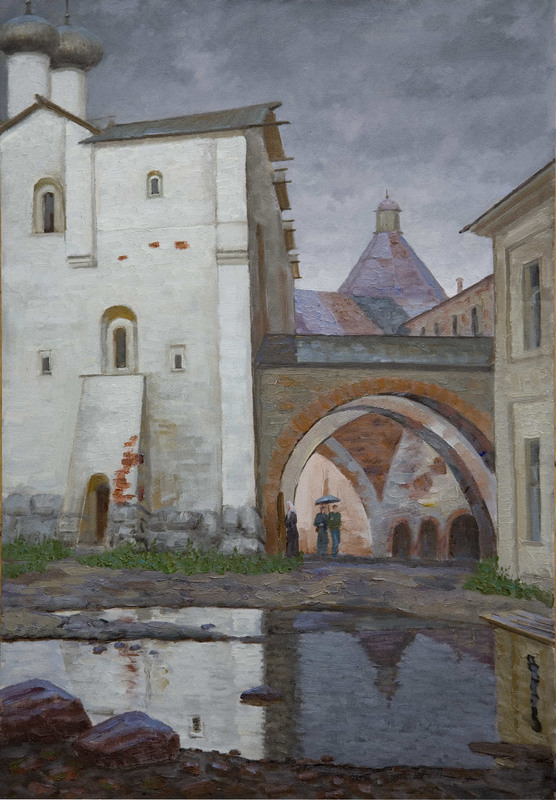 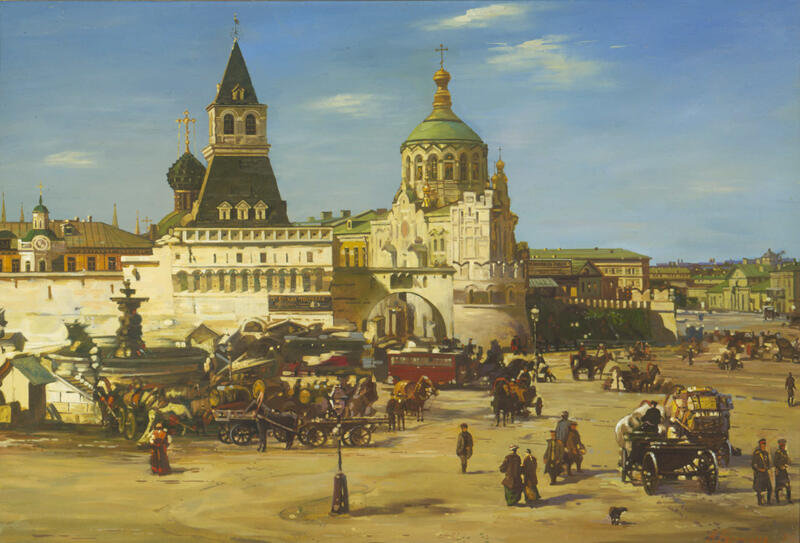 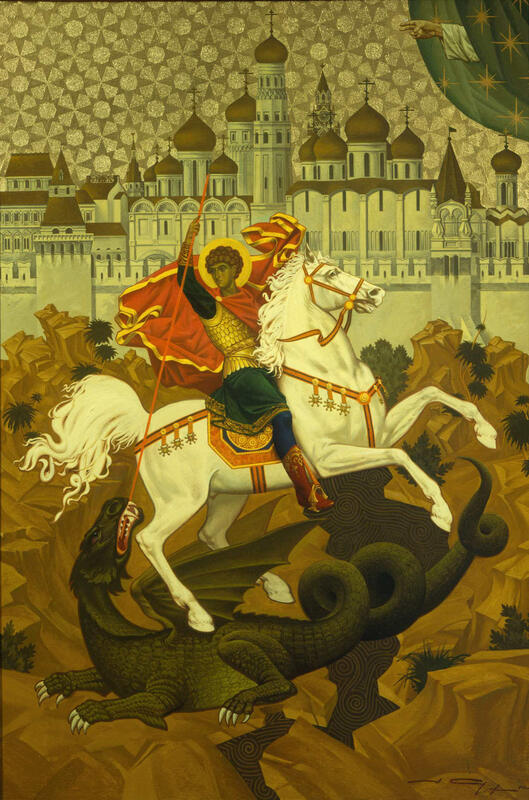 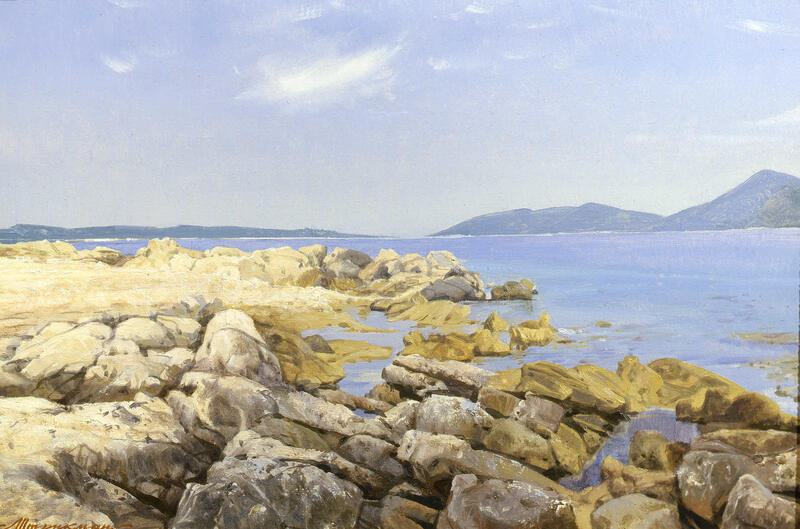 the majority of Yestigneyev’s works depict various places of Europe he has traveled to, although he has made a number of historic works as well. 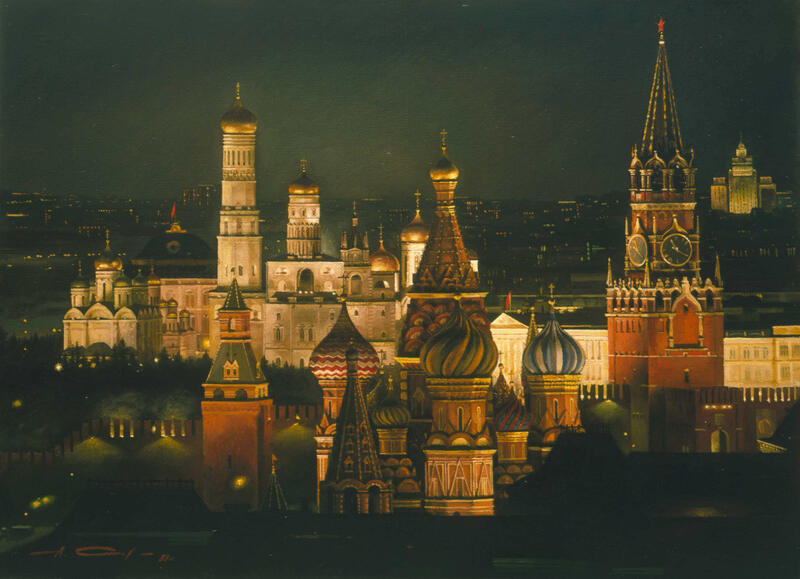 Vasiliy Dmitrievich Yezdakov was born on 1929 and was a member of the Union of Artists of the Soviet Union. 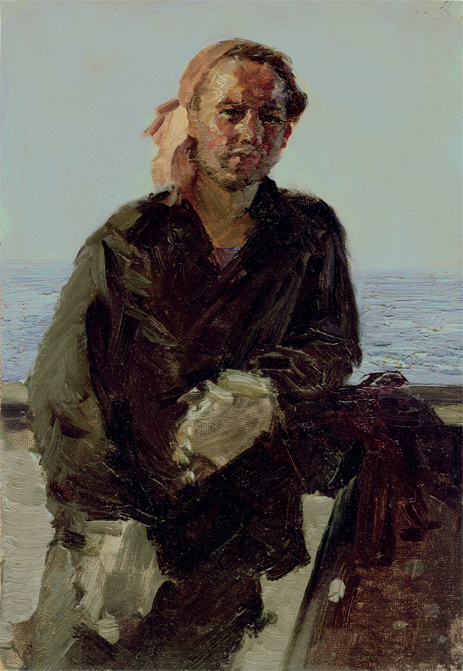 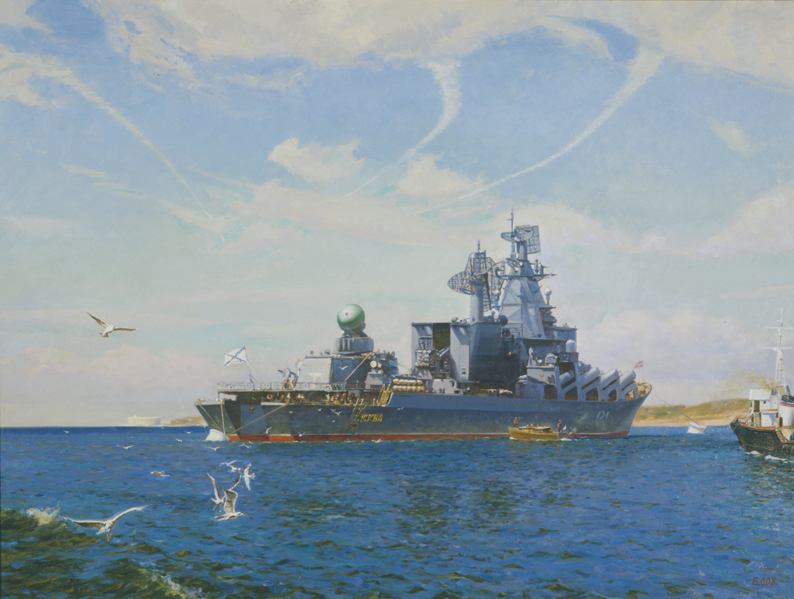 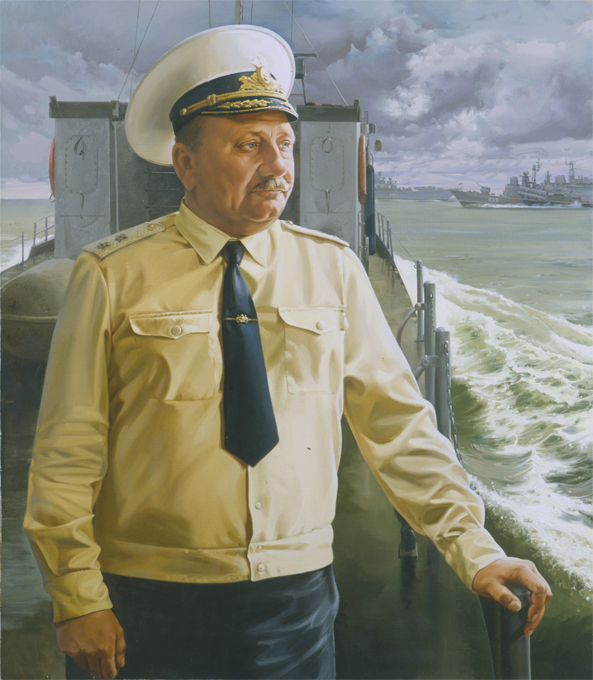 Vasiliy Yezdakov’s works are scenes of naval and fisherman life, possibly leading him to become an influence on his son, Oleg who is also featured on the New Russian Classics site. 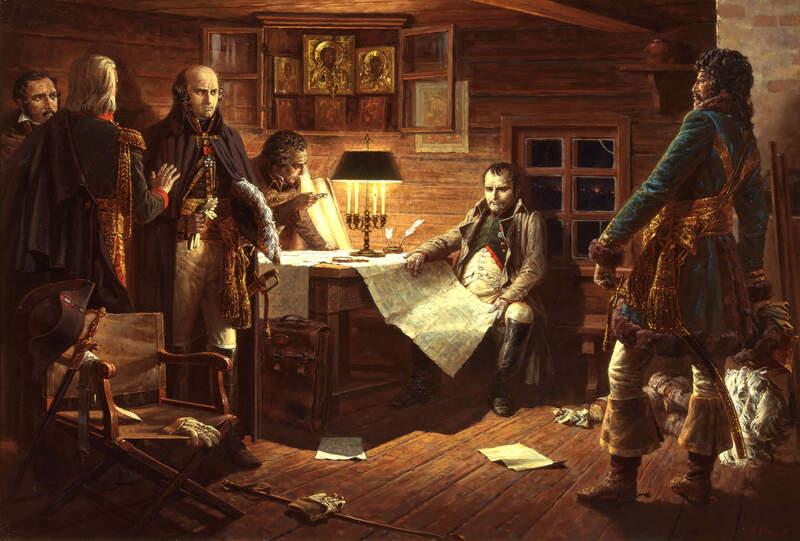 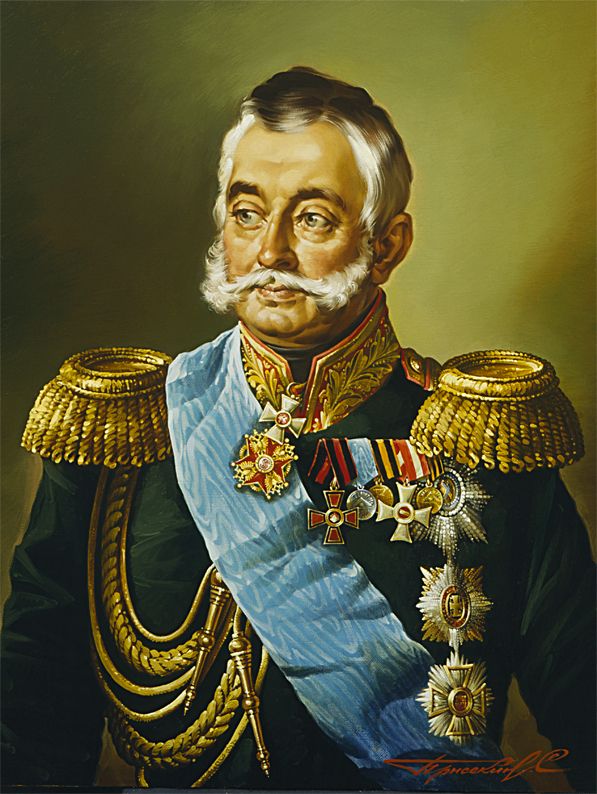 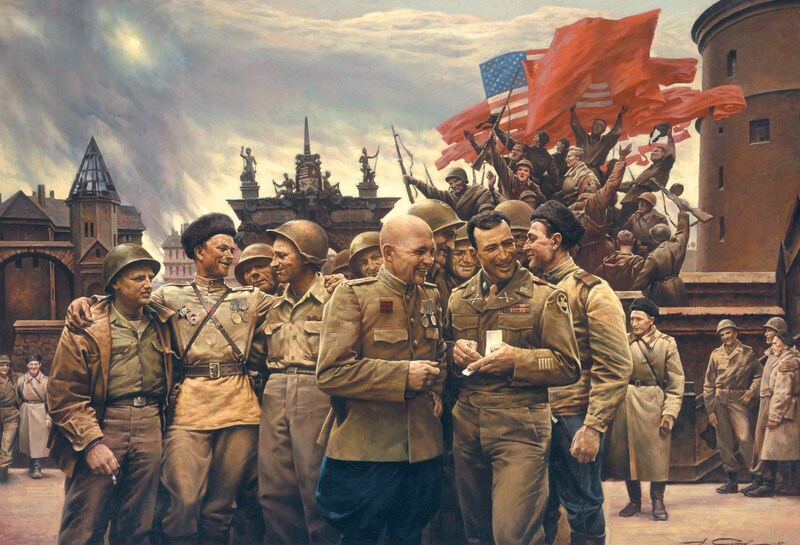 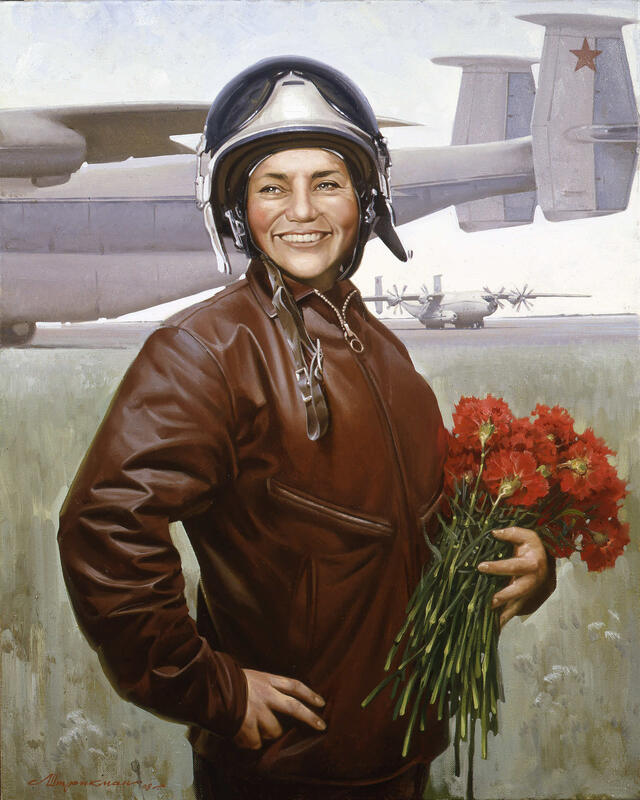 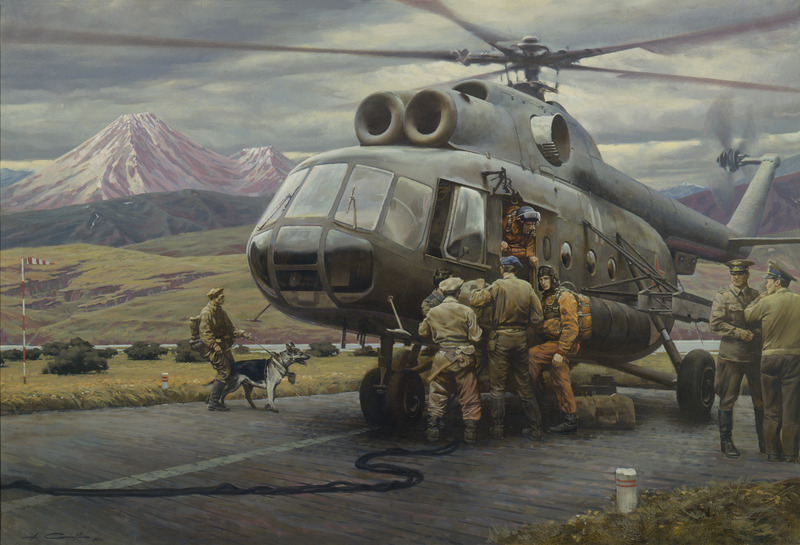 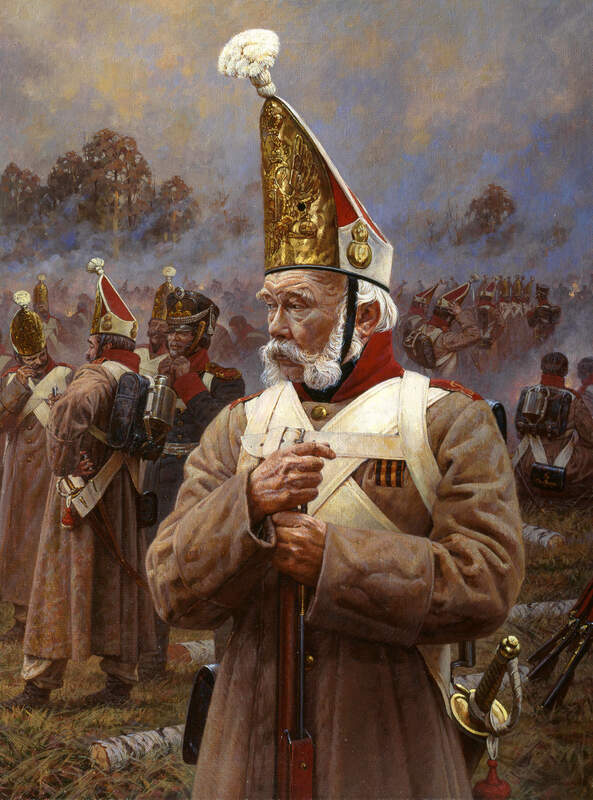 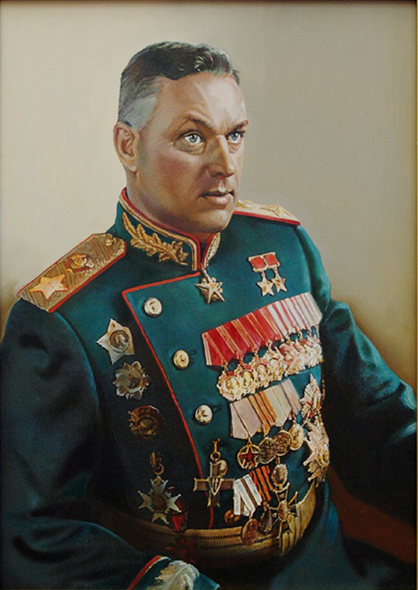 Oleg Vasilievich Yezdakov, a painter who has created works ranging from landscapes to portraits of military officials. 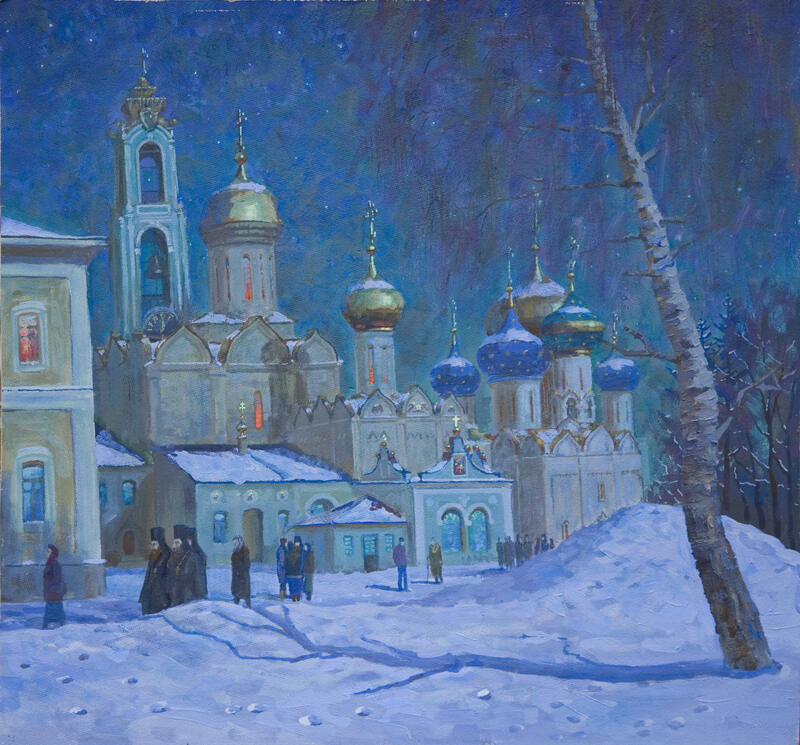 Born on 1959 to a family of artists in Moscow, Yezdakov also became a member of the Union of Artists of the USSR after graudating from the Surikov institute of Art. 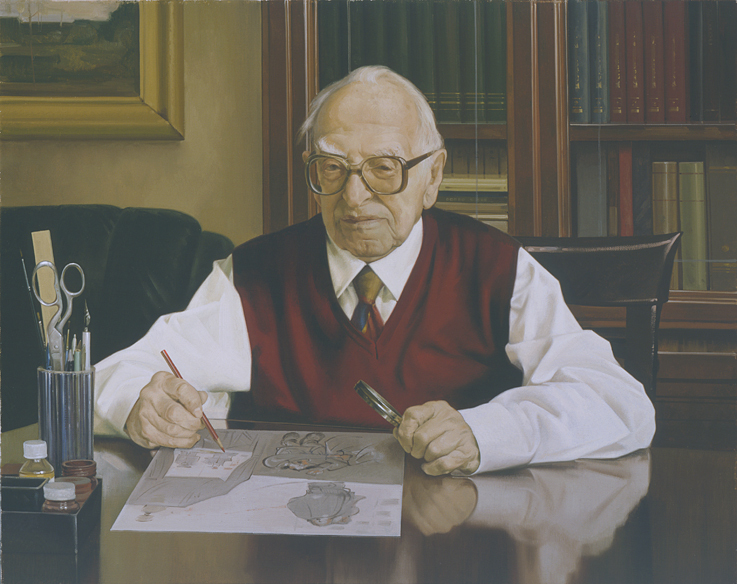 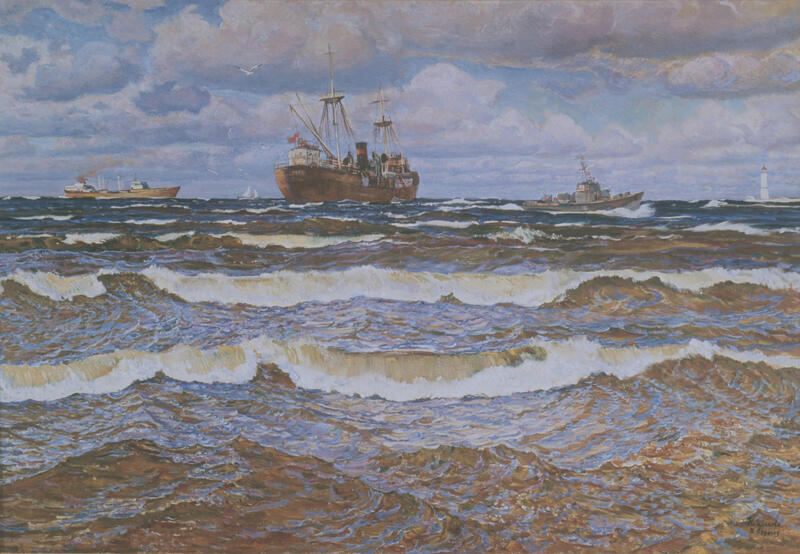 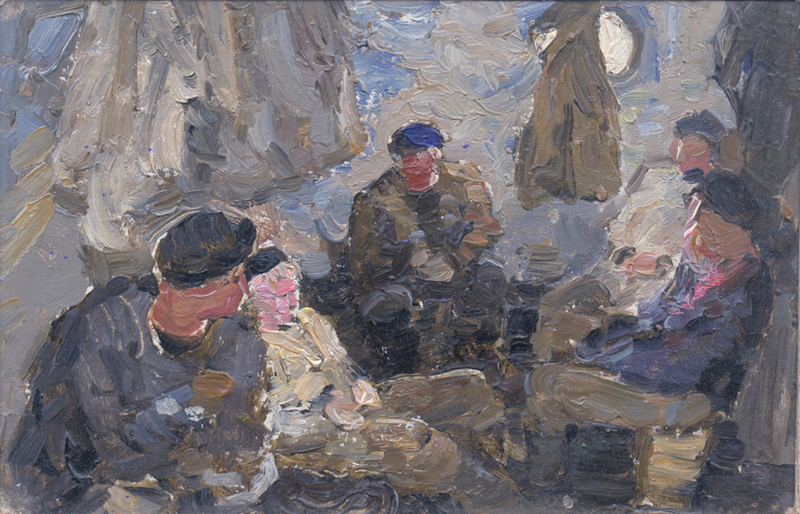 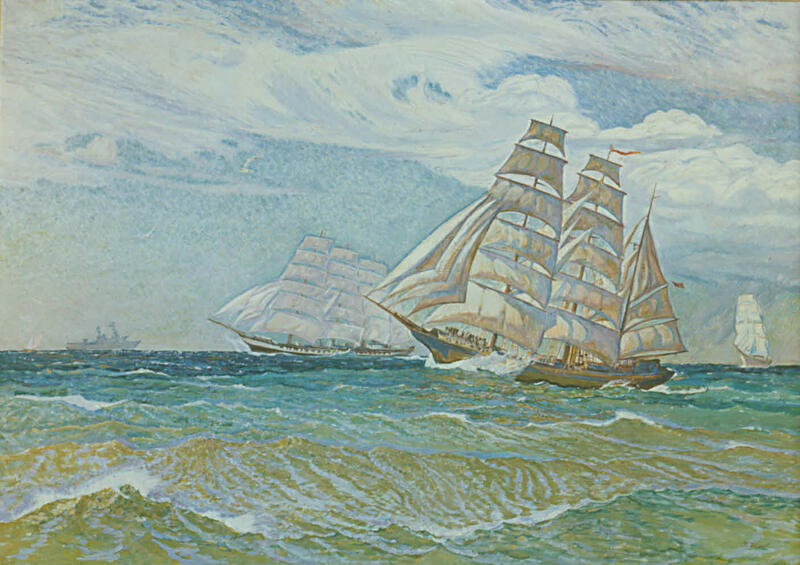 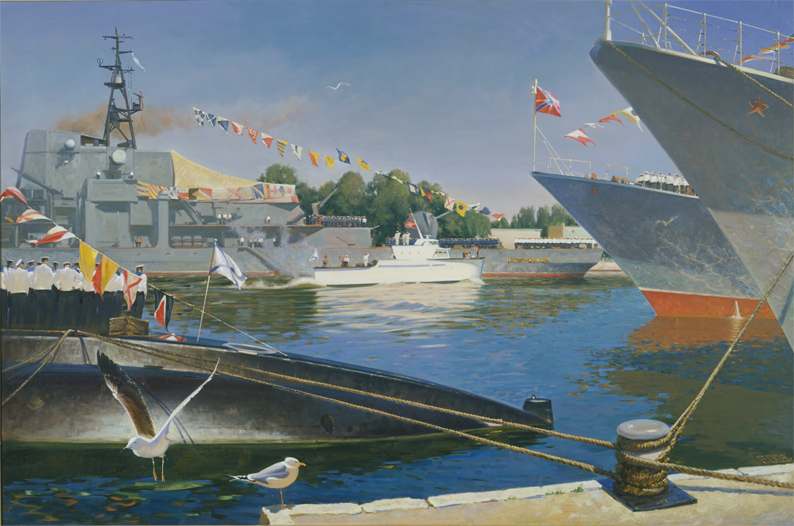 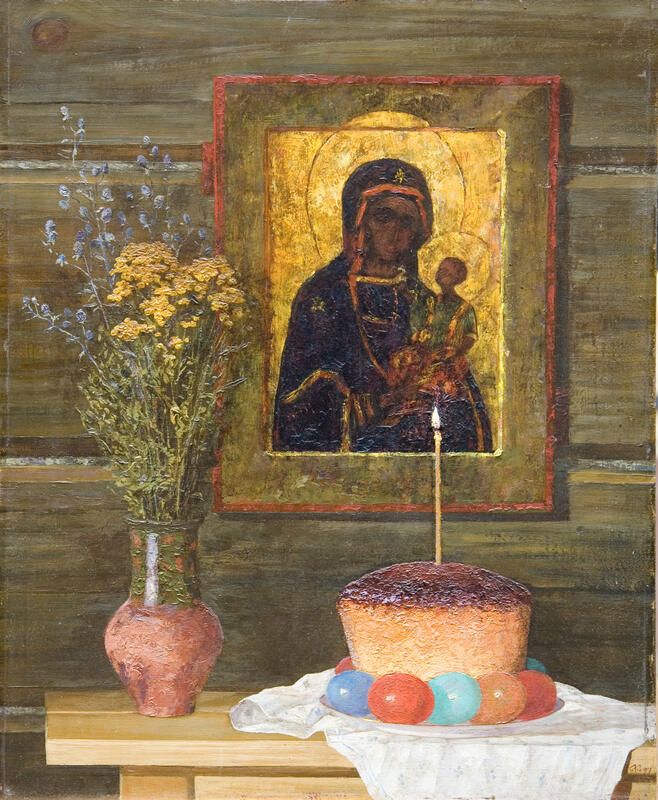 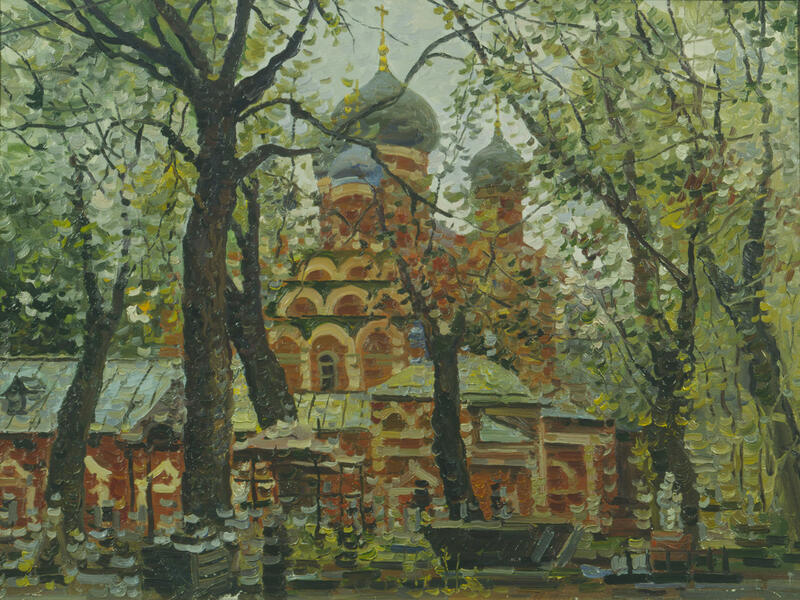 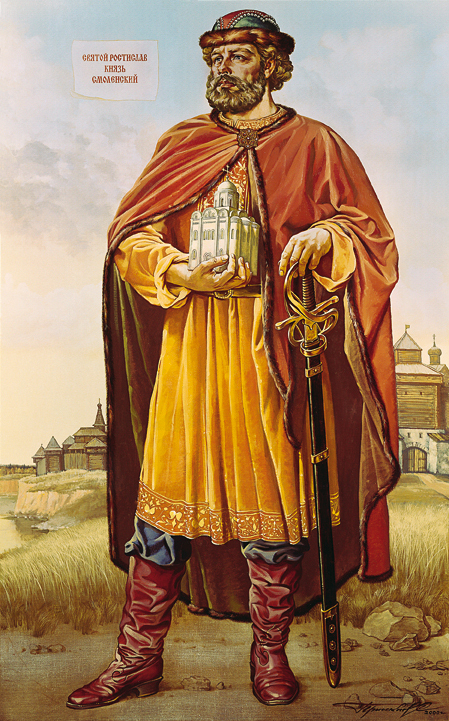 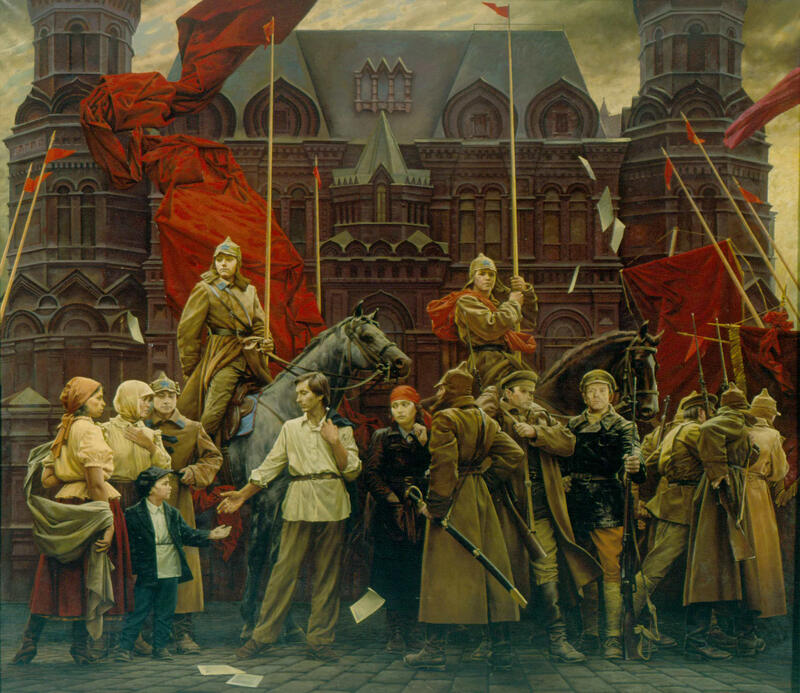 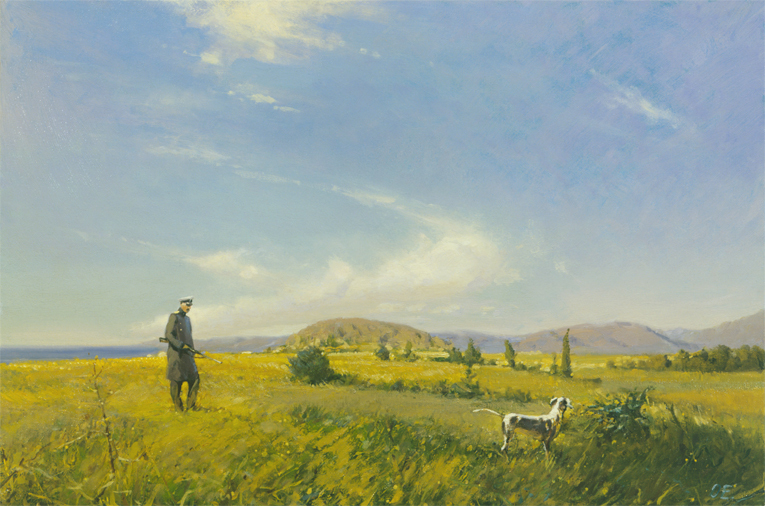 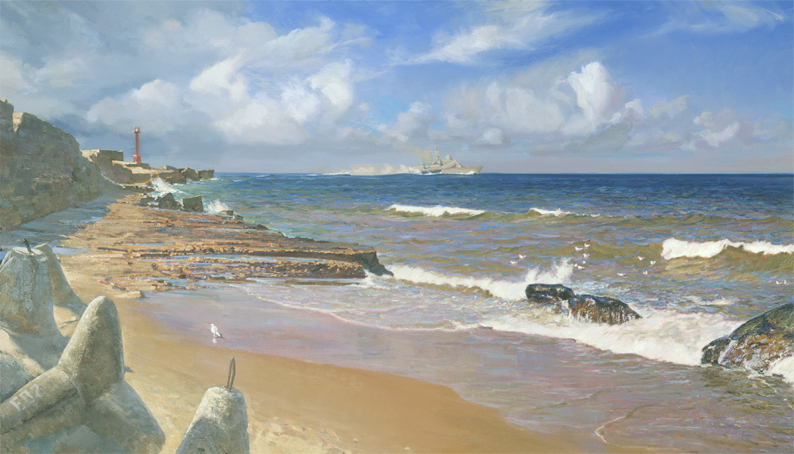 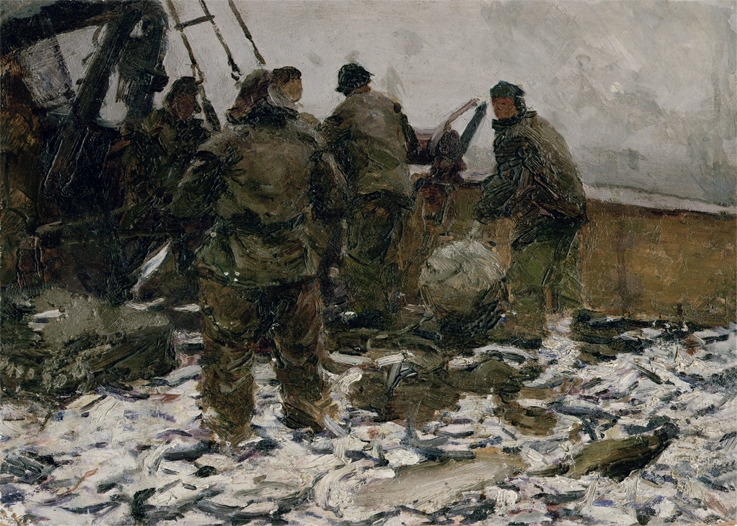 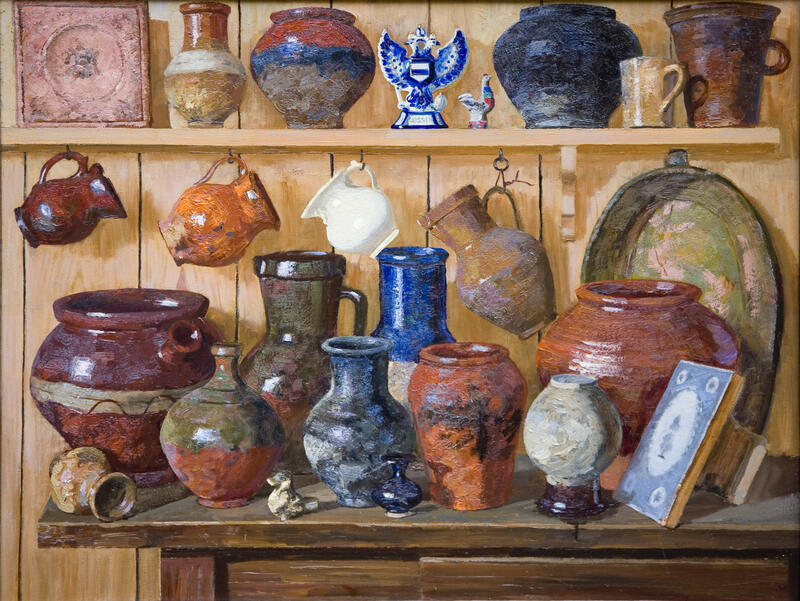 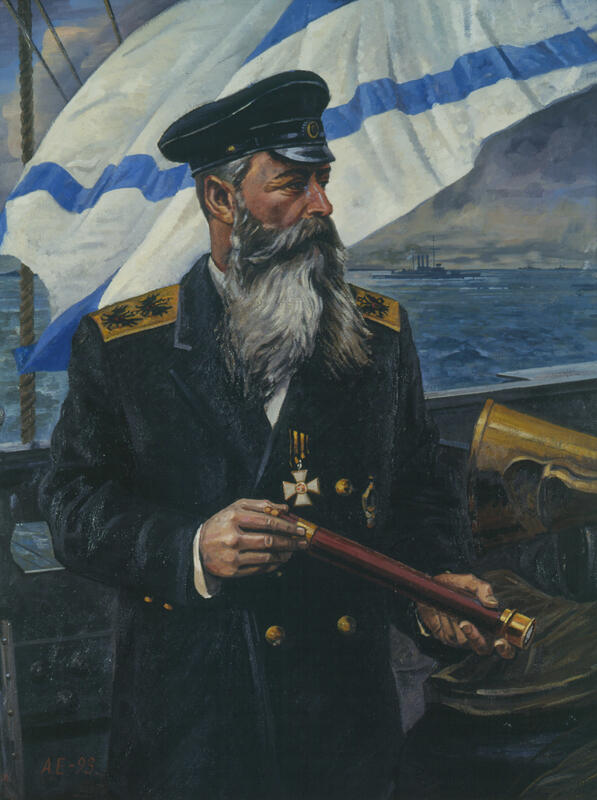 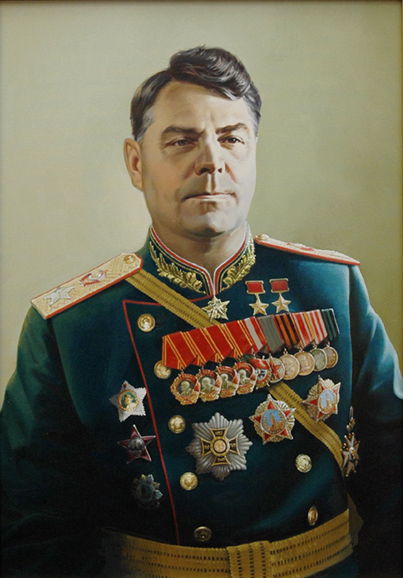 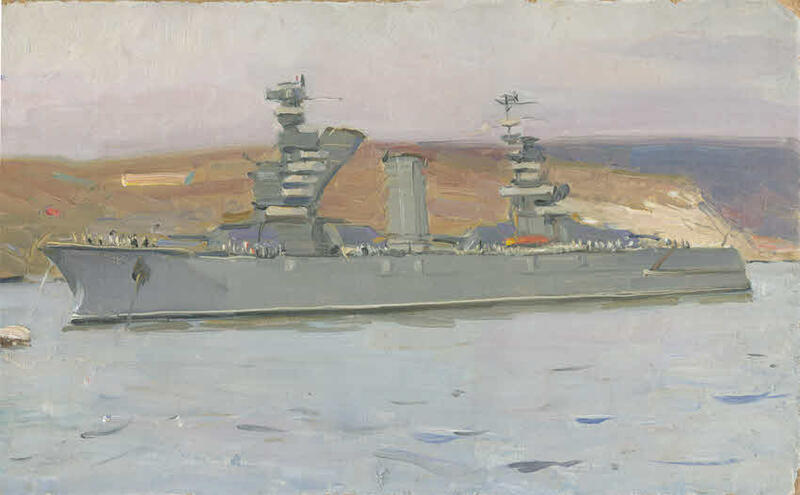 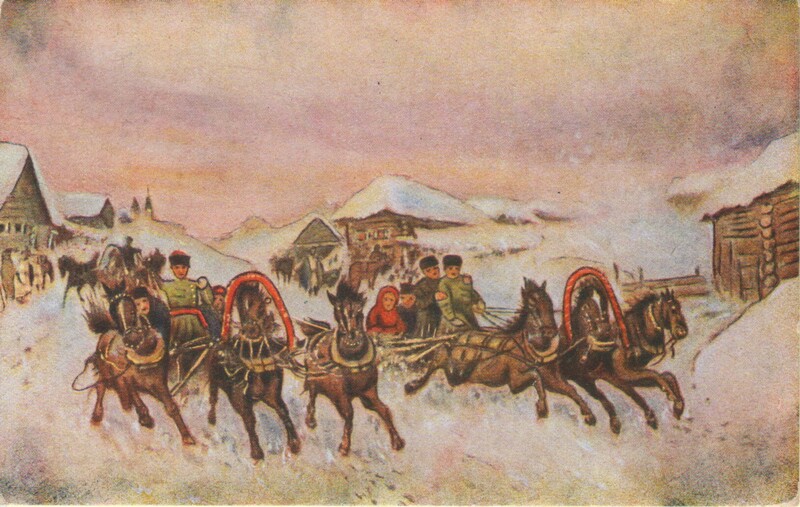 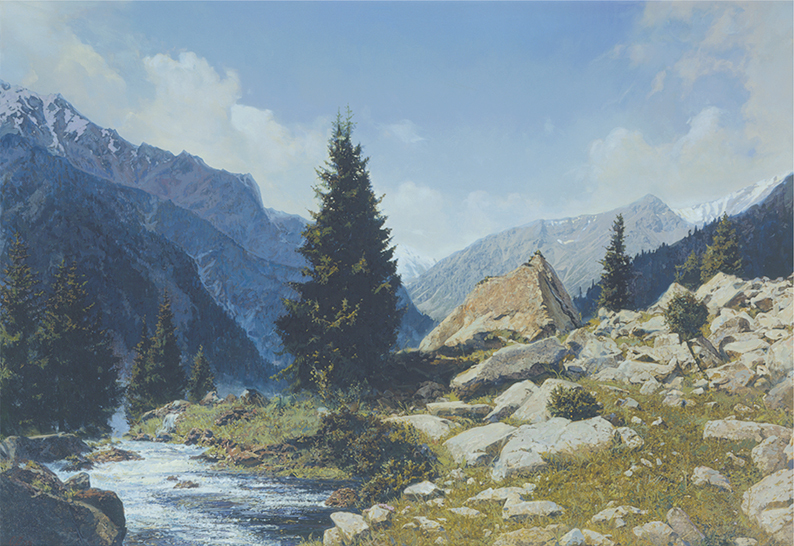 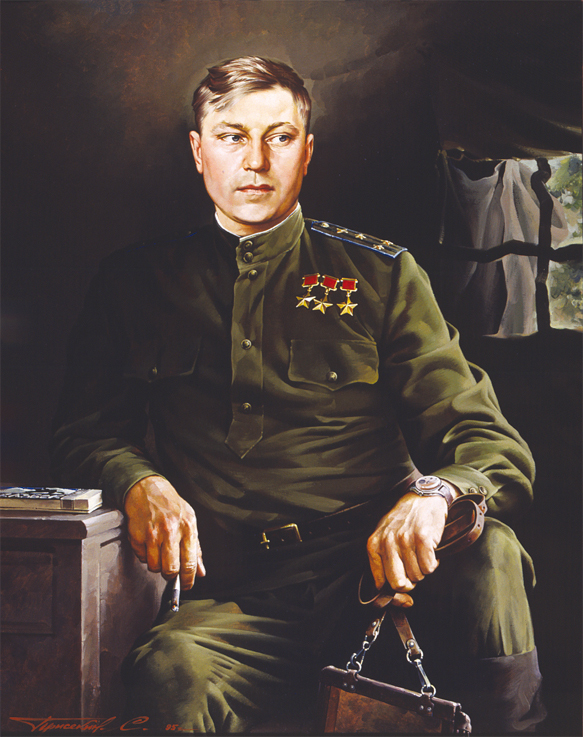 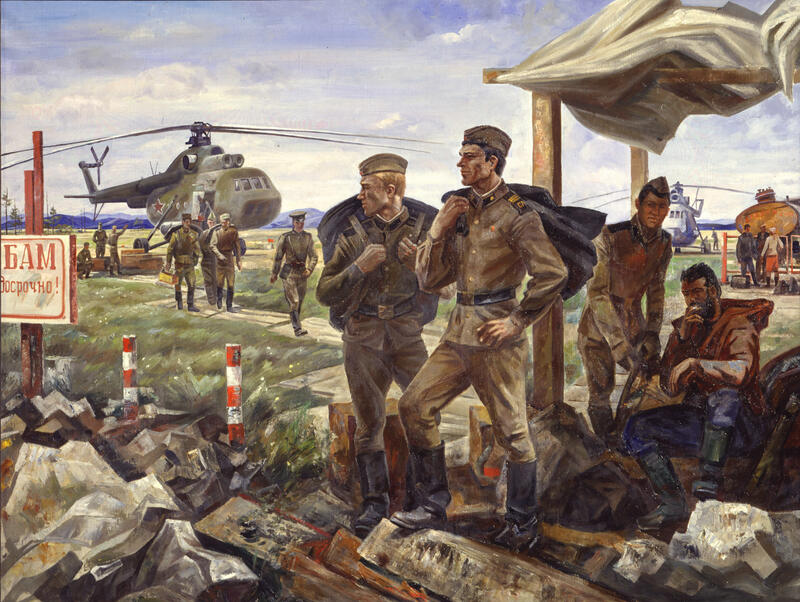 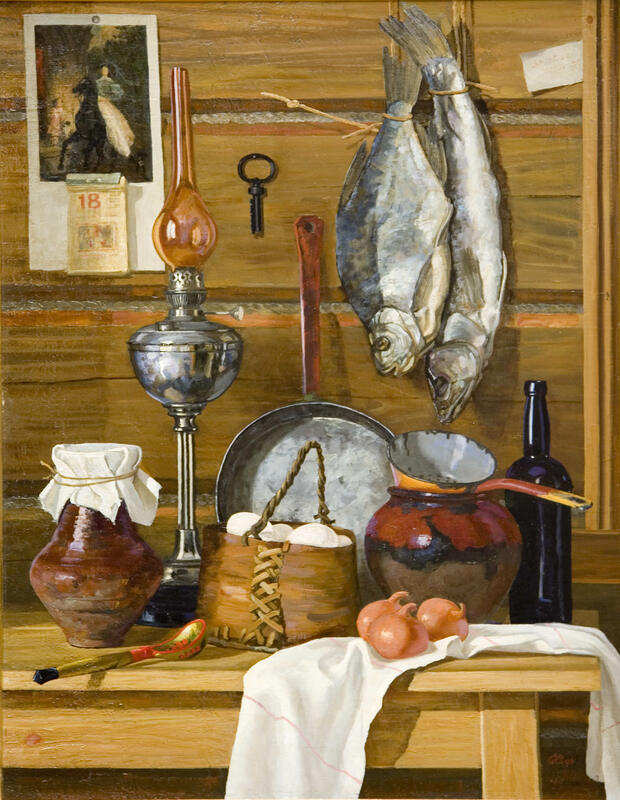 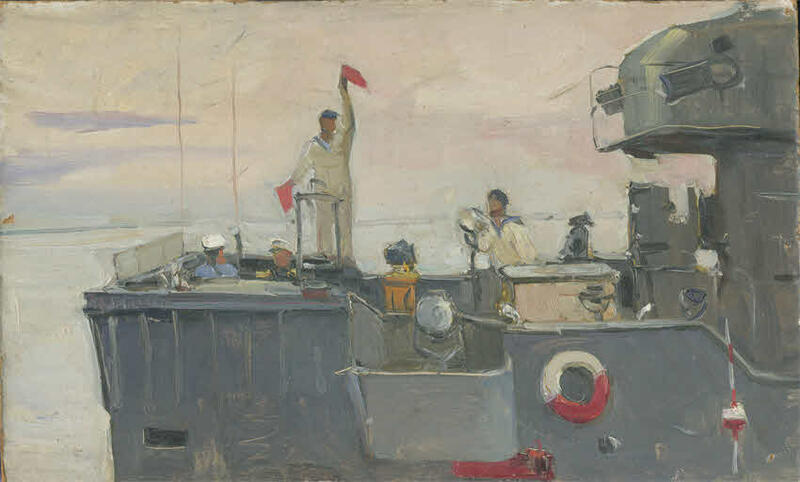 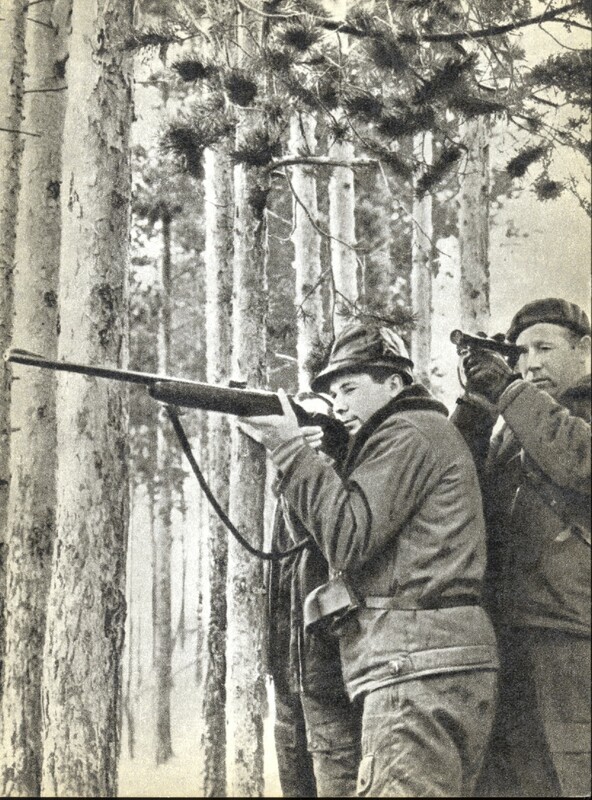 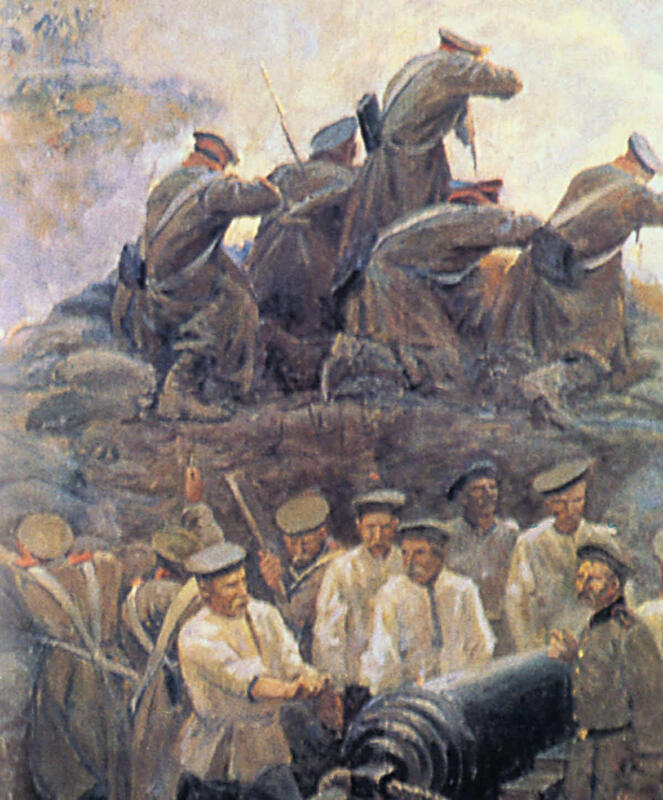 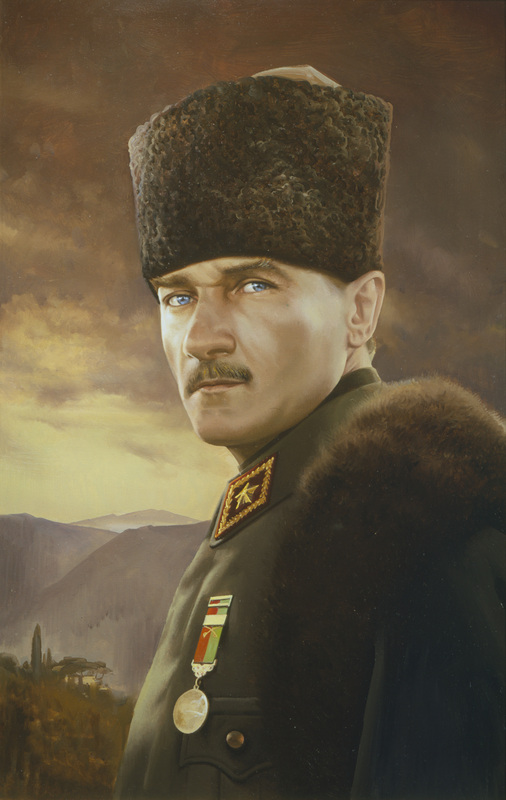 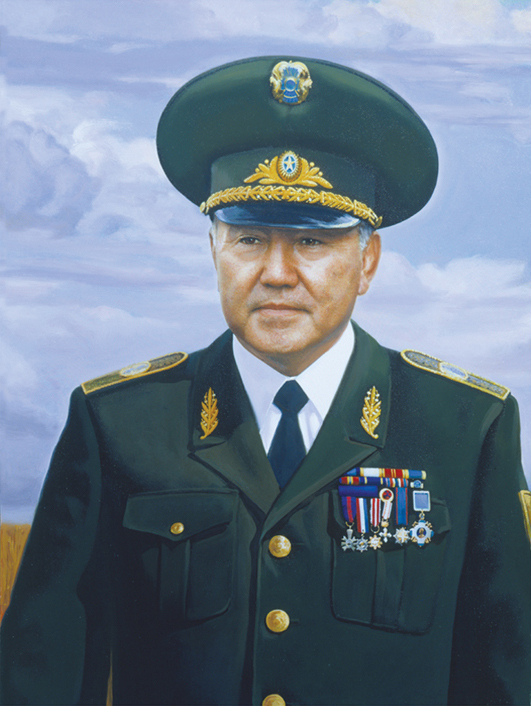 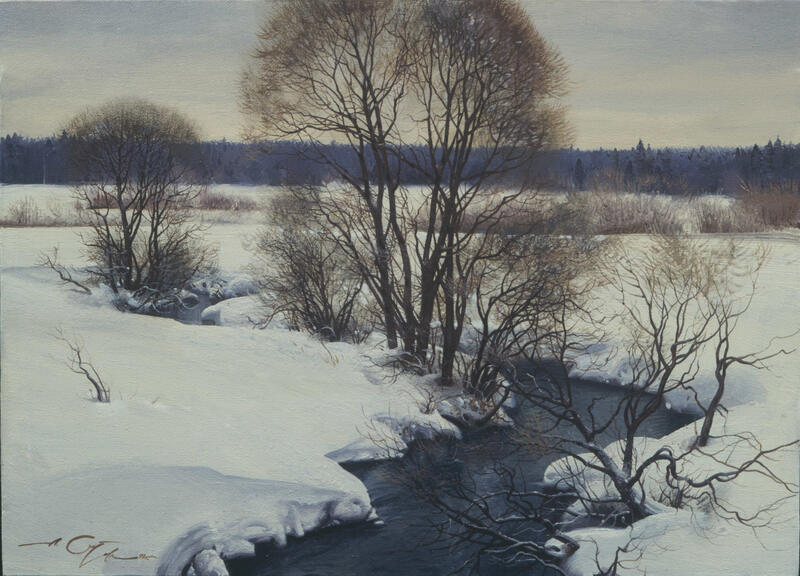 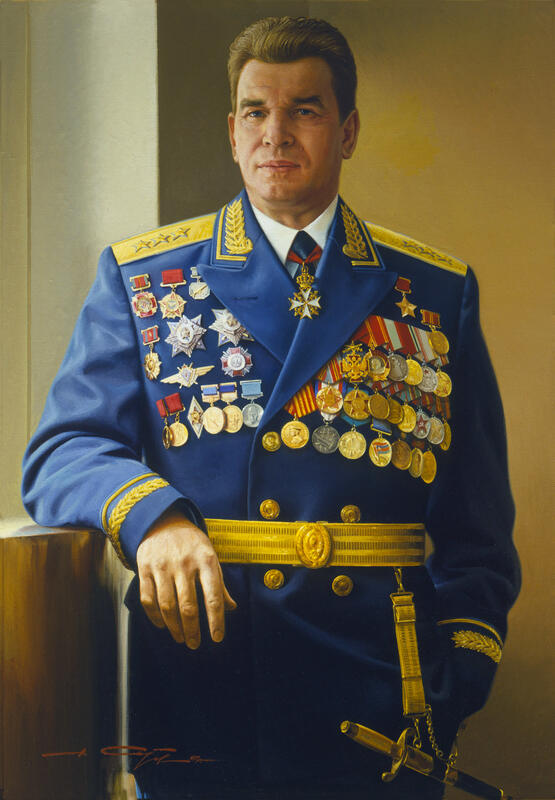 Yezdakov’s works are mostly comprised of nature paintings although his interest in the history of the Russian Military led to creation of several dioramas displayed in the Central Moscow Exhibition Center in celebration of the 60th anniversary of the USSR’s victory over Germany in the Great Patriotic War. 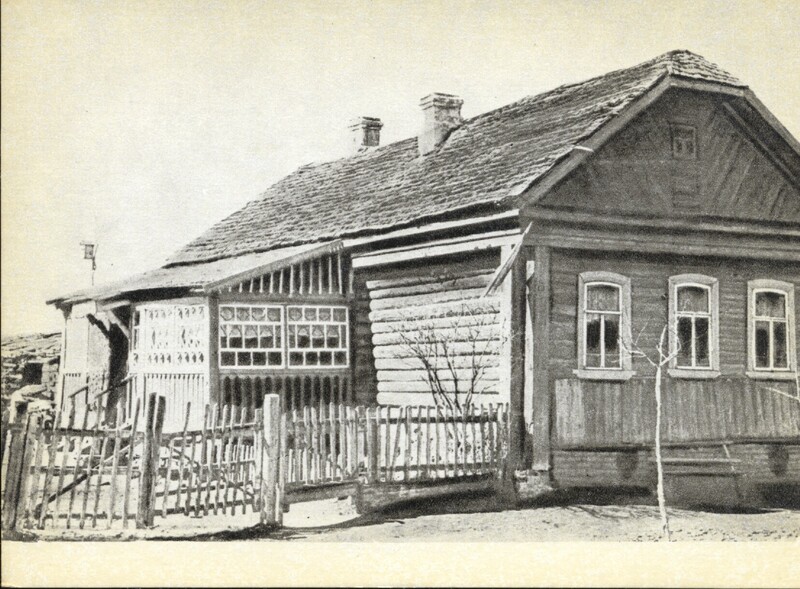 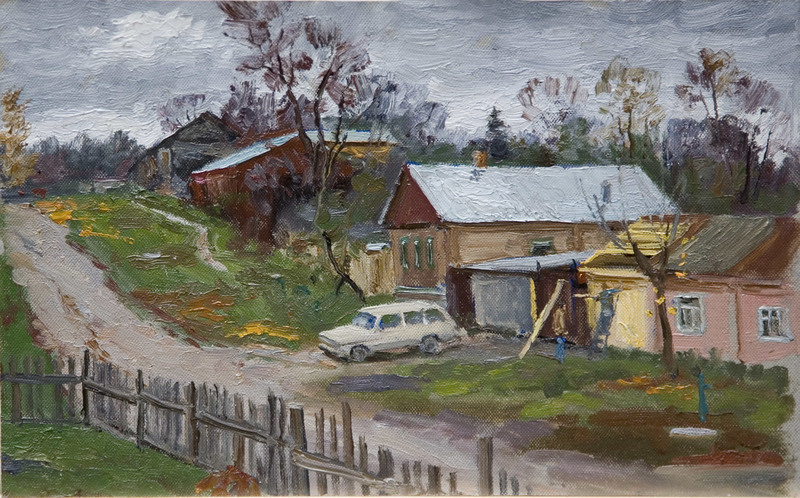 Kira Sergeyevna Ivanova was born on 1928 in Samara. 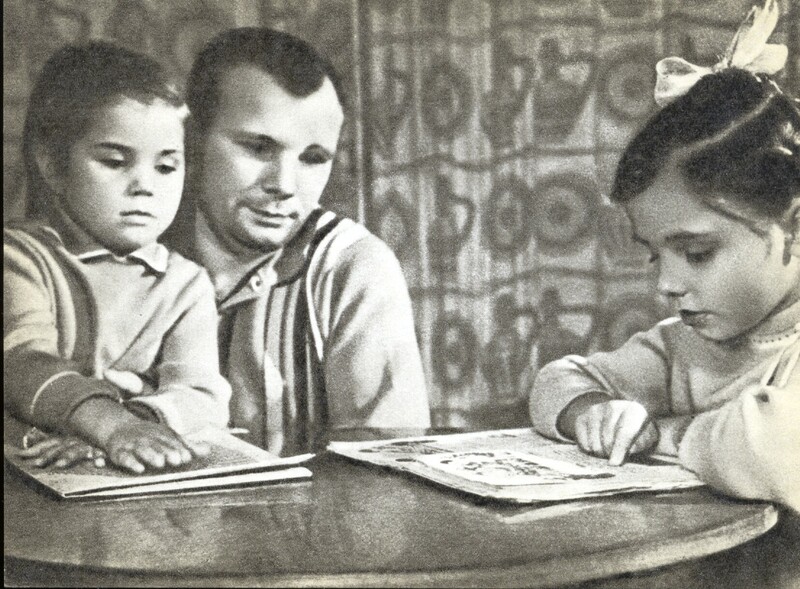 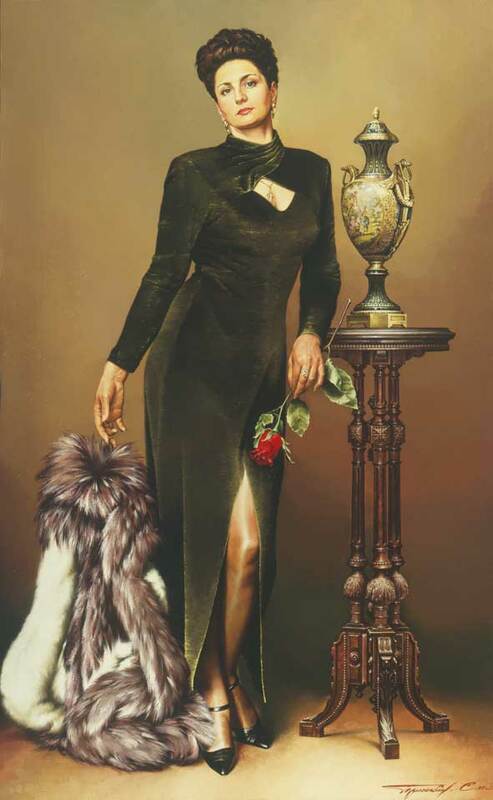 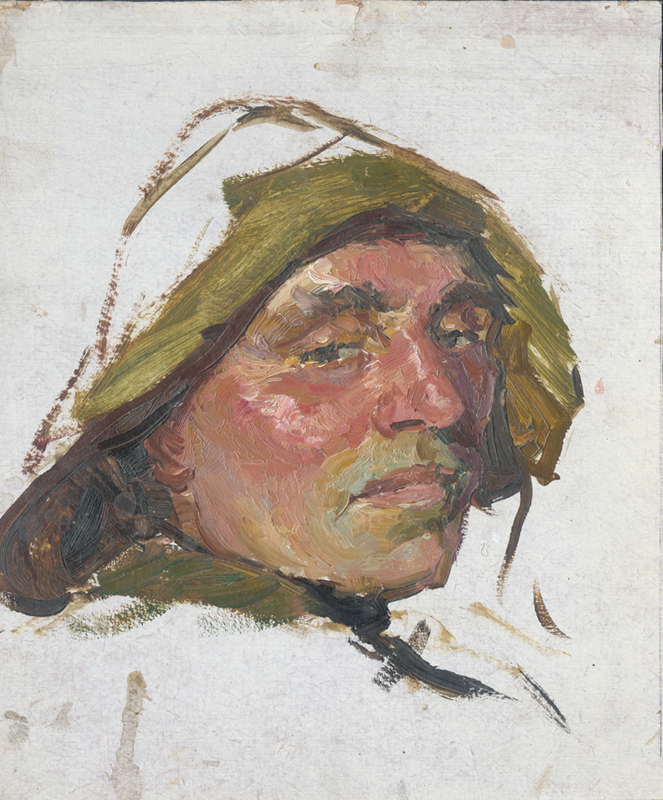 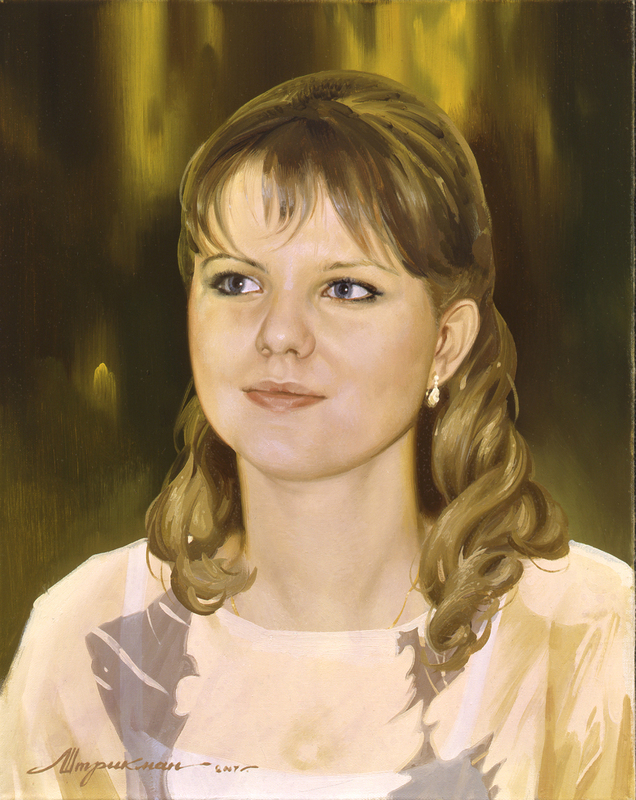 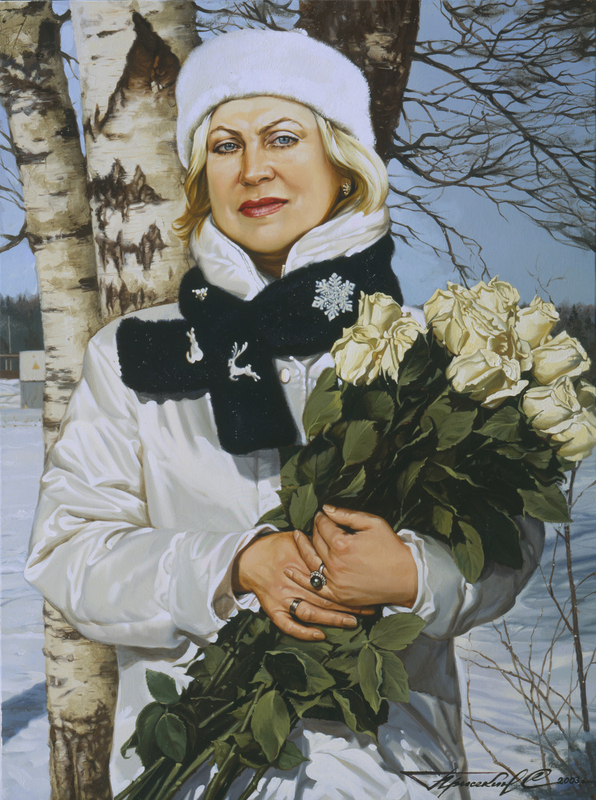 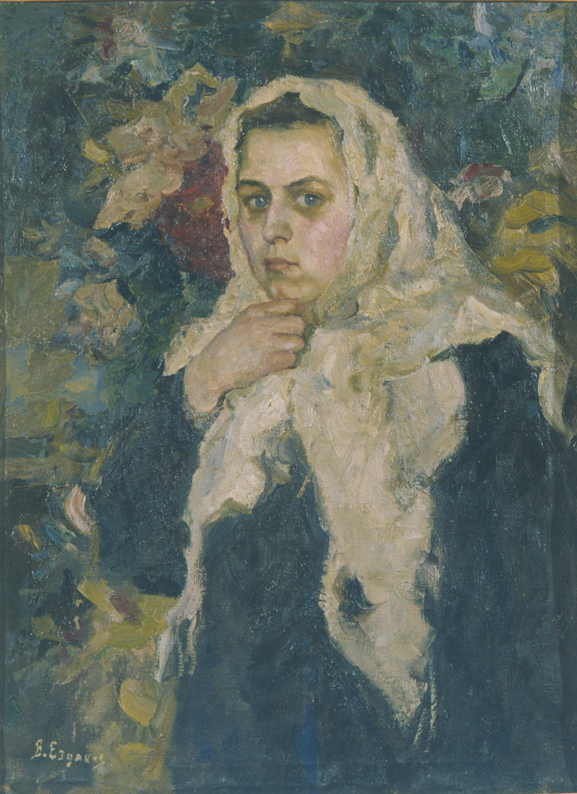 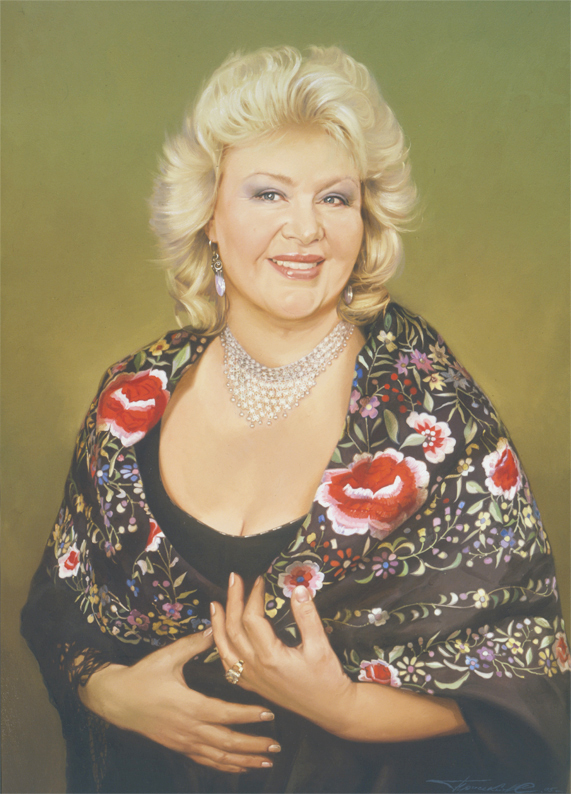 Graduating from the Moscow State Institute of Art, she too had become a member of the Union of Artists of the USSR and has participated in much of the union’s exhibitions. 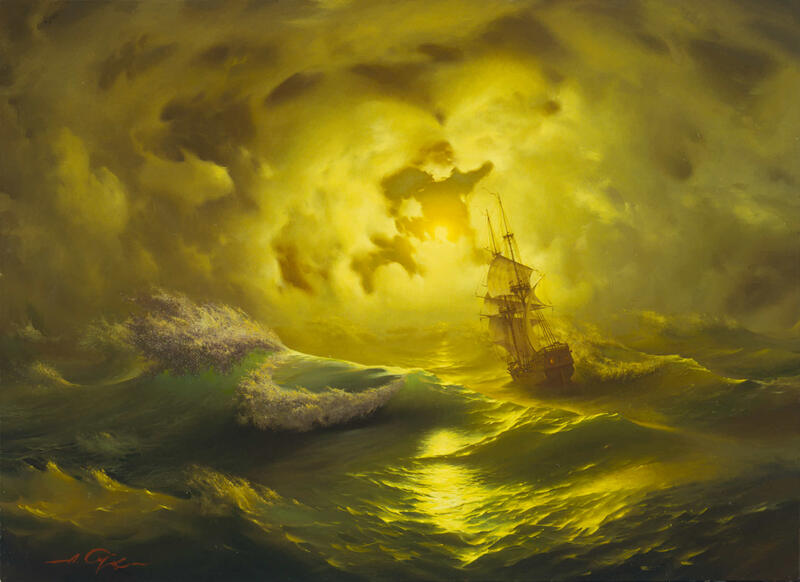 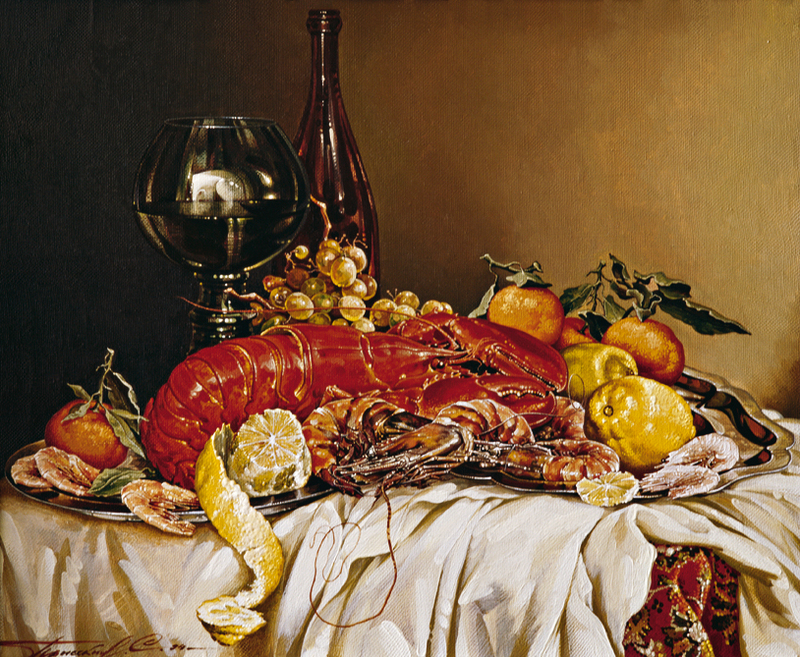 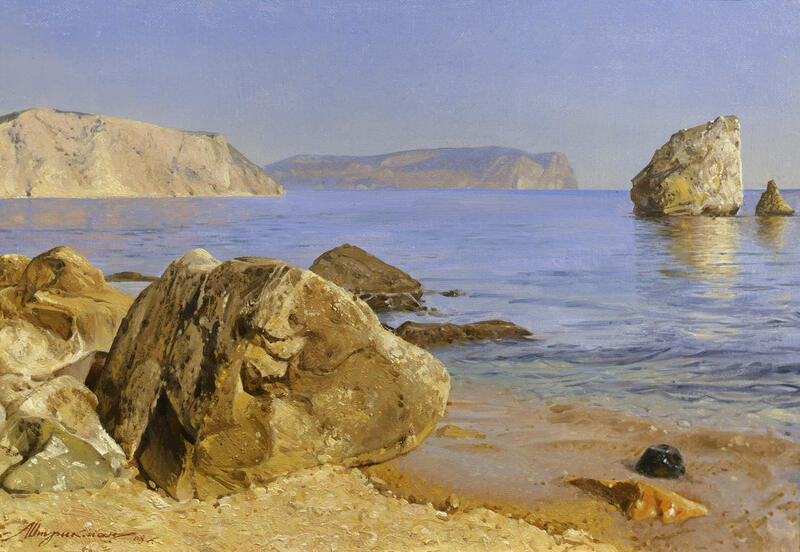 Her paintings, several of which have been created with her husband, Vasiliy Dmitrievich Yezdakov are mostly scenes of still life, historical battles, and the sea. 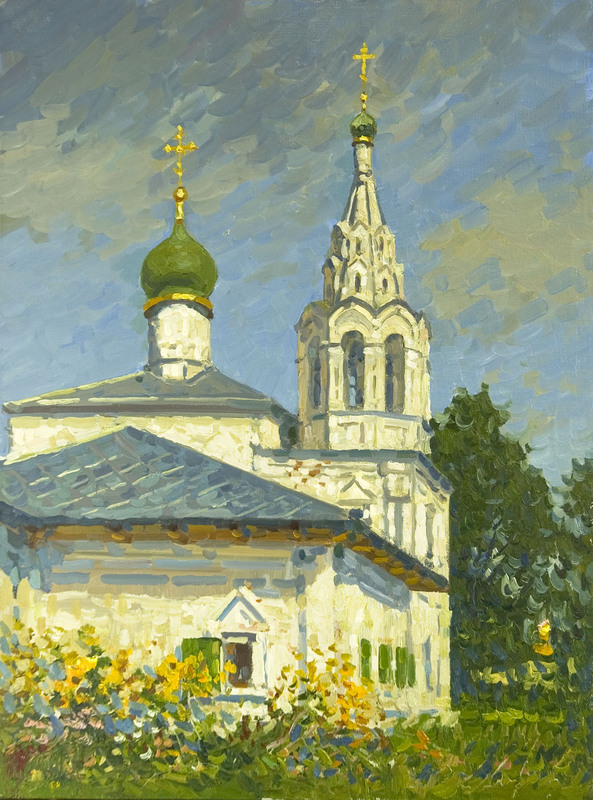 Currently living in Moscow, she has since produced over 250 works, many of which have found places abroad in Western Europe. 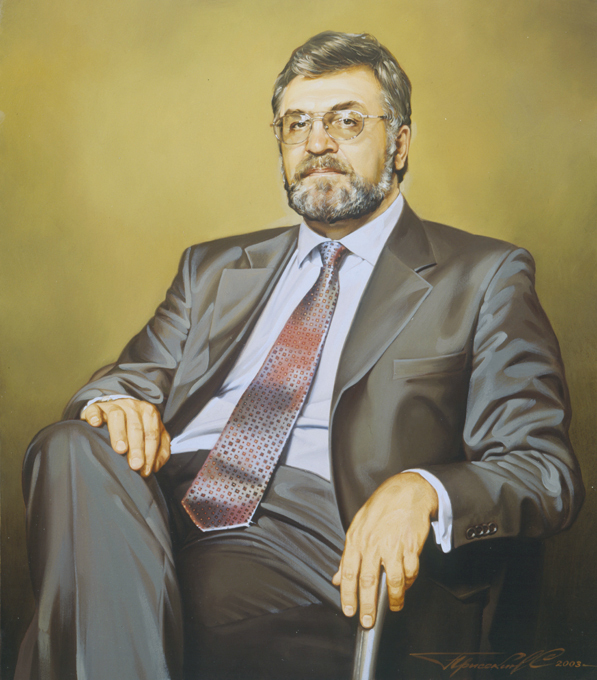 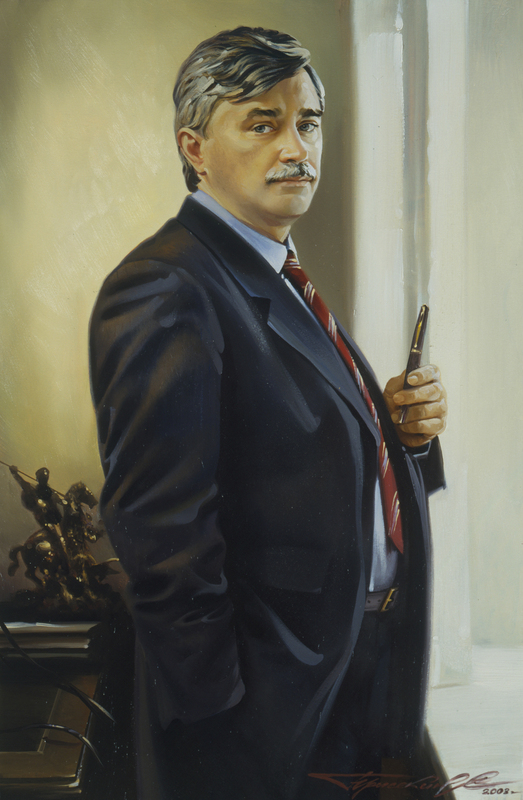 Aleksandr Ivanovich Kurochkin was born in 1948 and attended the Oryol State Pedagogical Institute. 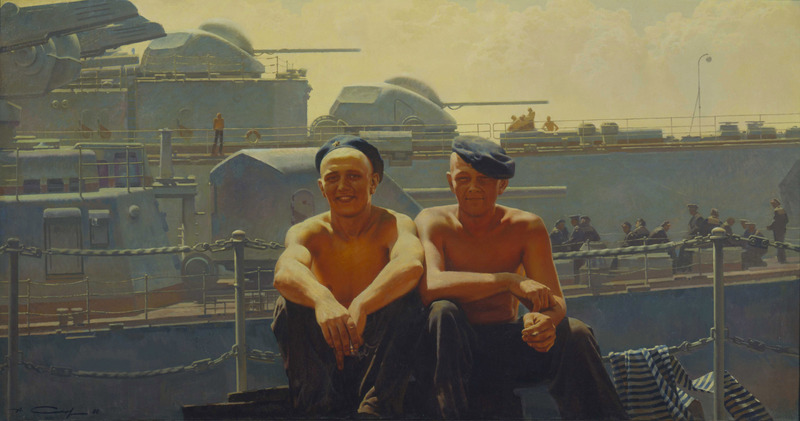 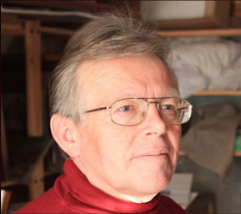 In addition to teaching art he previously held a position as director for the Serpukhov Museum of History and Art. 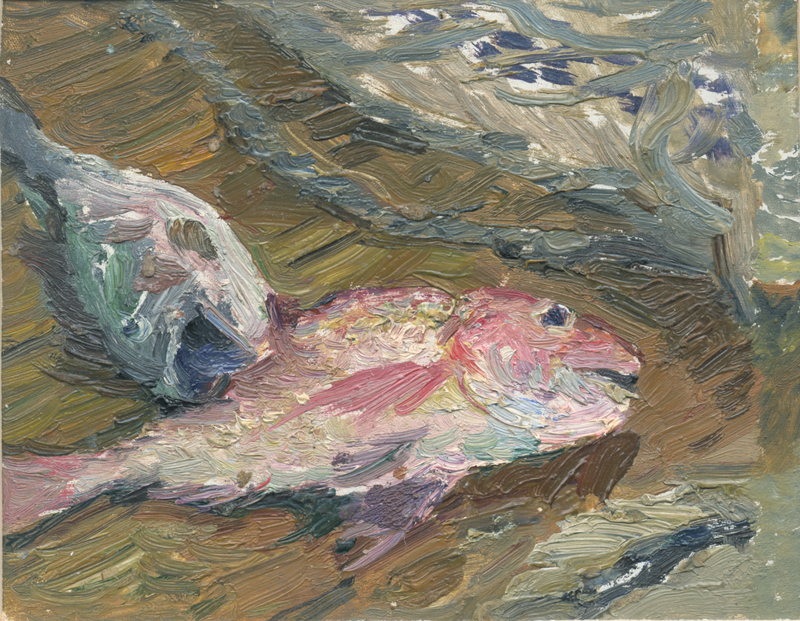 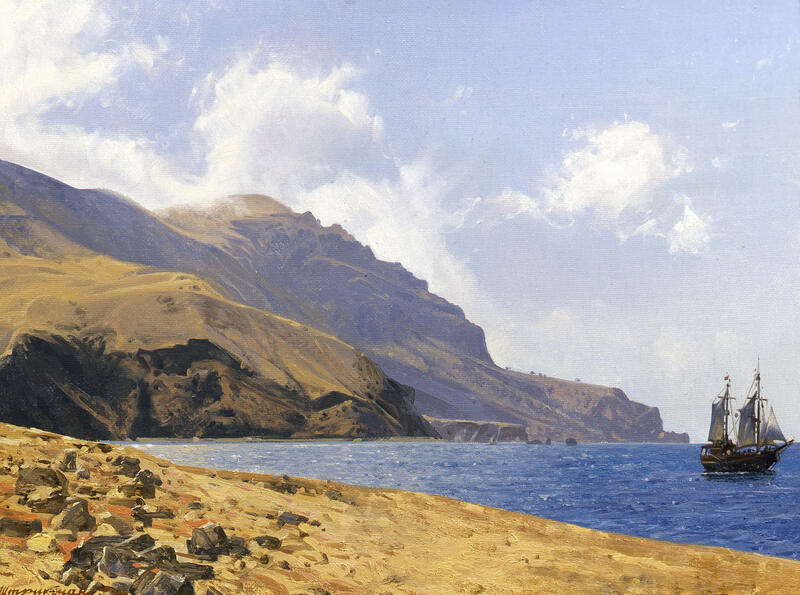 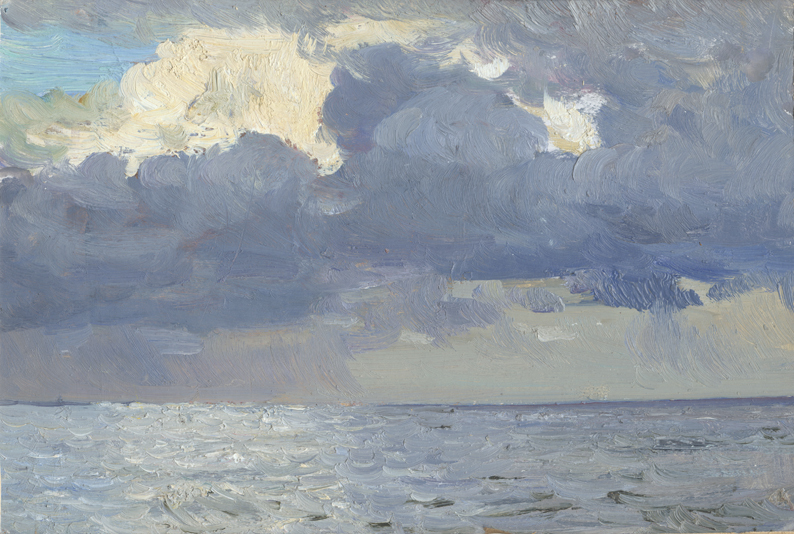 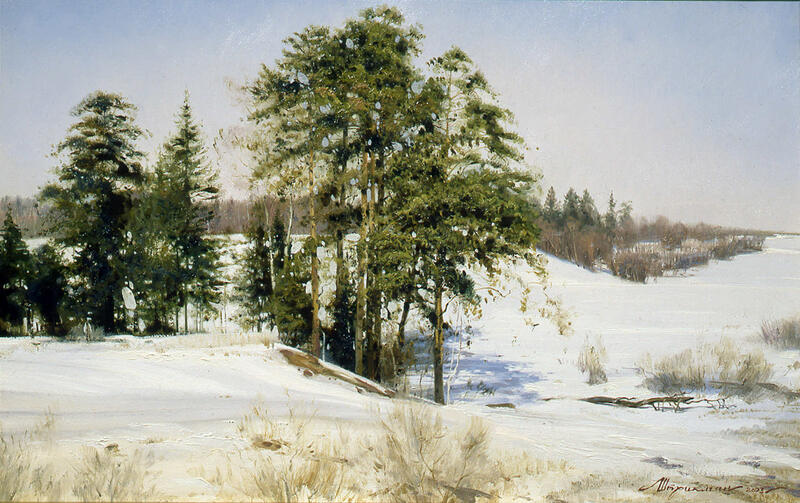 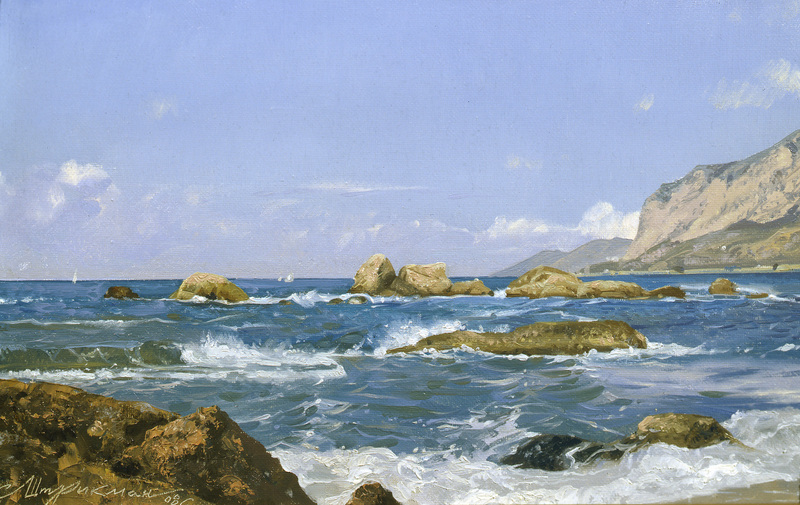 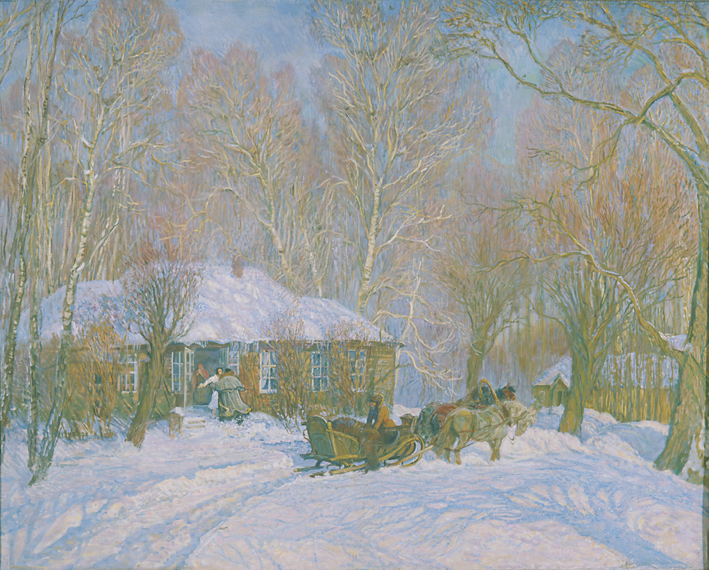 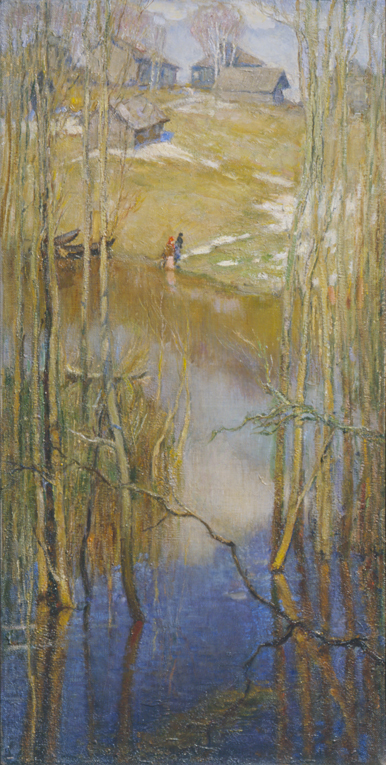 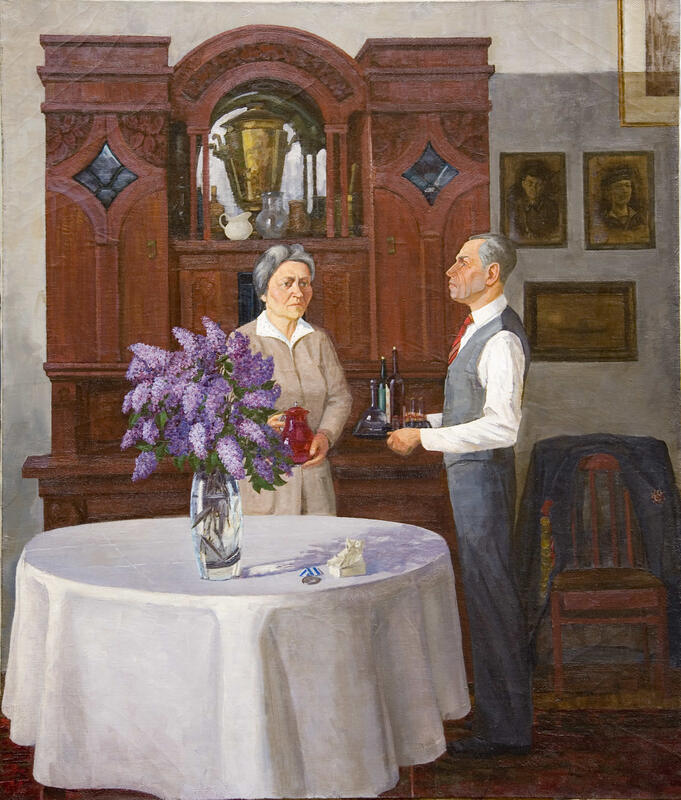 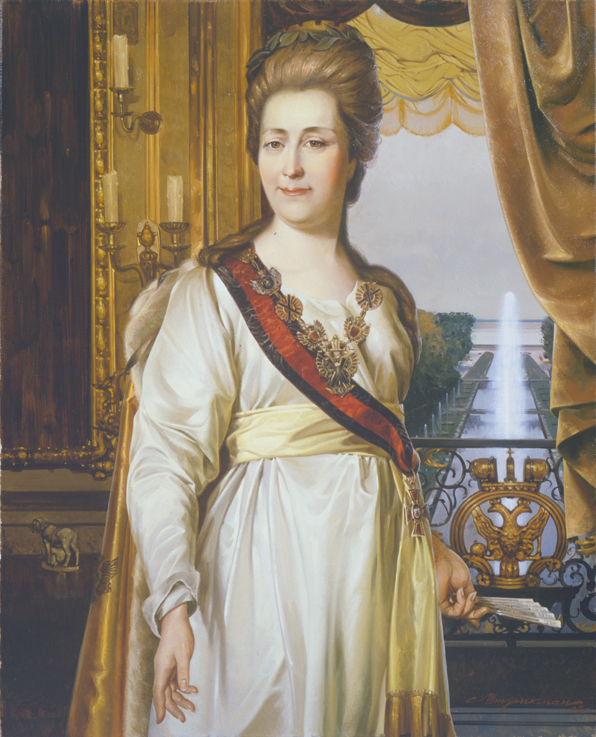 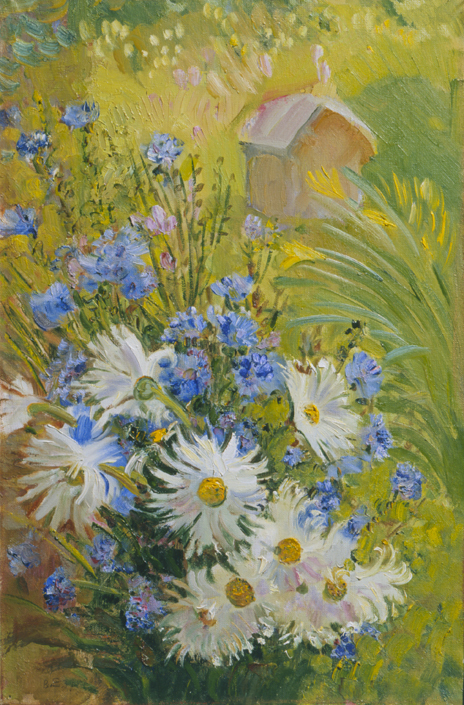 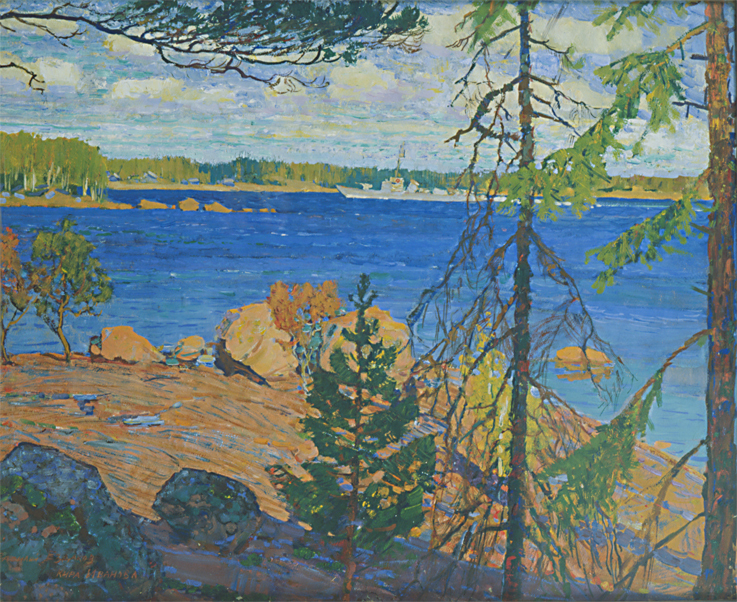 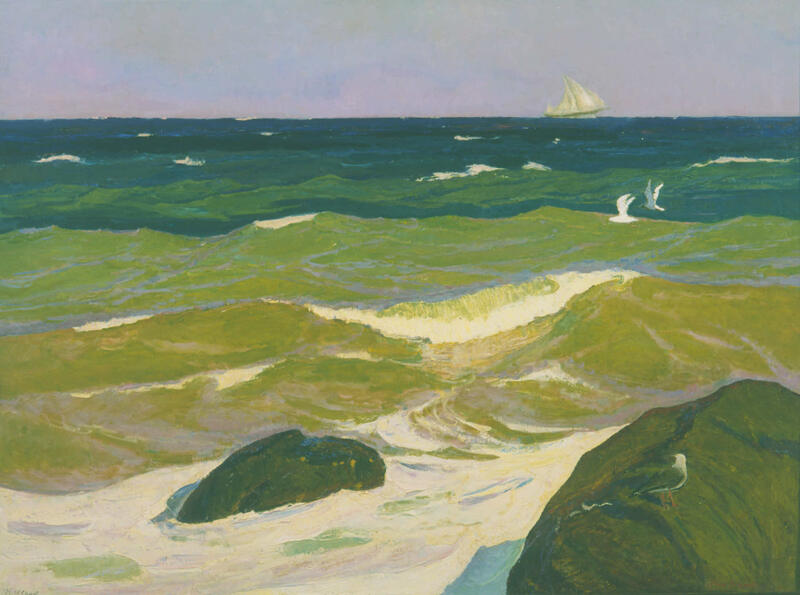 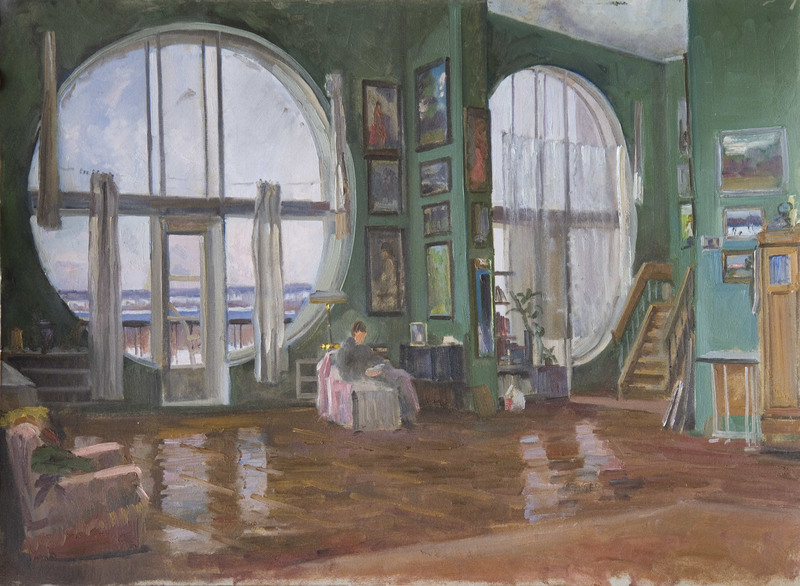 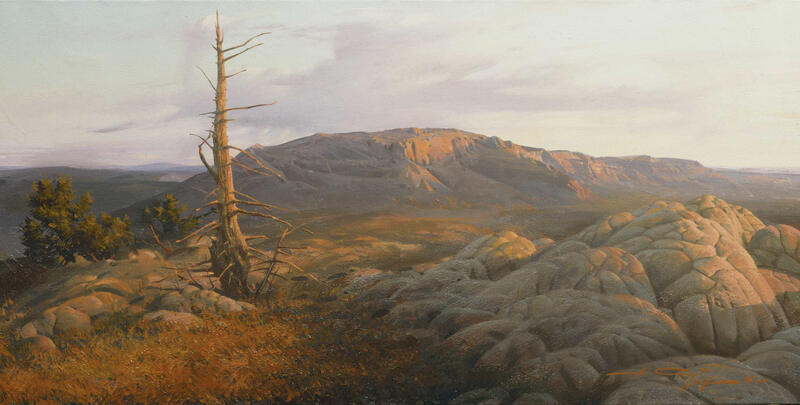 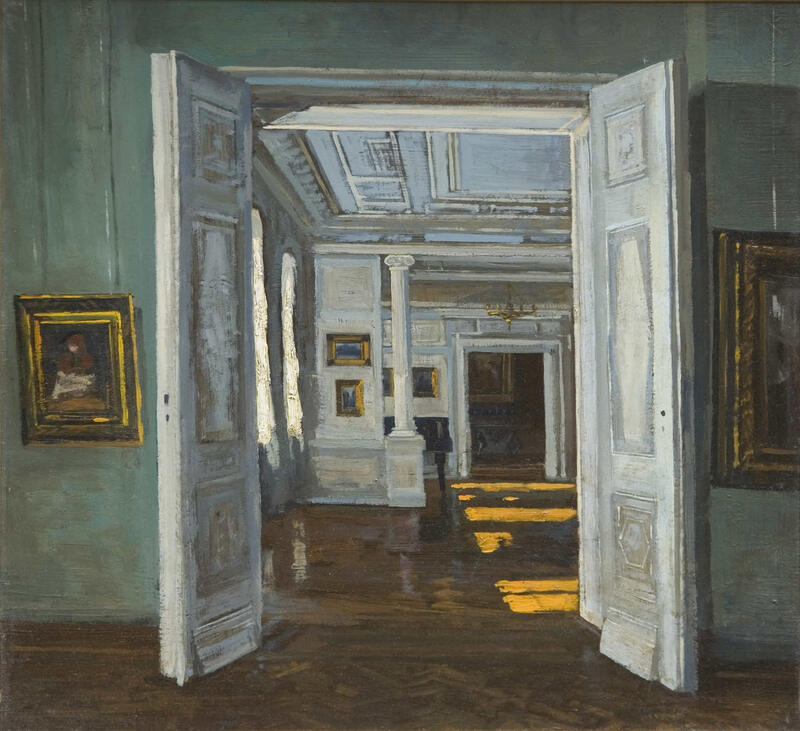 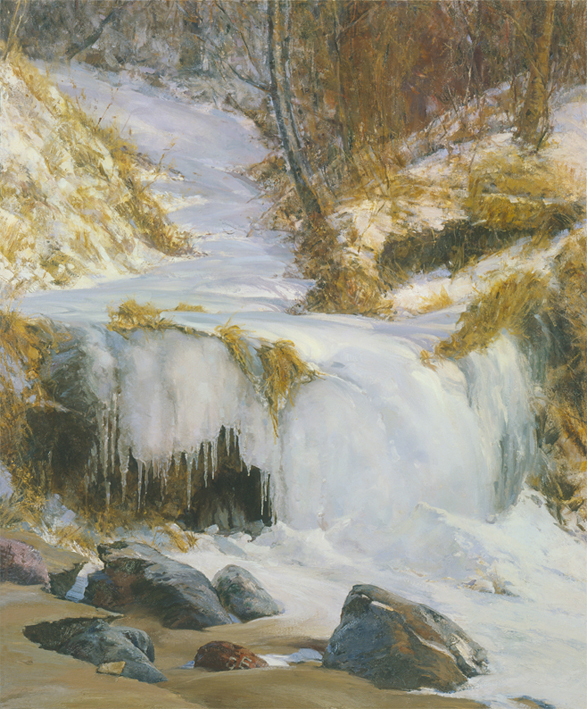 Kurochkin’s paintings which range from landscapes to still life, are found in various State museums in Russia as well as abroad in other countries. 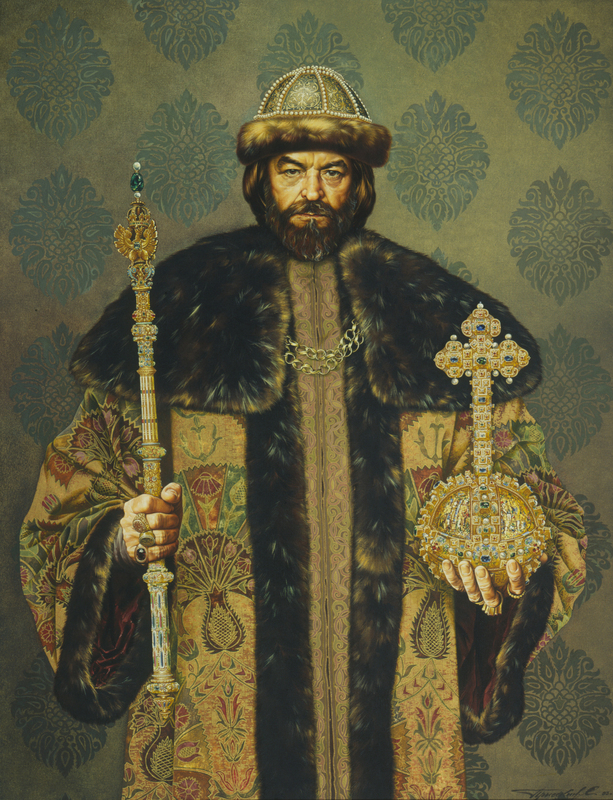 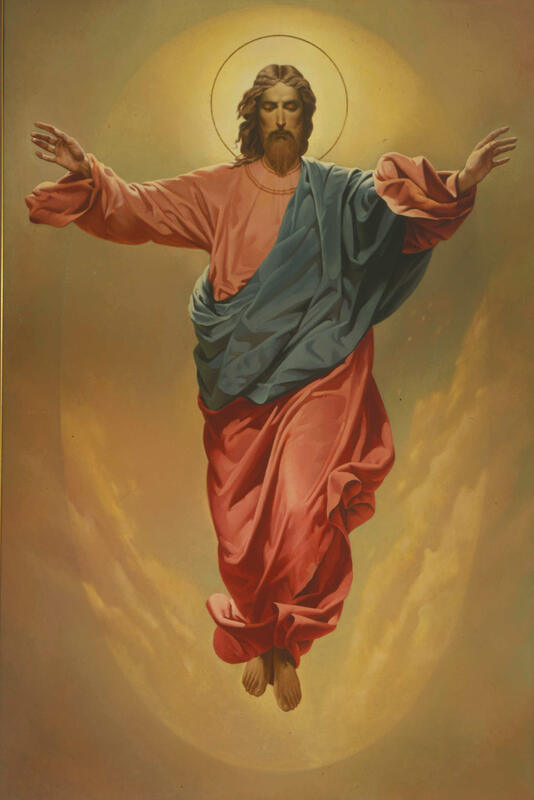 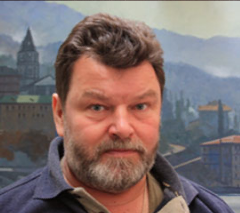 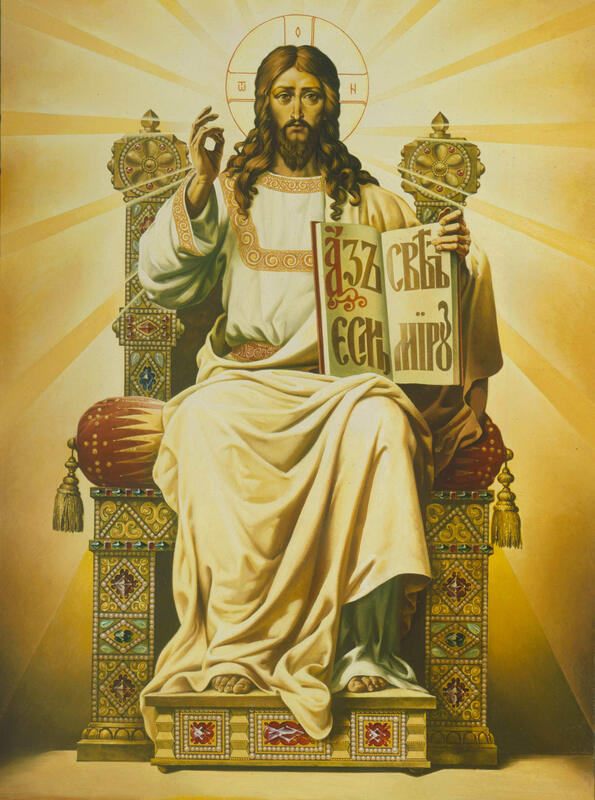 Born in 1957, Aleksandr Sytov also attended the Surikov Institute of Art and been involved in various projects in art including the restoration of the Cathedral of Christ the Savior, for which he was awarded the Order of Honour by President Dmitriy Medvedev. 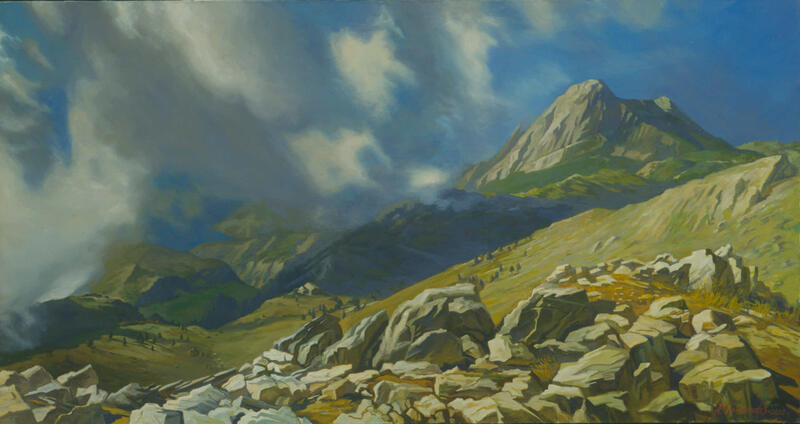 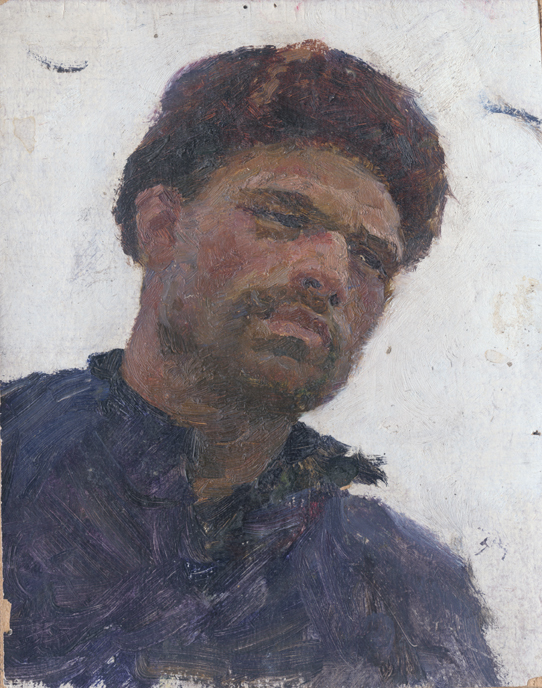 Several of Sytov’s works, which are primarily landscapes and portraits have been displayed at exhibitions in America as well as Russia. 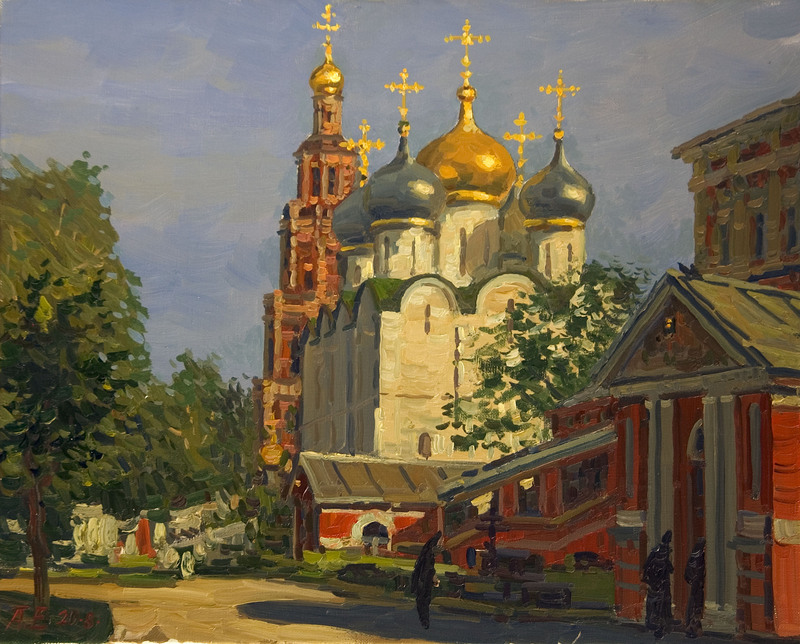 Leonid Lvovich Shtrikman was born in 1968 in Moscow. 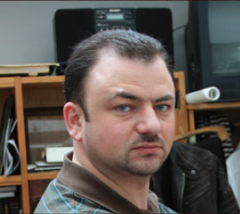 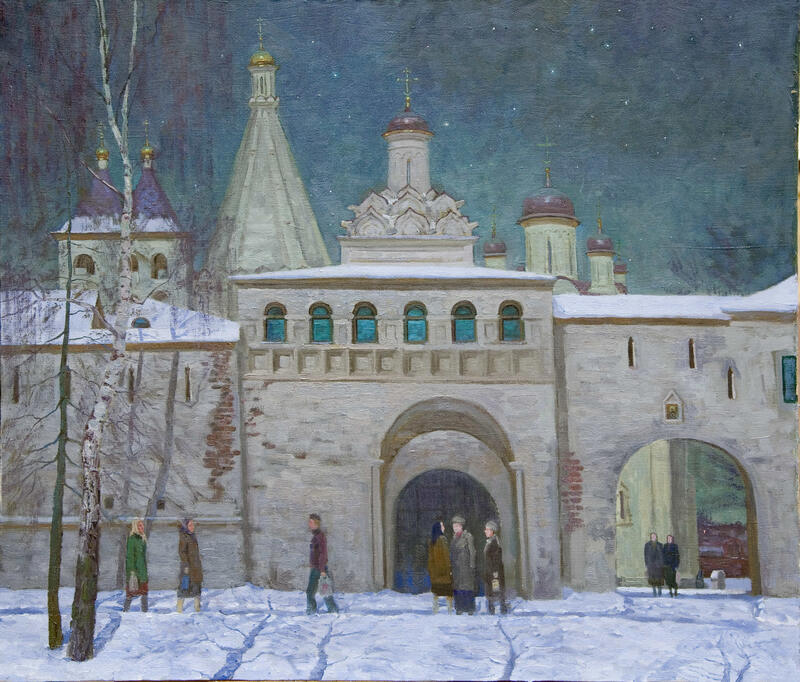 Shtrikman attended the Moscow School of Art and later worked as a restorer of paintings for a state memorial in Kolomna. 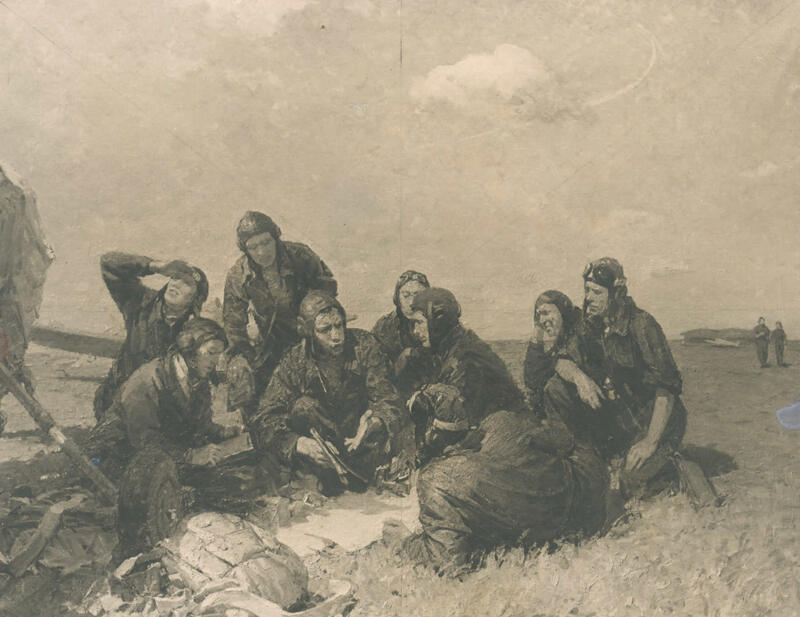 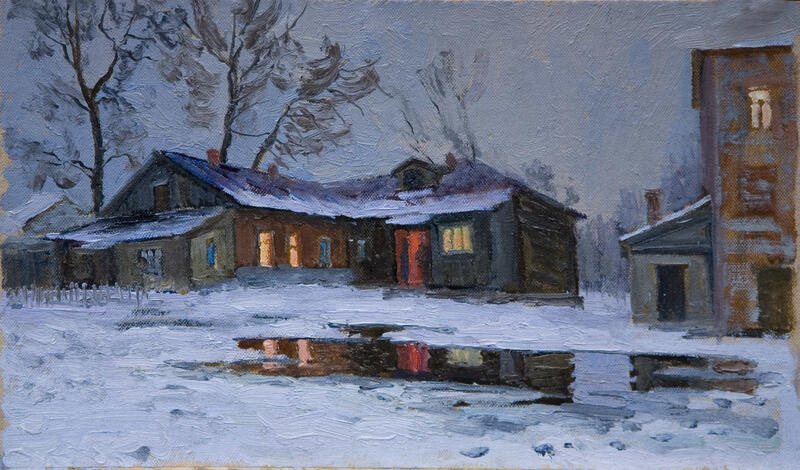 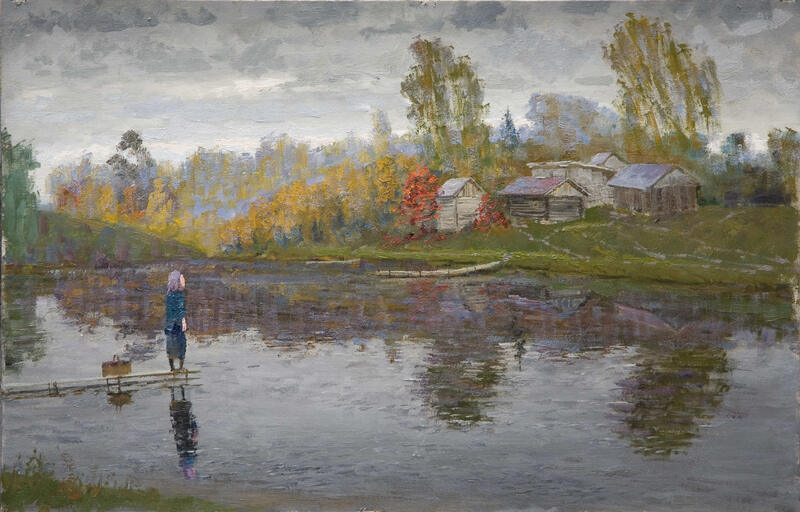 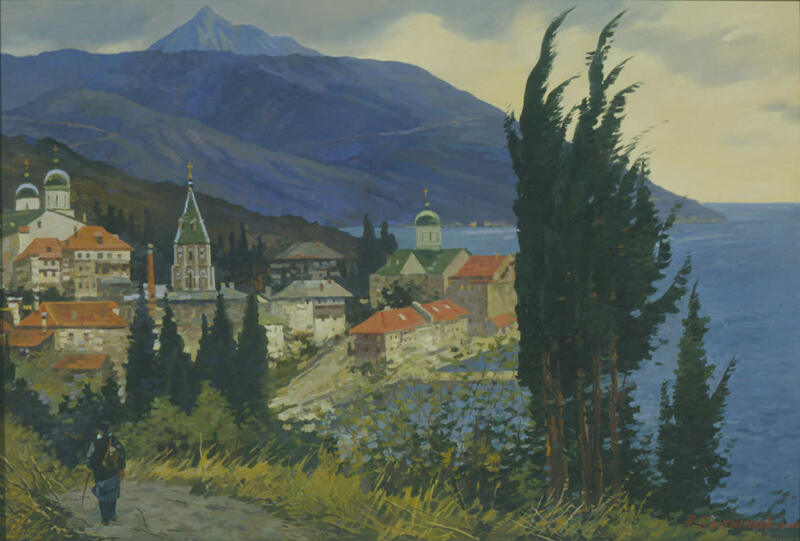 Like others here, Shtrikman’s works are mostly portraits and landscapes of various Russian figures and places. 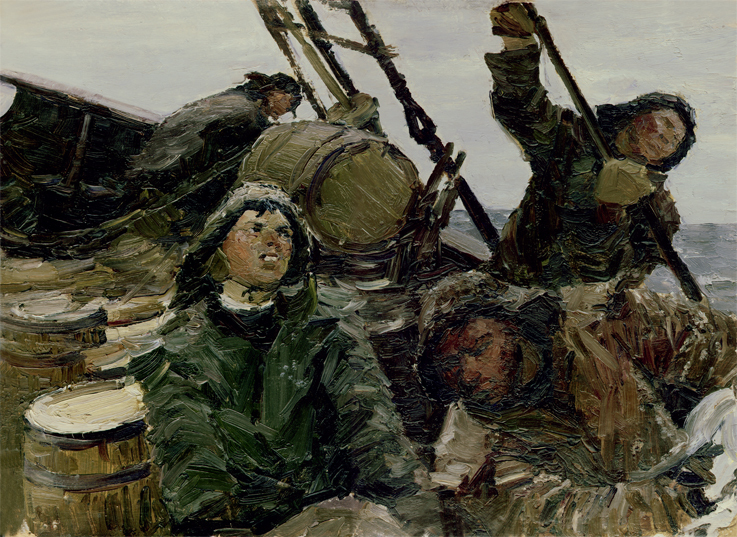 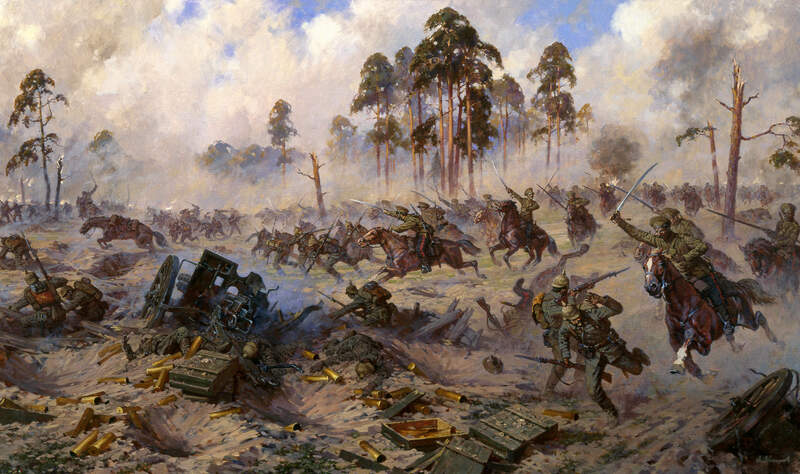 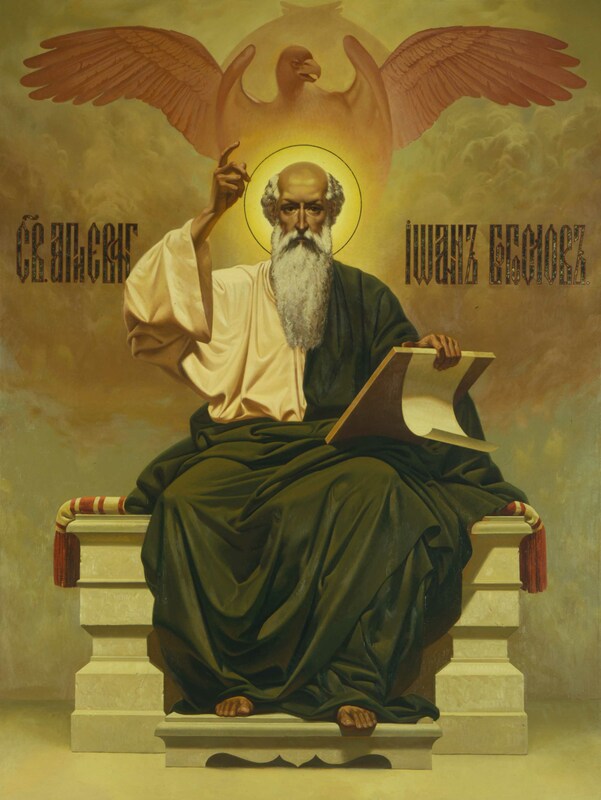 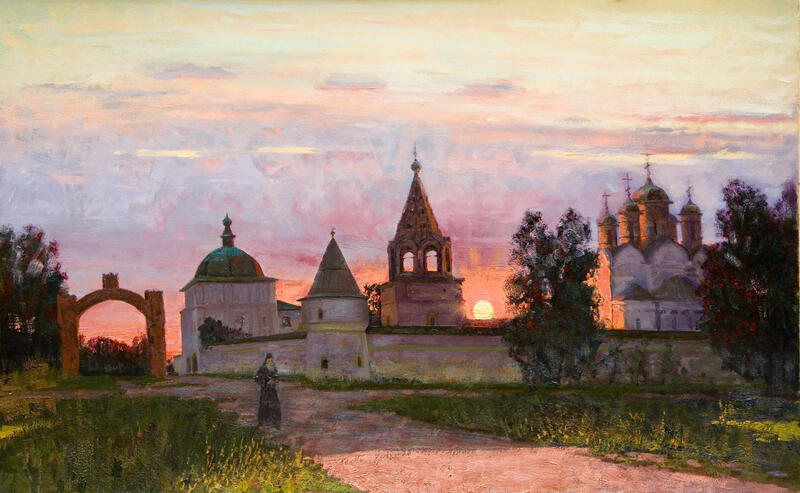 Lastly is Sergei Nikolaevich Prisekin, arguably the most well-known of these artists. 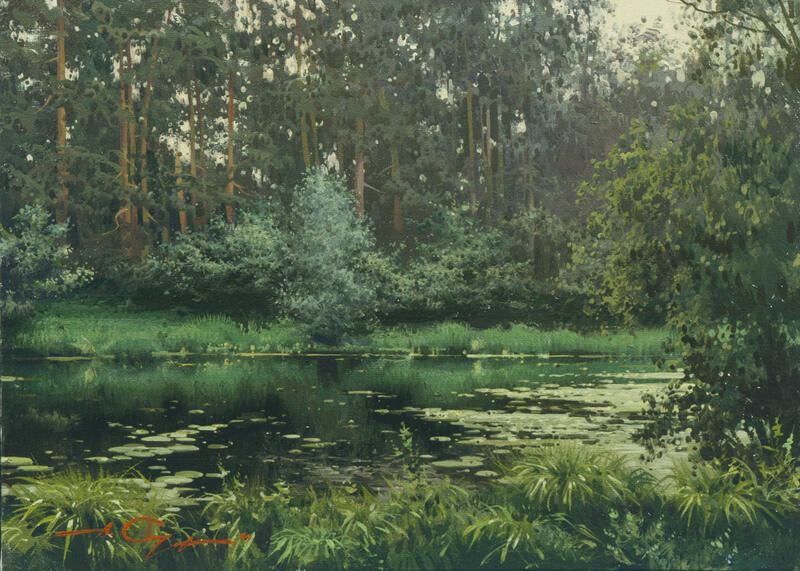 Born in 1959, Prisekin attended the Surikov Institute of Art and has since become an accomplished artists, today holding the position of Academician at the Moscow Academy of Arts. 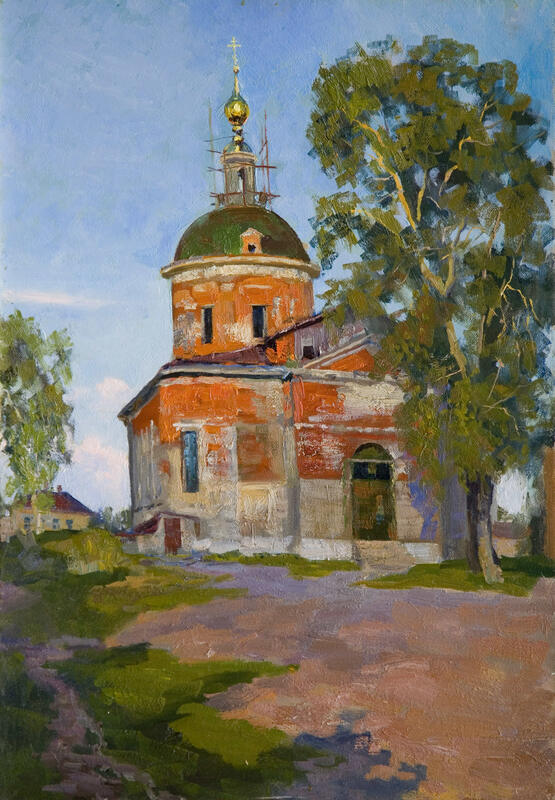 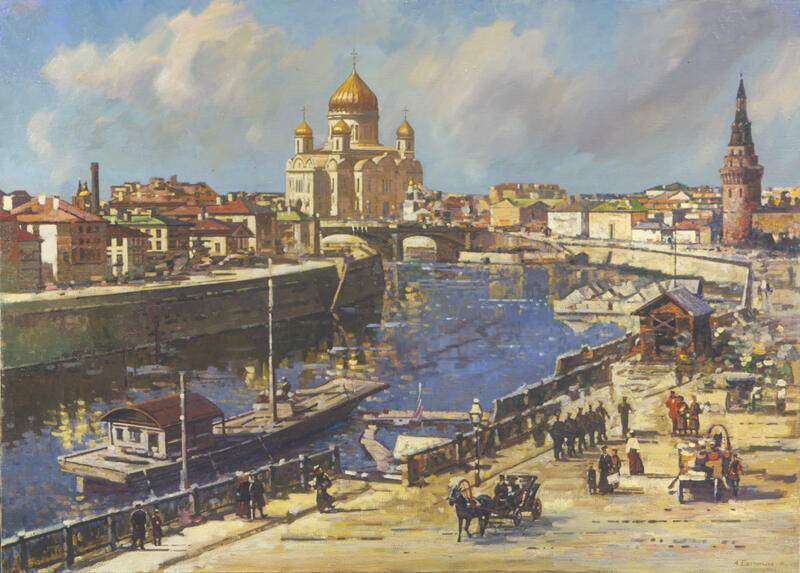 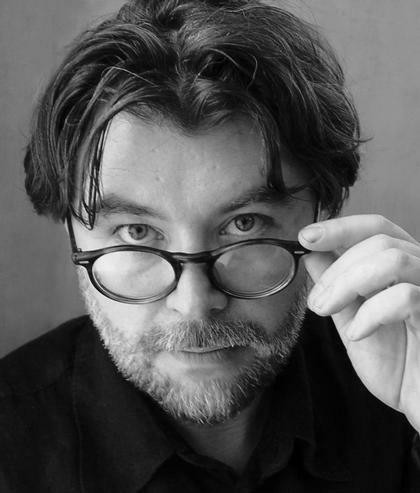 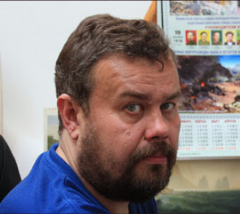 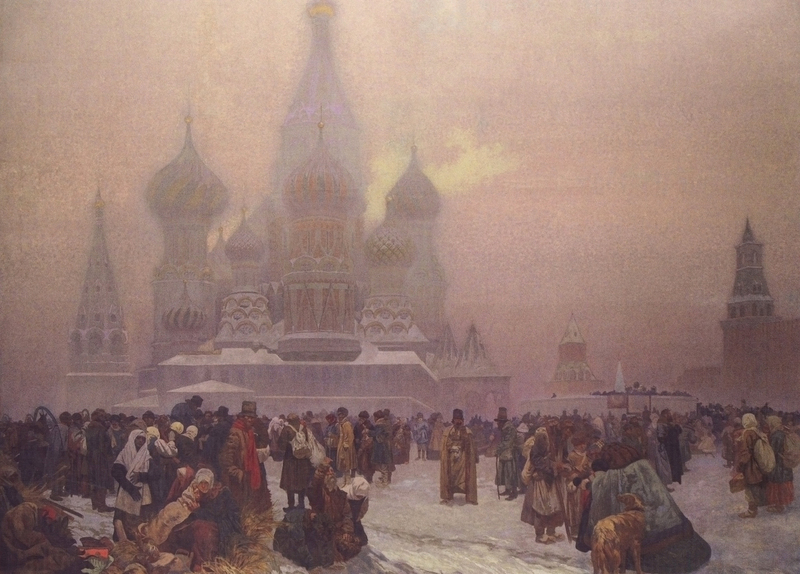 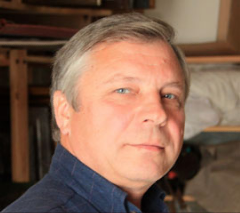 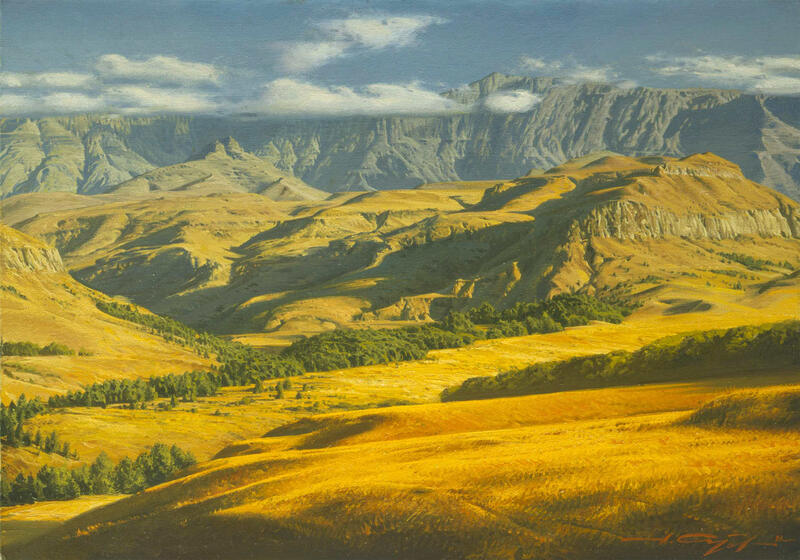 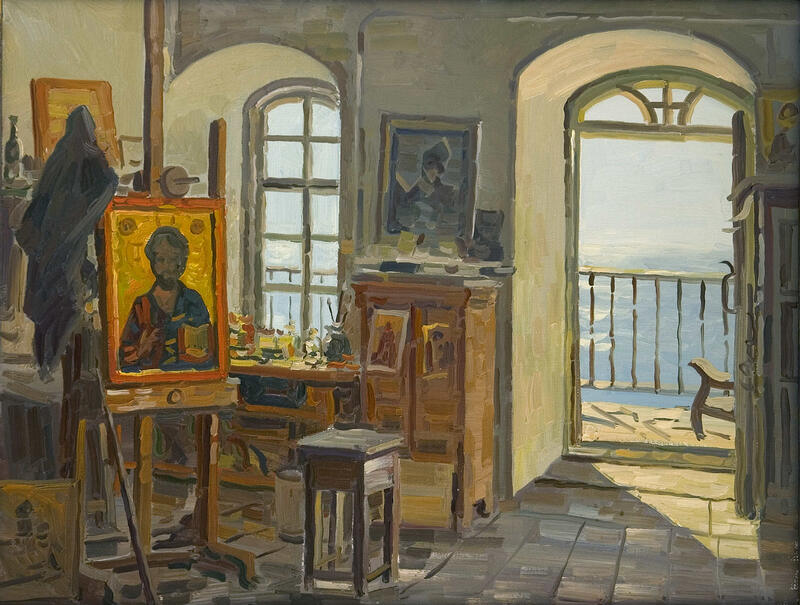 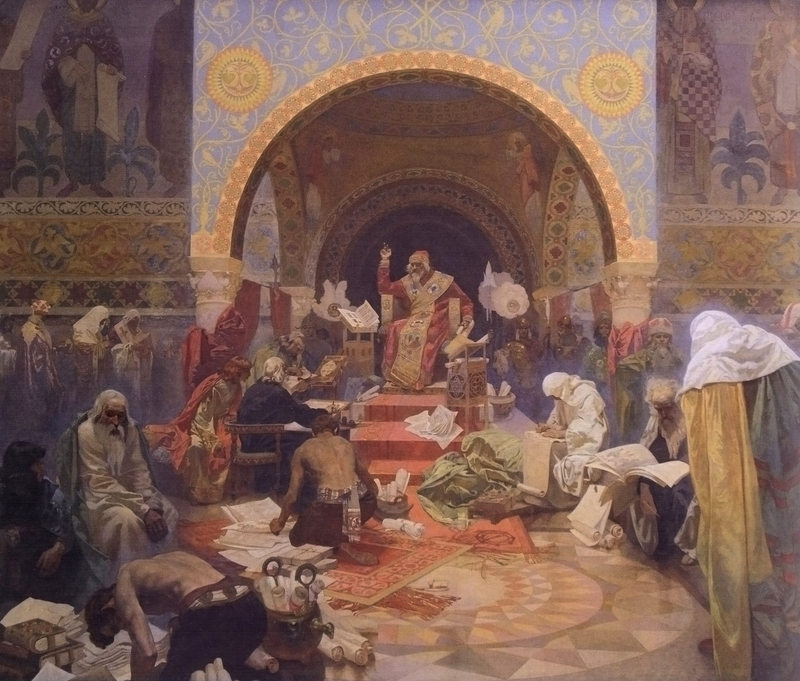 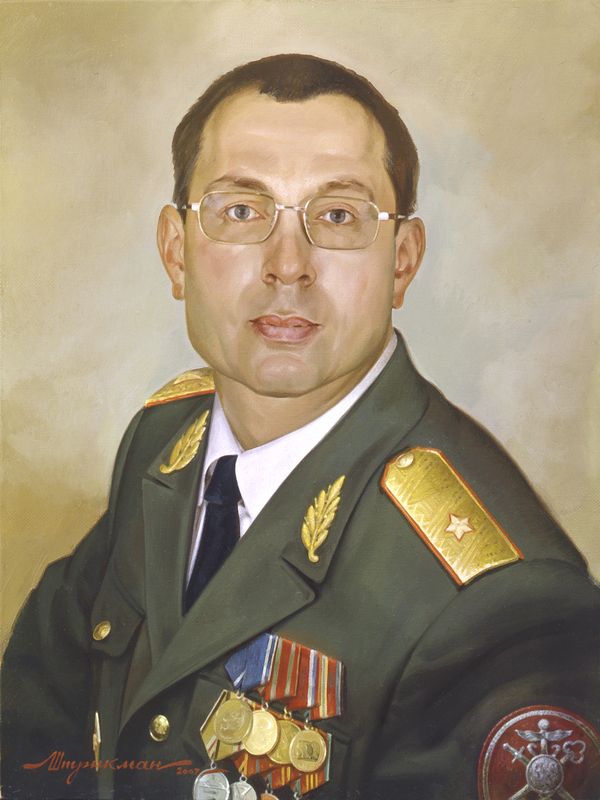 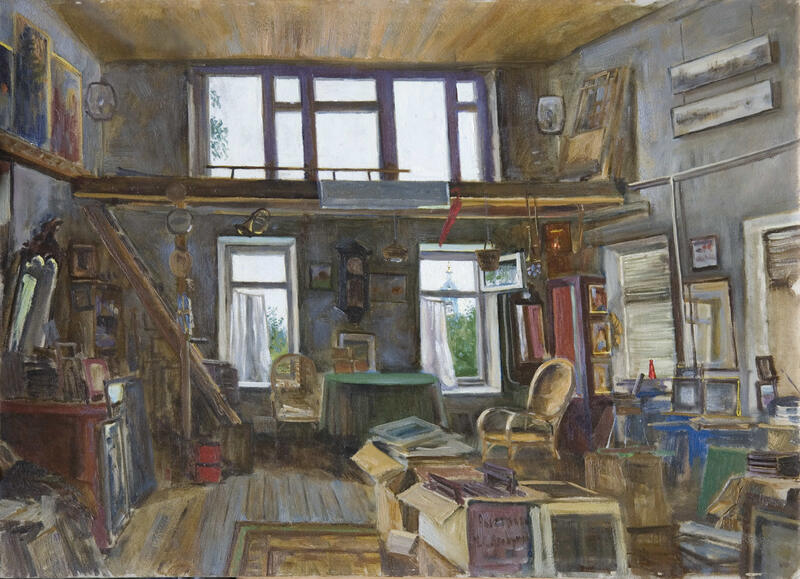 Prisekin’s travels to various parts of the Earth such as Latin America have added to his bright career as an artist, several of his works are even located within the Kremlin Palace itself. 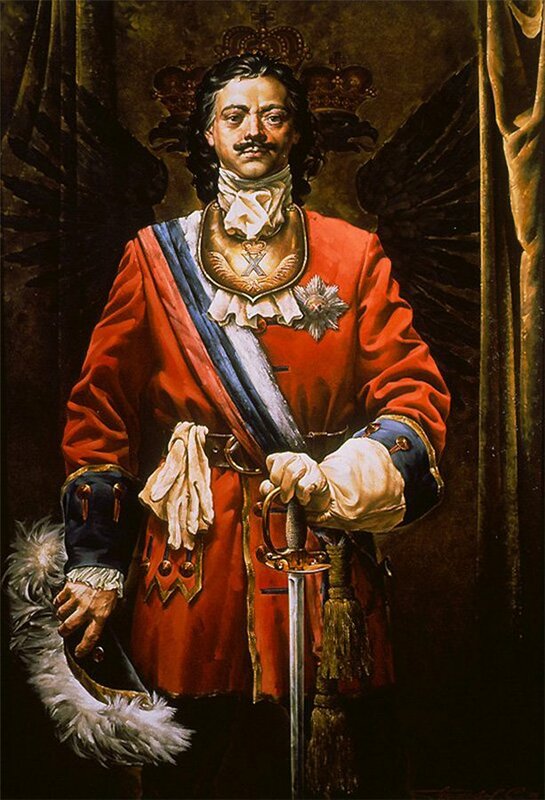 Primarily an artist of portraits, he has created several historical works dealing with periods such as the War of 1812 or the Great Patriotic War, possessing intricate detail, comparable to the likes of Ilya Glazunov. 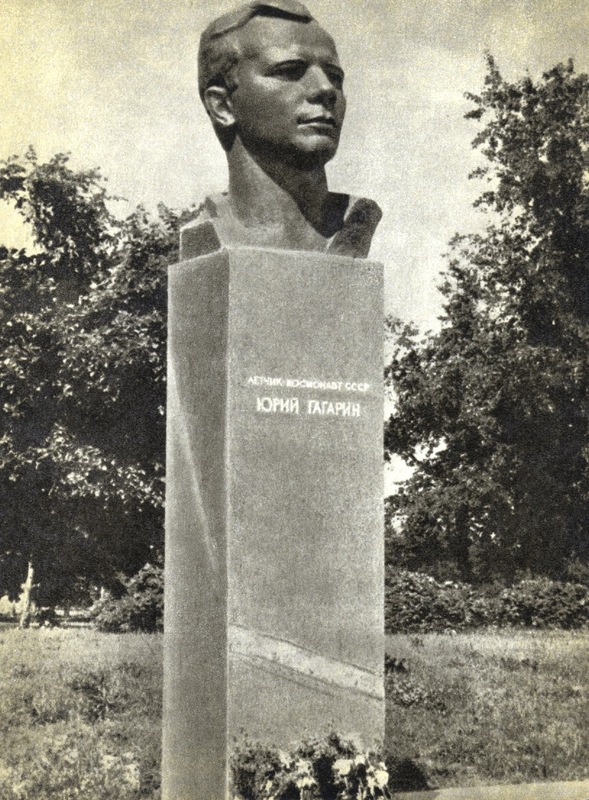 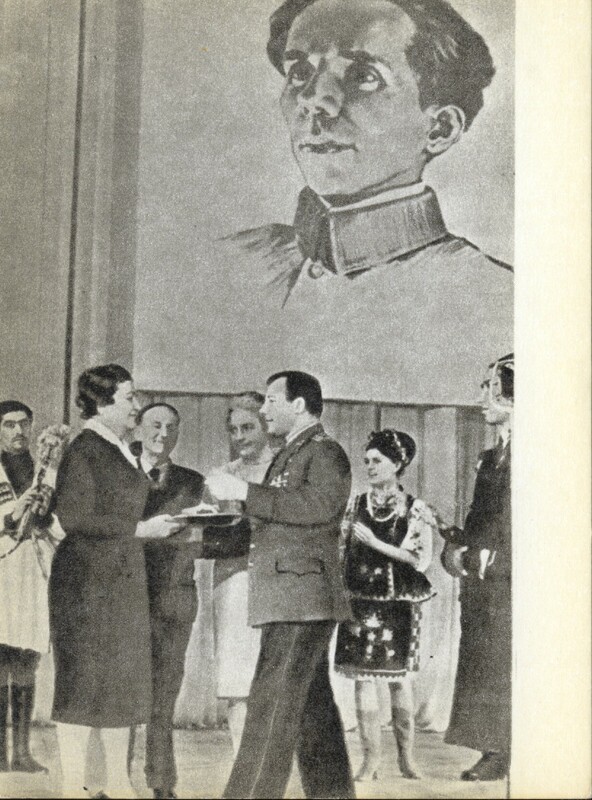 “In 1957 Kruschev declared socialist realist architecture the “over-decorated” style and abolished the Academy of Architecture. 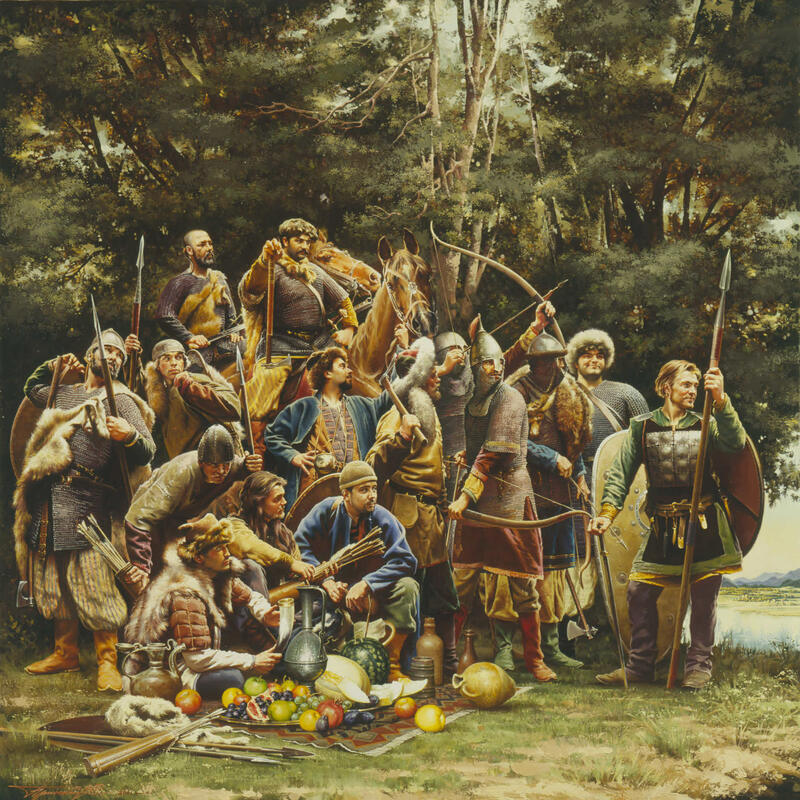 the notion of a critically assimilated cultural heritage (i.e. 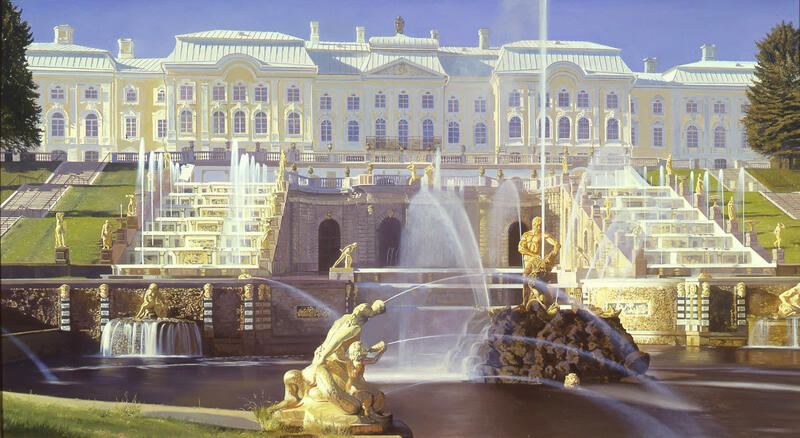 the reuse of classical forms to serve modern ideological ends) was replaced by a doctrine of unadorned utilitarianism. 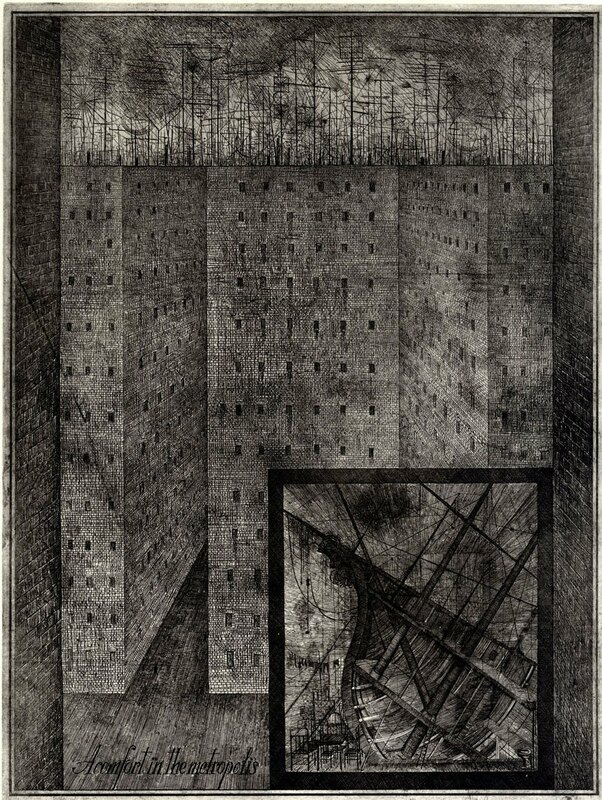 modern technology, especially prefabrication, was exploited to produce the urgently needed mass housing and aesthetic discourse of any kind was considered unnecessary and immoral. 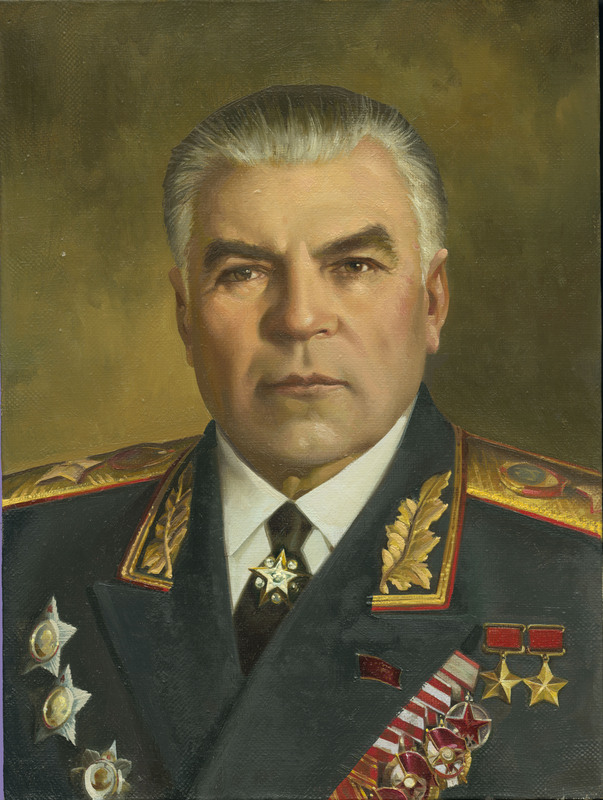 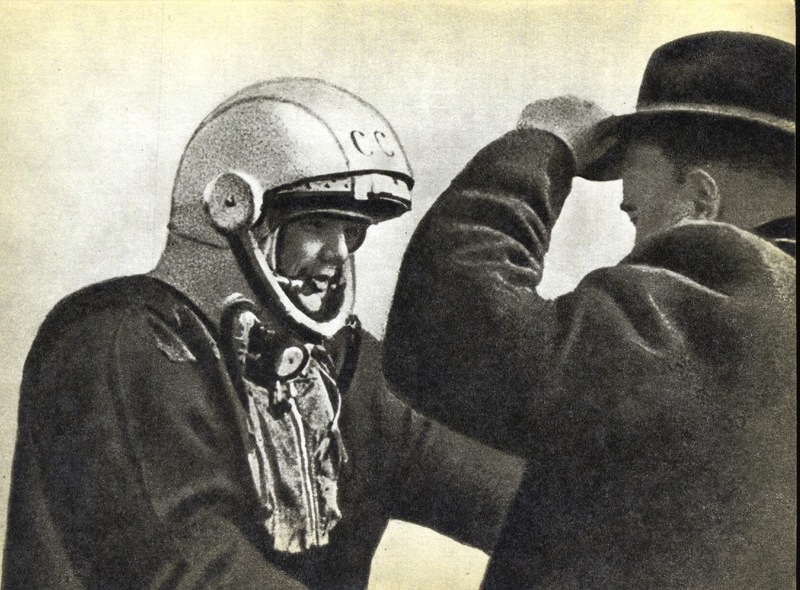 faceless functionalism continued to dominate throughout the Brezhnev years as economic constraints, a hopelessly tangled bureaucratic procedure, a dearth of building materials, and a shrinking body of skilled laborers exacerbated unimaginative planning. 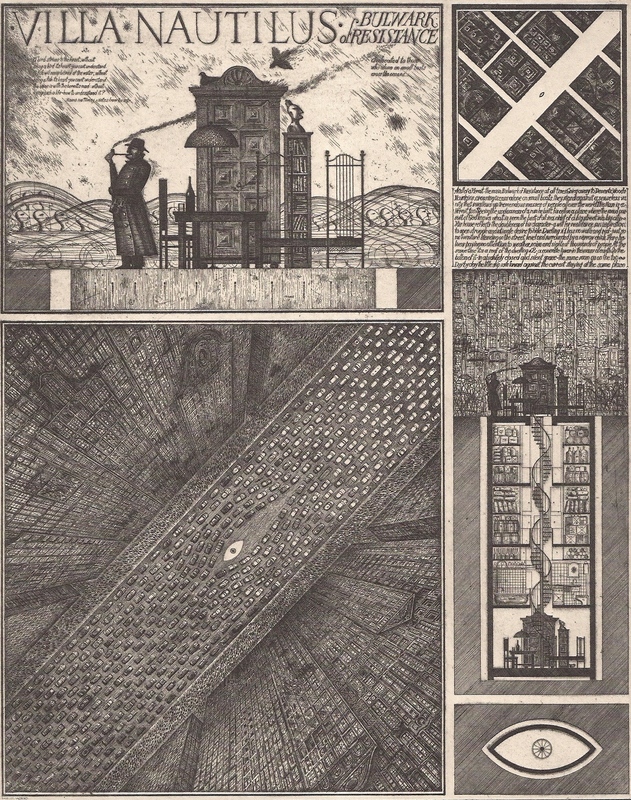 this scenario confronted Brodsky and Utkin and their classmates at the moscow institute of architecture in the mid-seventies. 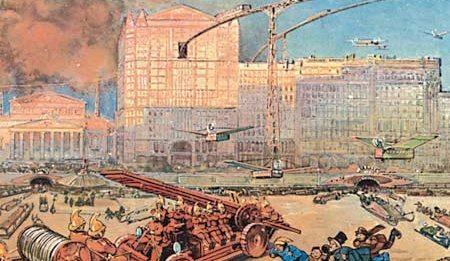 many of the more creative young Soviet designers abandoned the exasperating professional situation they found themselves in while others like Brodsky and Utkin began using international competitions as a creative outlet. 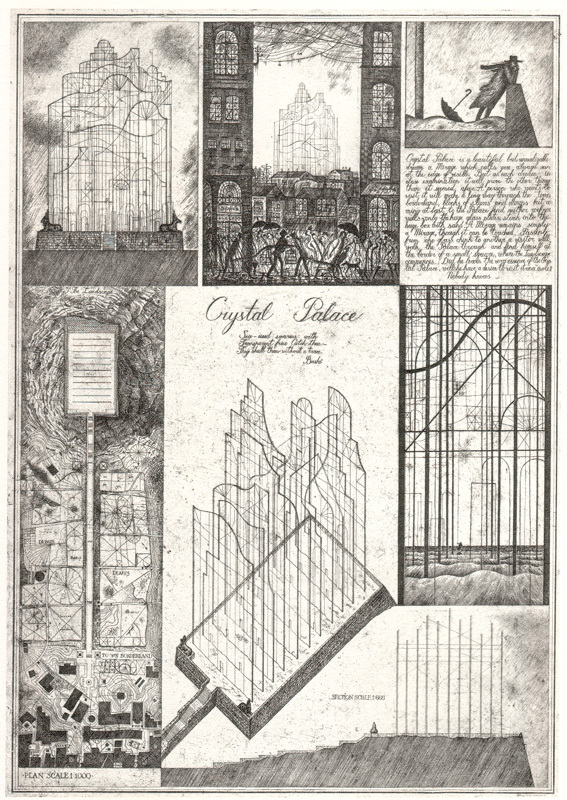 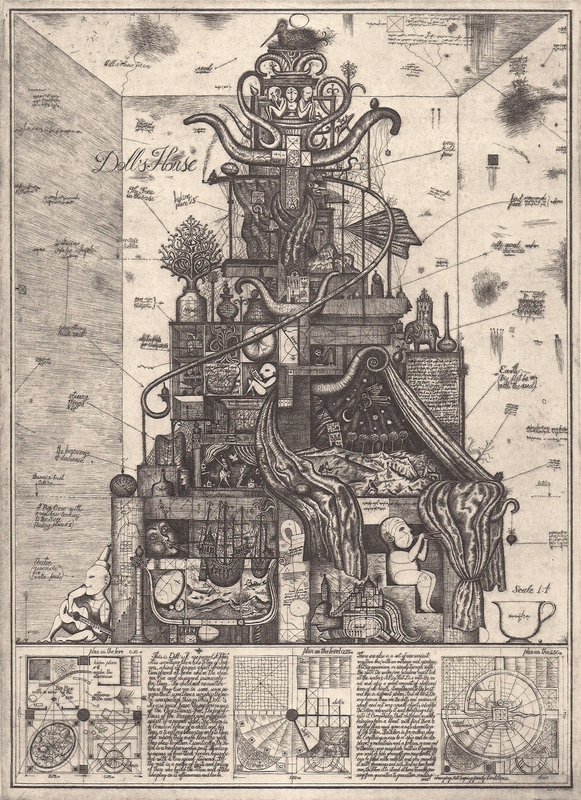 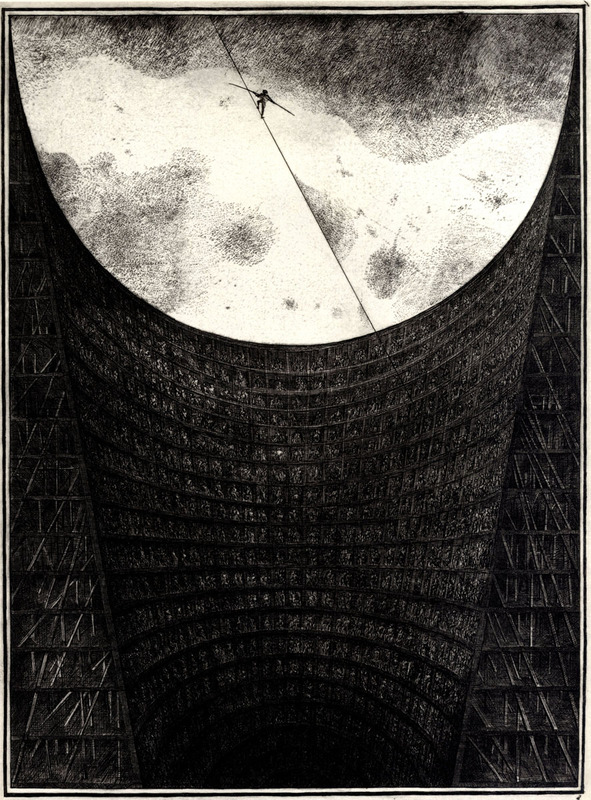 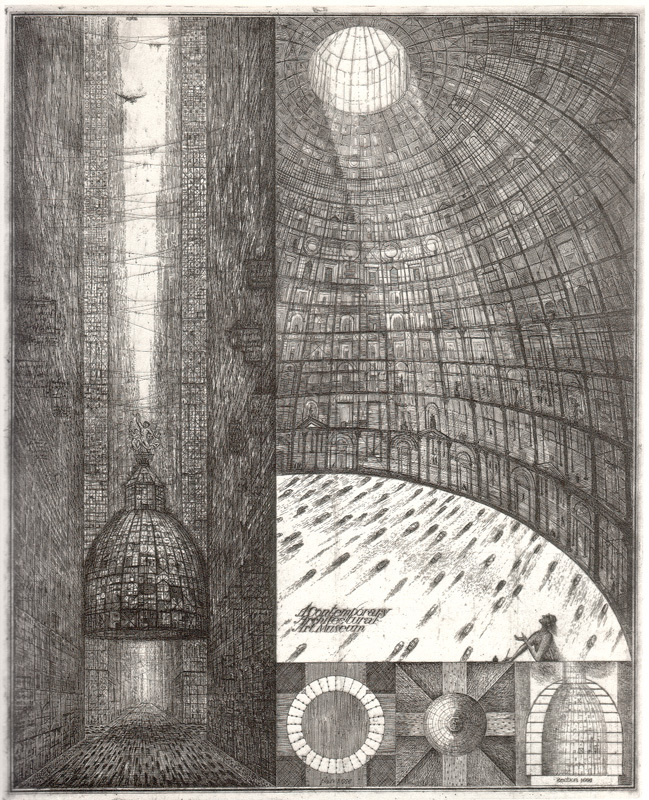 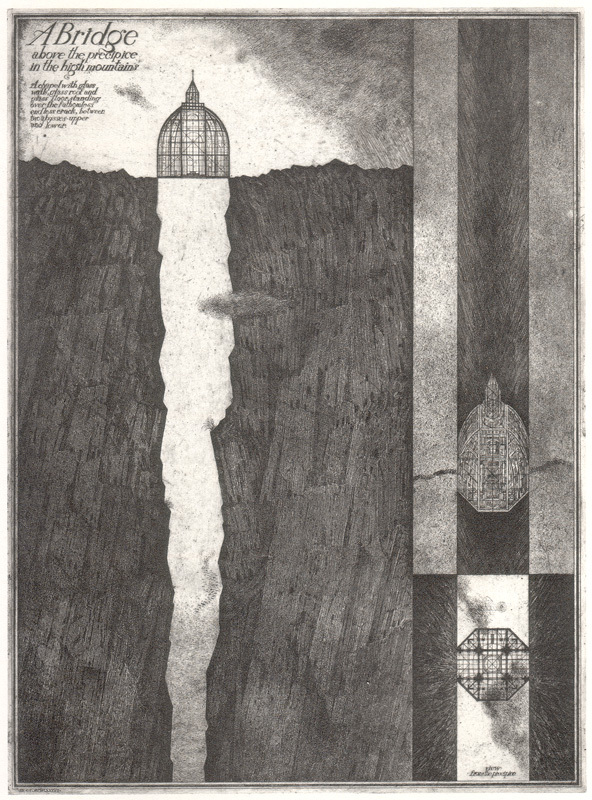 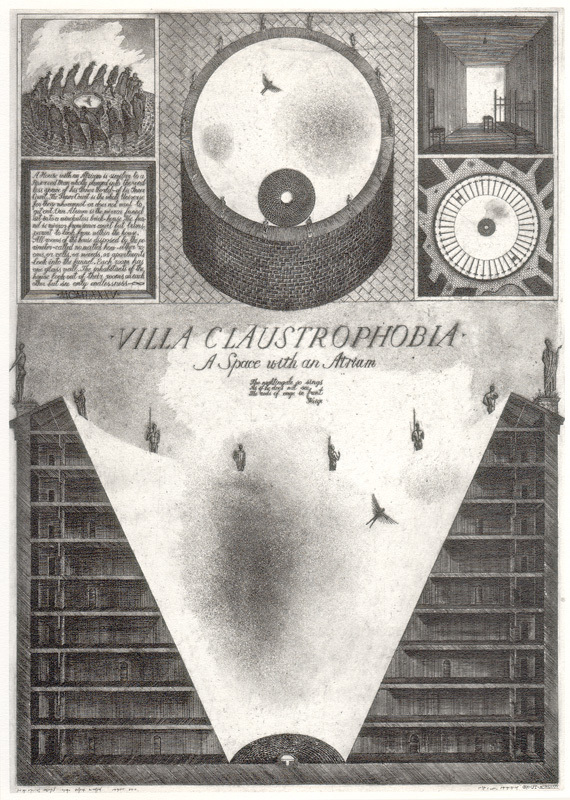 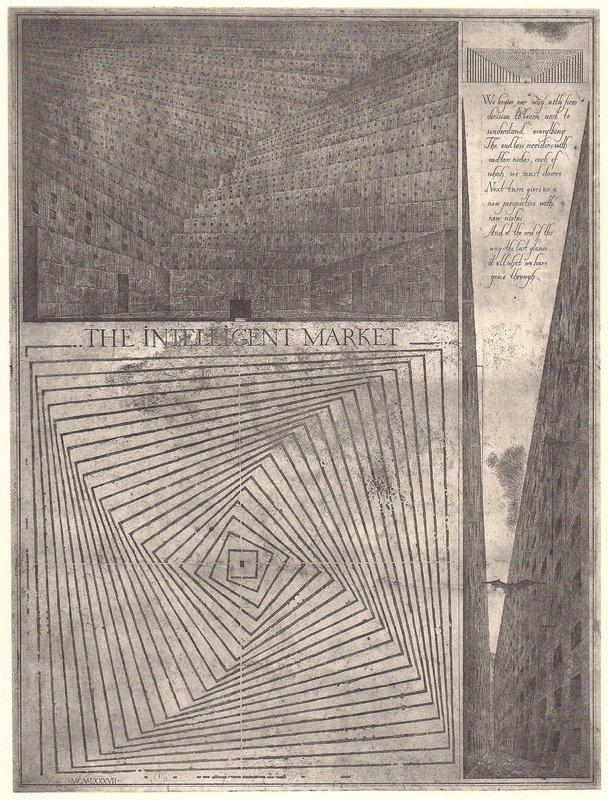 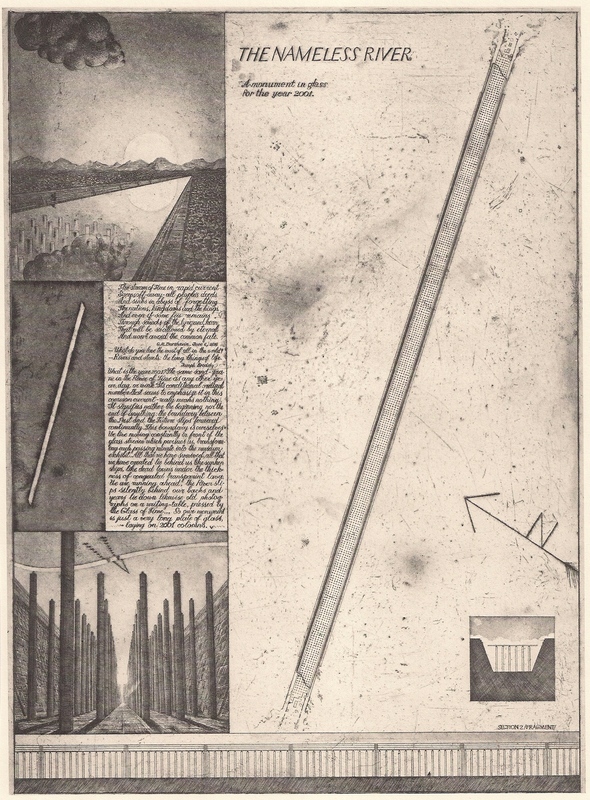 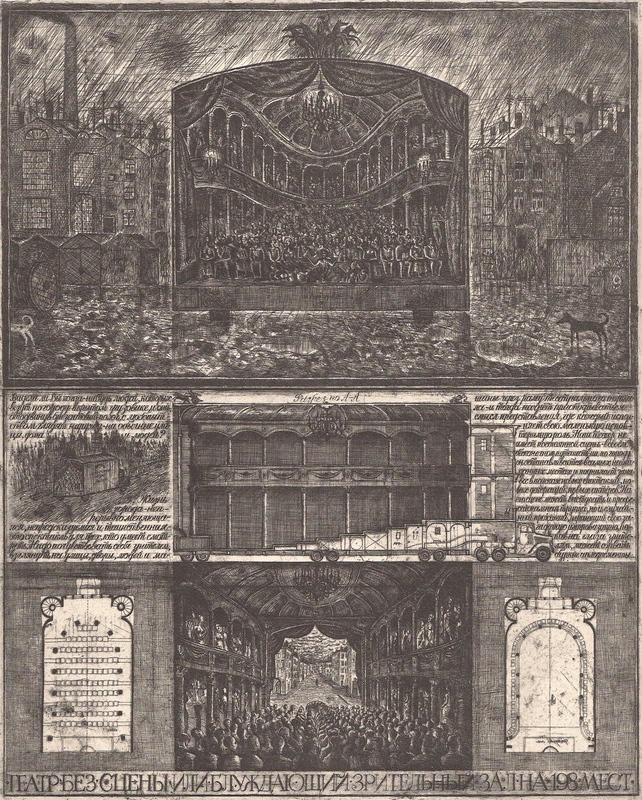 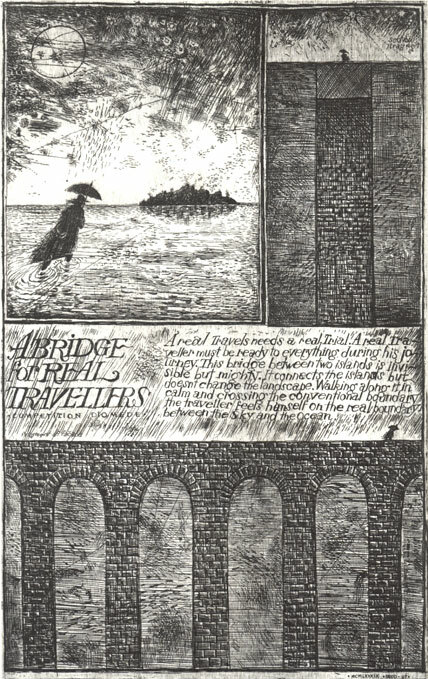 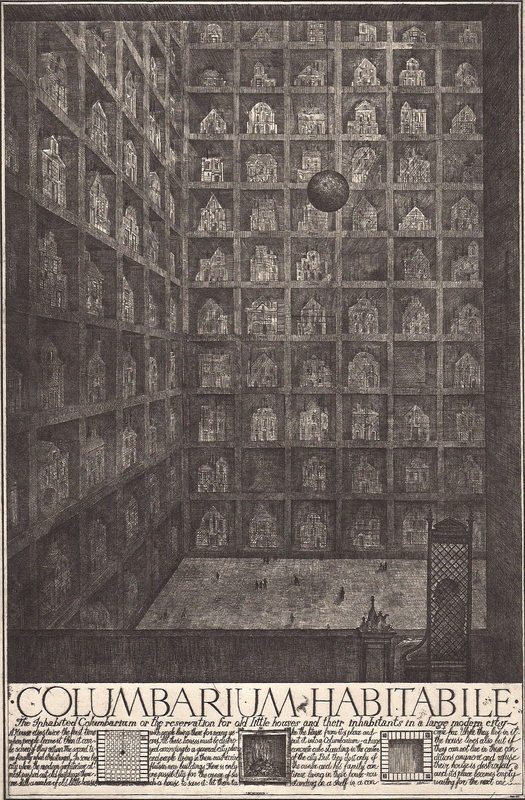 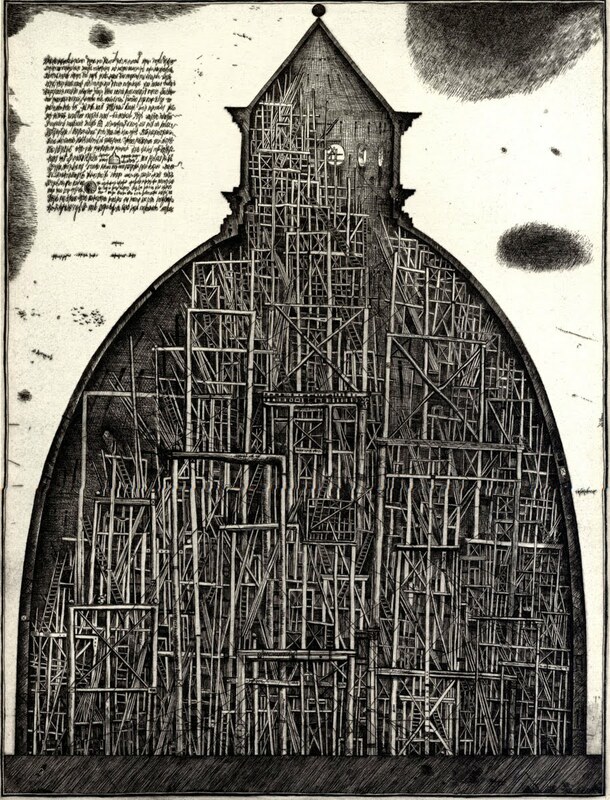 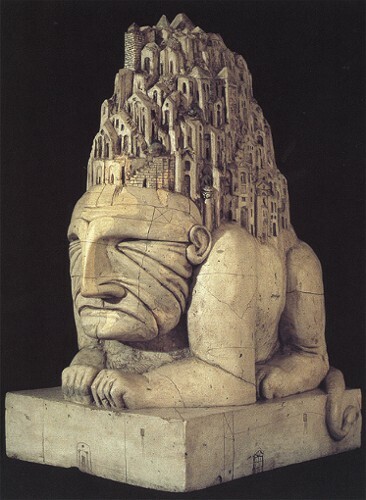 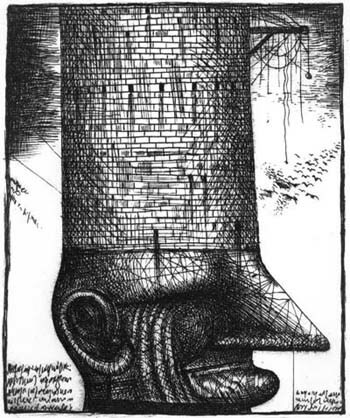 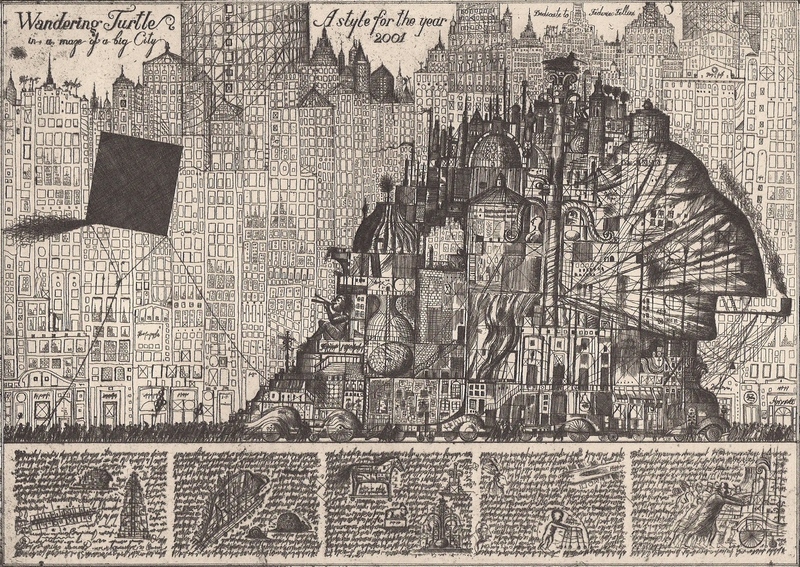 as Brodsky and Utkin and a dozen or so other friends began to produce such projects in evenings and weekends over the next few years, the group assumed the title of “paper architects” – a derogatory epithet applied to avant-garde architects still producing radical work after the socialist realist clampdown of the thirties. 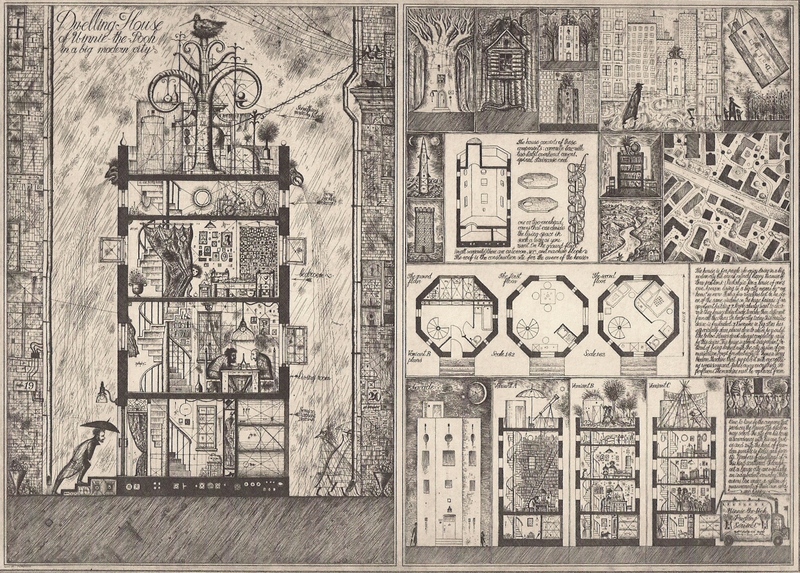 If anything, these drawings had been originally made to criticize Soviet architecture at the time and no doubt a way to express frustration at the challenges architects and workers in other fields were forced to endure as a result of sudden reforms and decisions from the government. 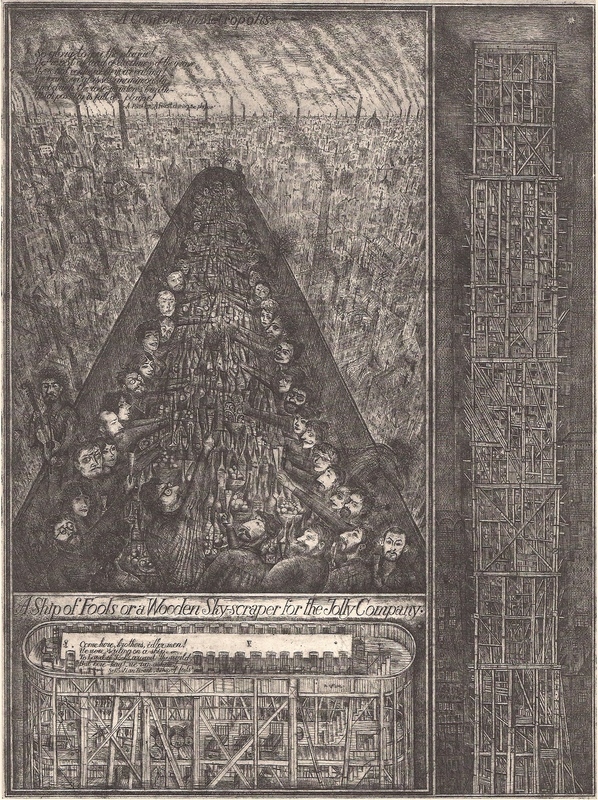 Because of paper shortages and lack of proper materials, the Paper Architects created etchings on plates of copper, yet one may still notice the careful attention to detail in every drawing, probably one of the reasons for their popularity. 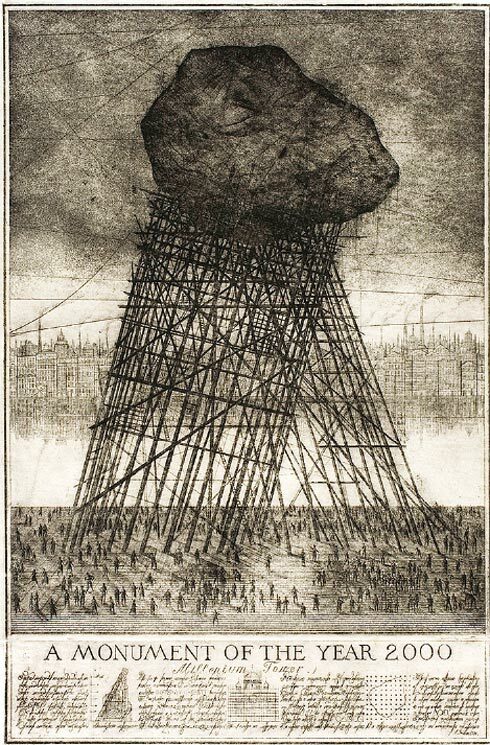 The drawings themselves depict everything from bleak cityscapes to unwise decisions in design, and are most likely metaphors understandable only from the perspective of a Soviet architect or perhaps just someone who has lived in the USSR (as one does not need an education in design to understand the all-too-common flaws of industrialized Soviet construction). 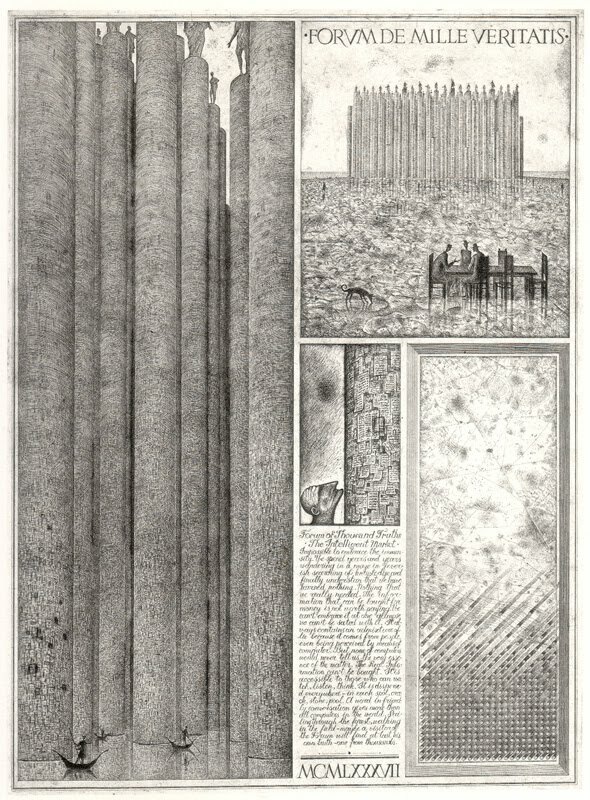 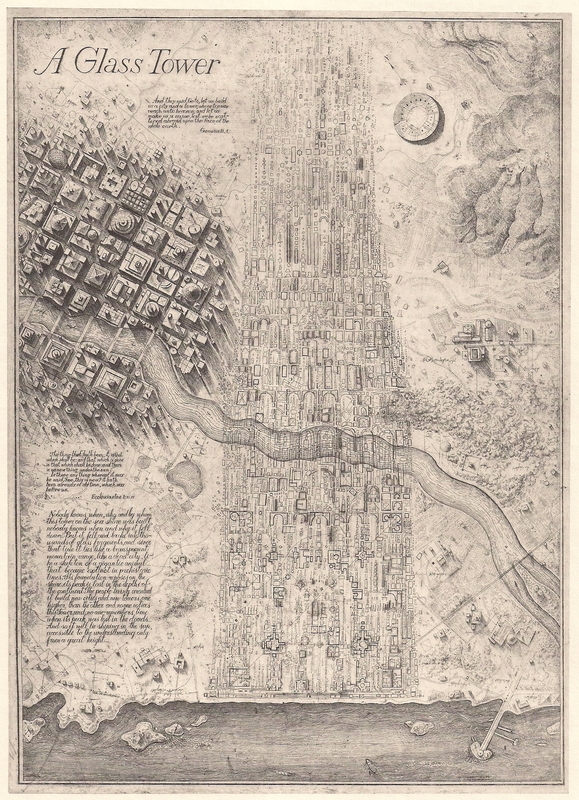 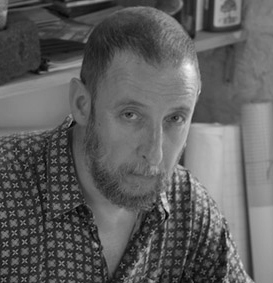 Today, the two have pursued their own interests, choosing to split up in 1993 and while Brodsky is generally the more active of the two, their work among the Paper Architects is nonetheless a profound example of their ingenuity, which ultimately turned their misfortunes as architects into success as artists. 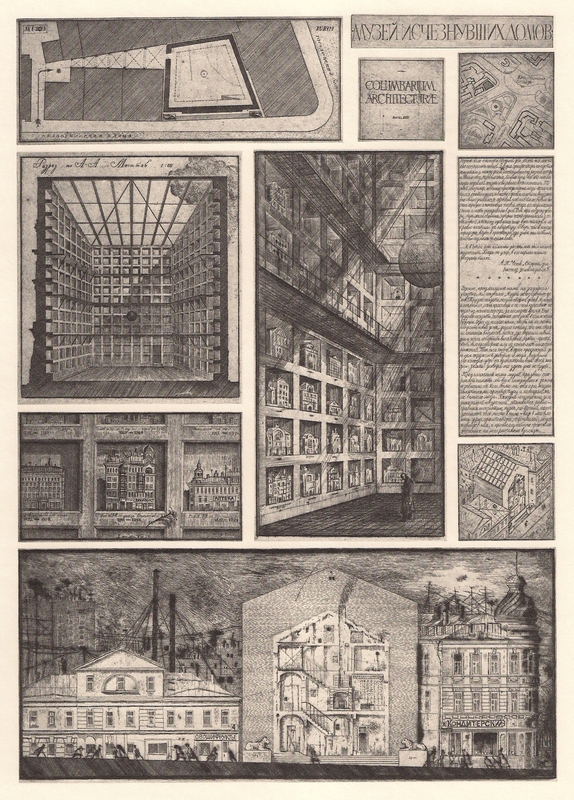 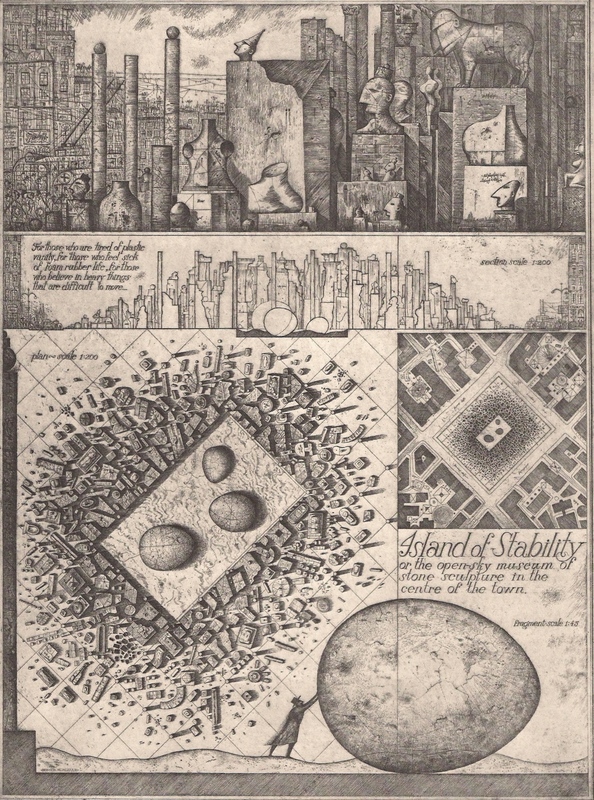 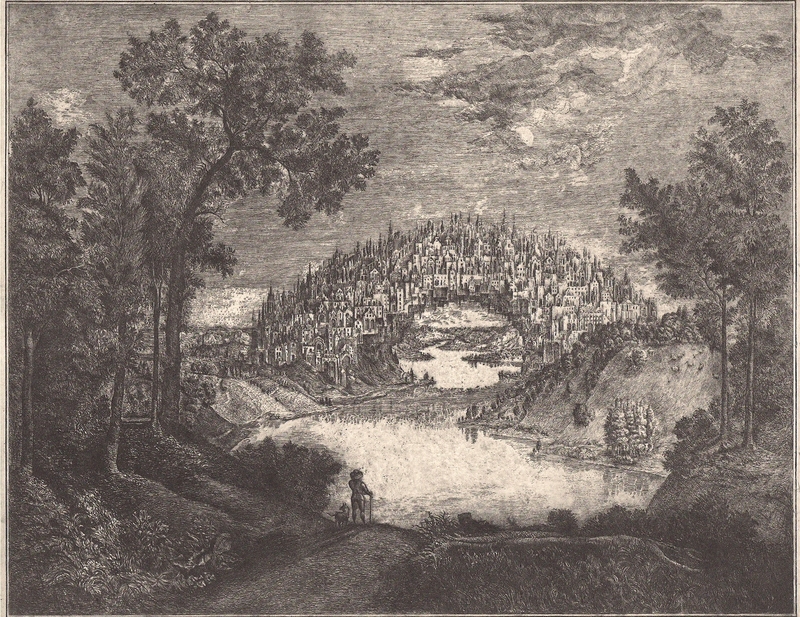 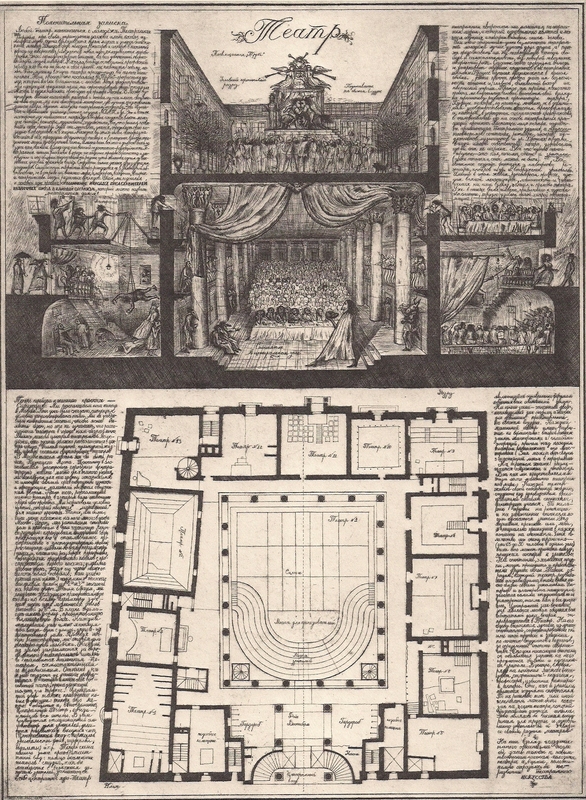 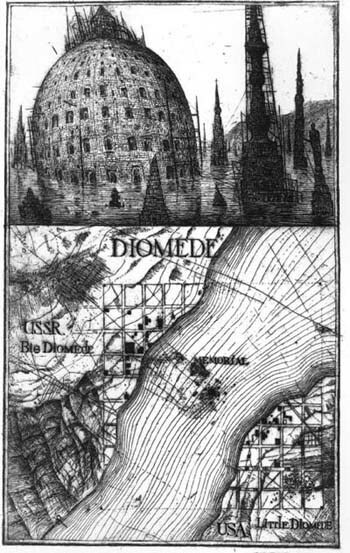 Below are several of these famous etchings, presented in great size and detail (If I am correct, these are scans and had originally come from the book published on the Paper Architect’s etchings). 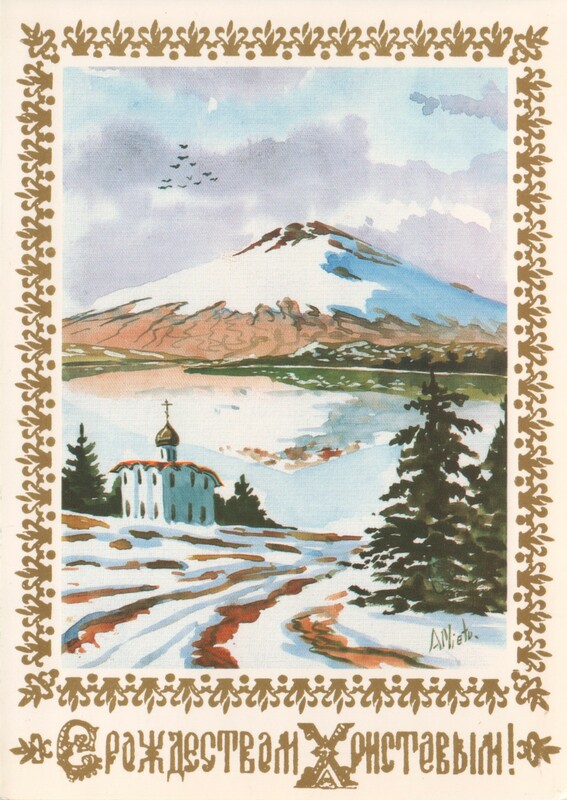 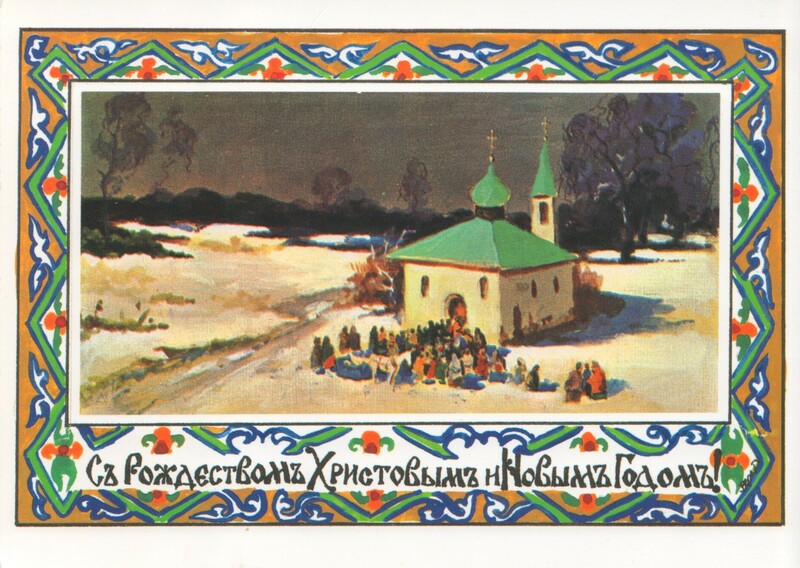 A couple of weeks ago, I happened upon several Christmas cards at a local bookstore which I regularly visit, which were published and made here in the United States, mostly by the Holy Trinity Monastery in Jordanville, New York. 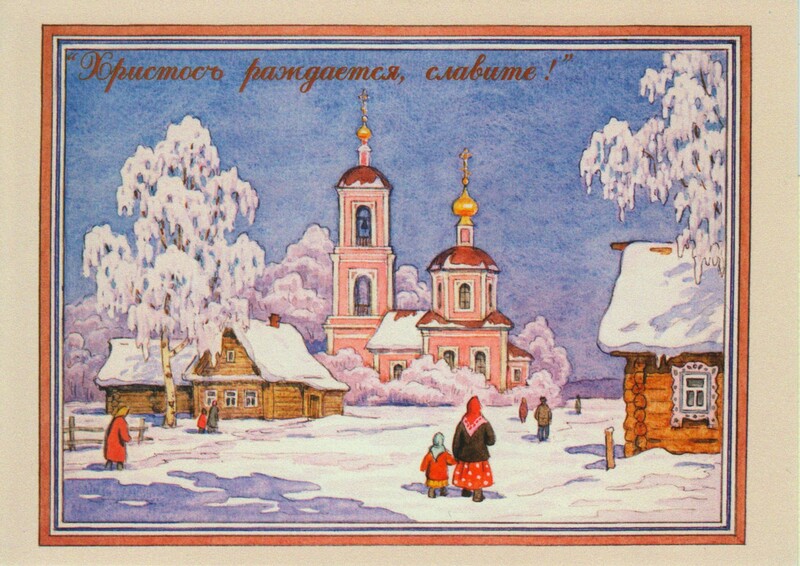 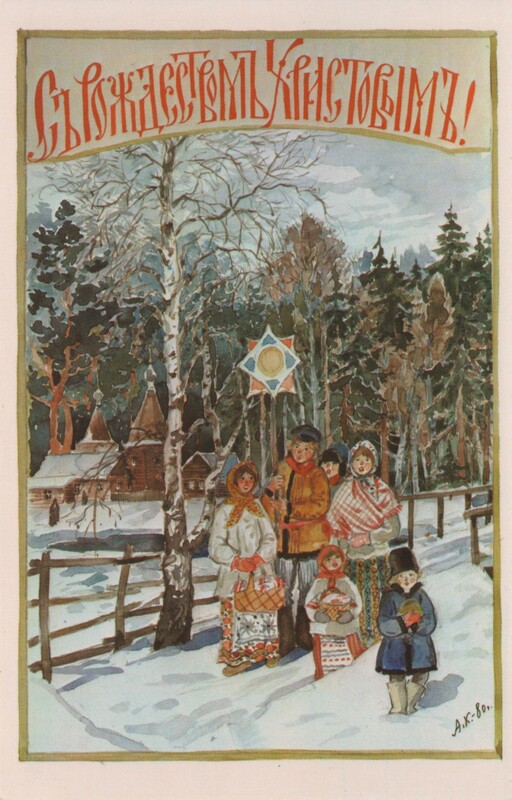 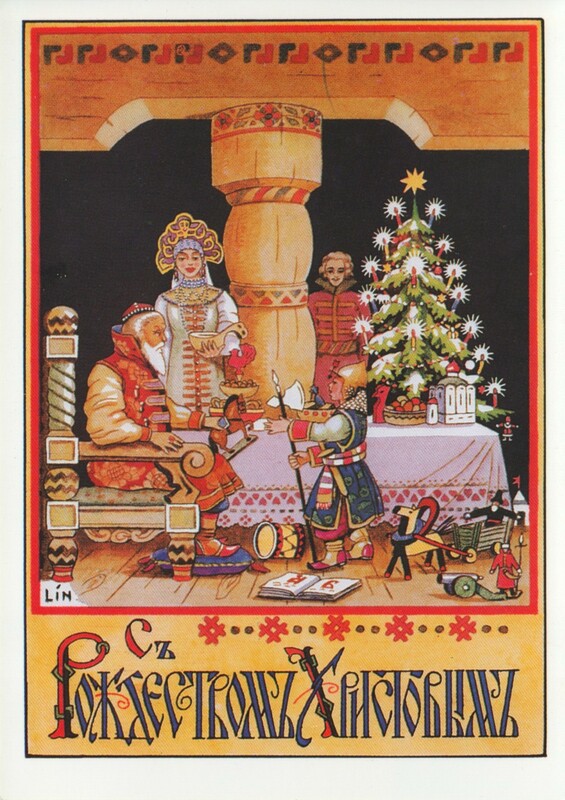 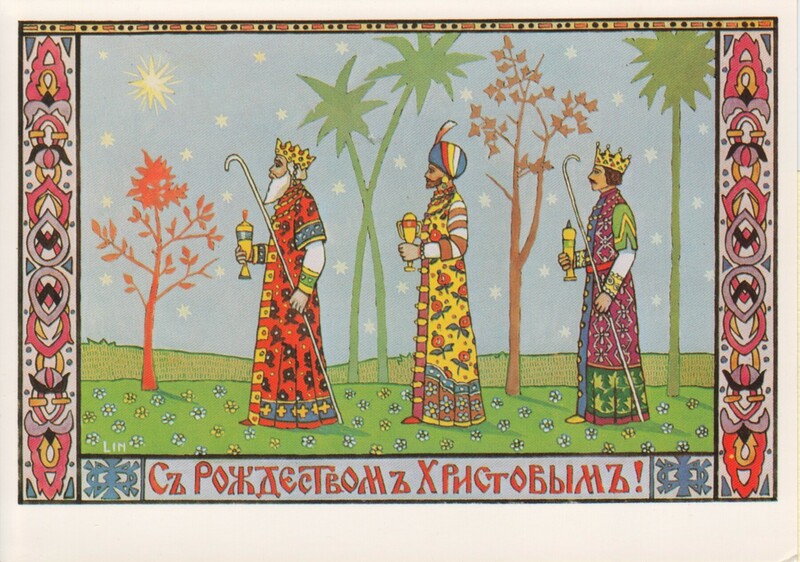 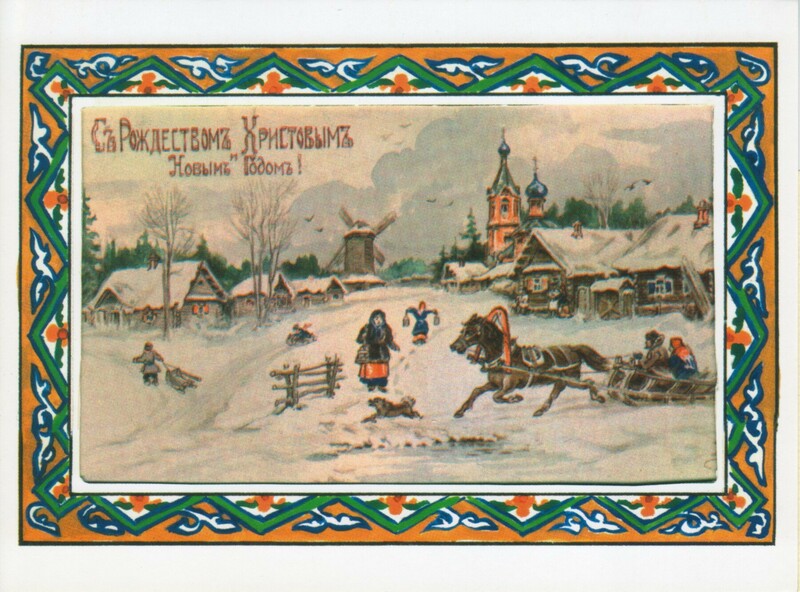 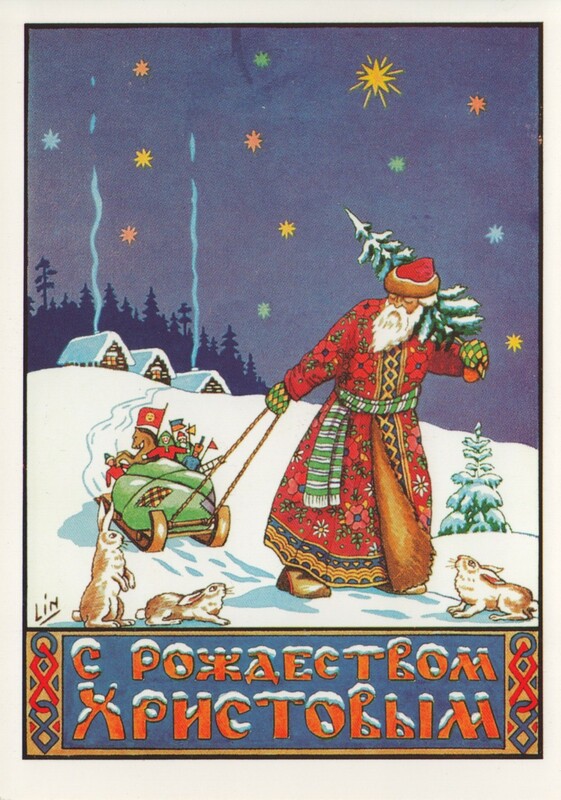 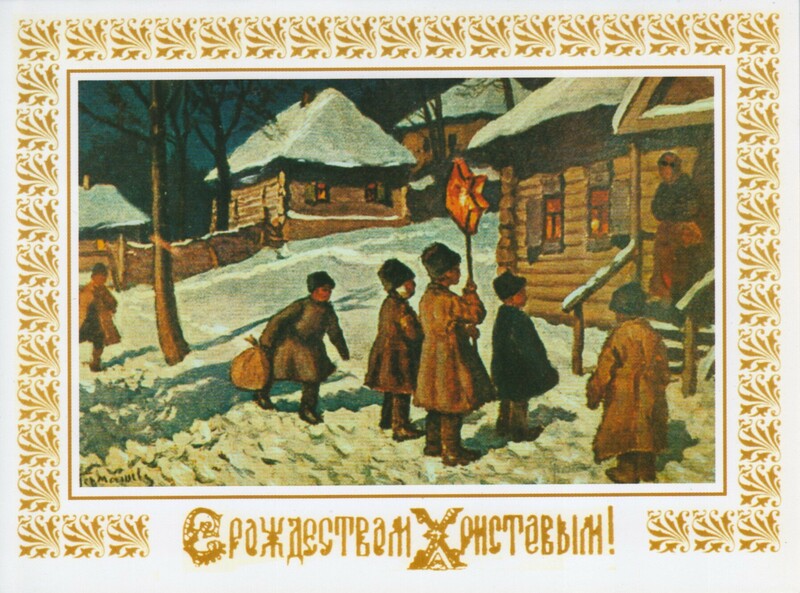 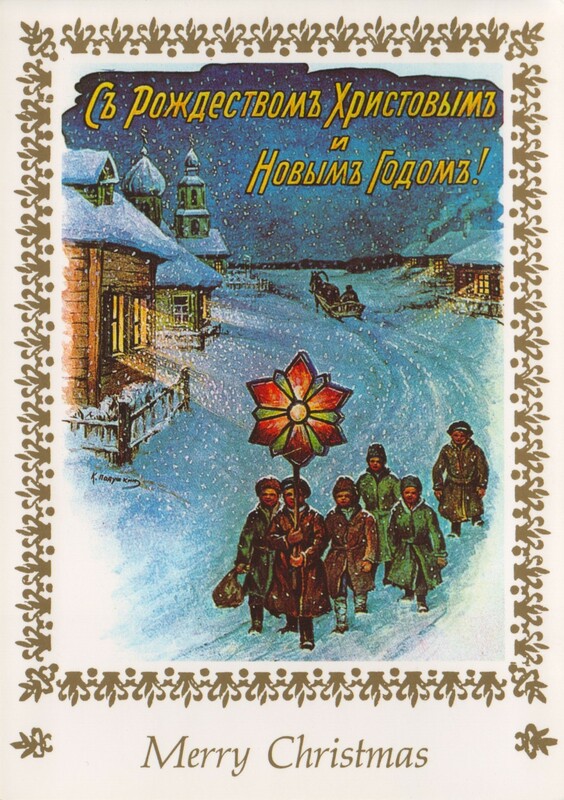 As you will see, the cards range from images of winter scenes to various symbols relating to the Russian celebration of Christmas, I’m particularly fond of the illustration of the Three Wise Men drawn with Slavic themes. 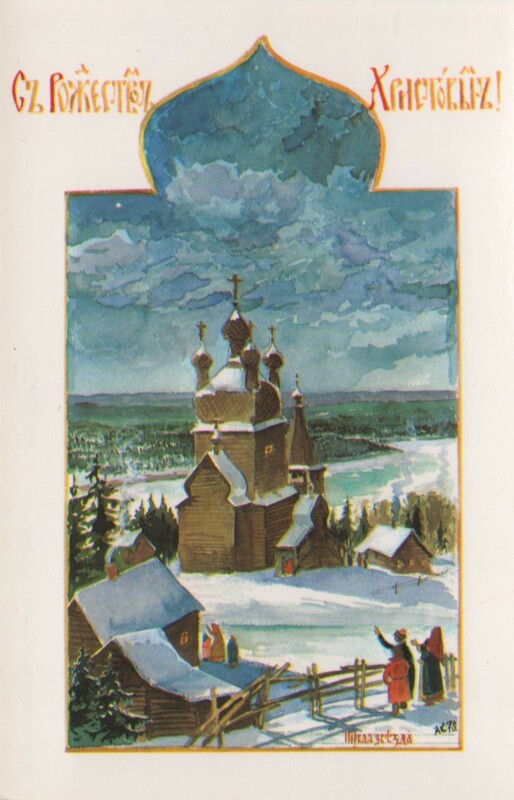 Knowing the rarity of finding such items on the internet, I bought several and would like to present these as a sort of gift to the readers in light of the Christmas season and especially to my Eastern Orthodox readers, who are today celebrating Christmas, myself included. 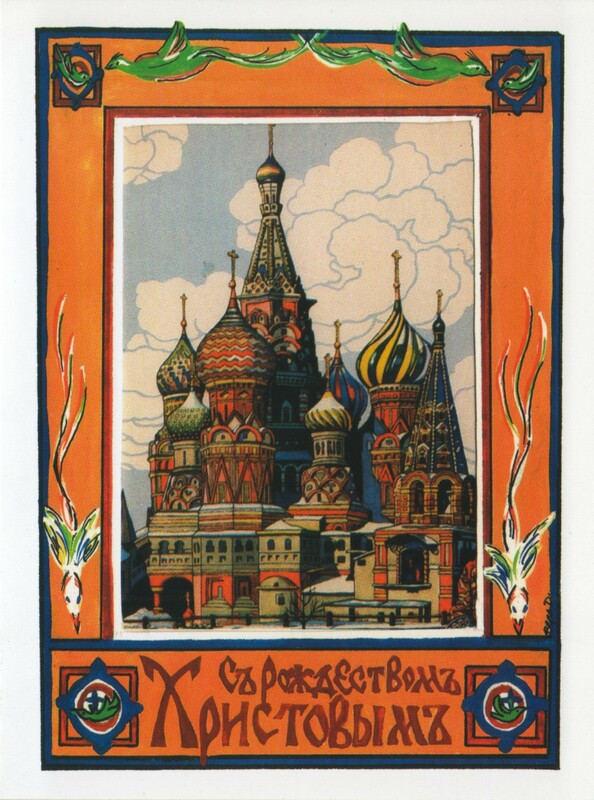 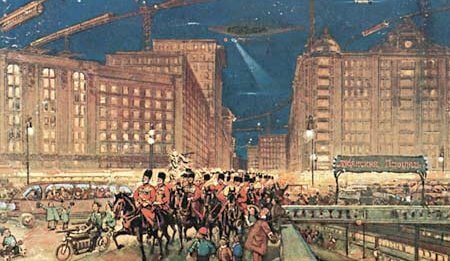 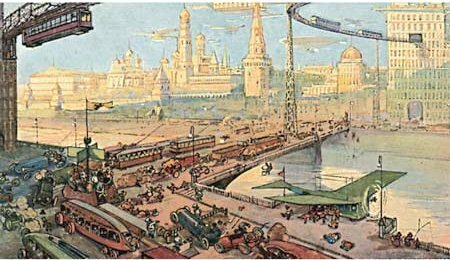 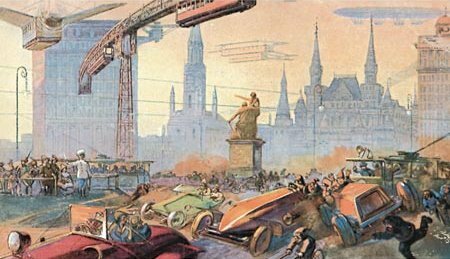 In 1914, prior to the Communist revolution, several postcards were made depicting how Moscow would have looked like in the future, still under monarchial rule. 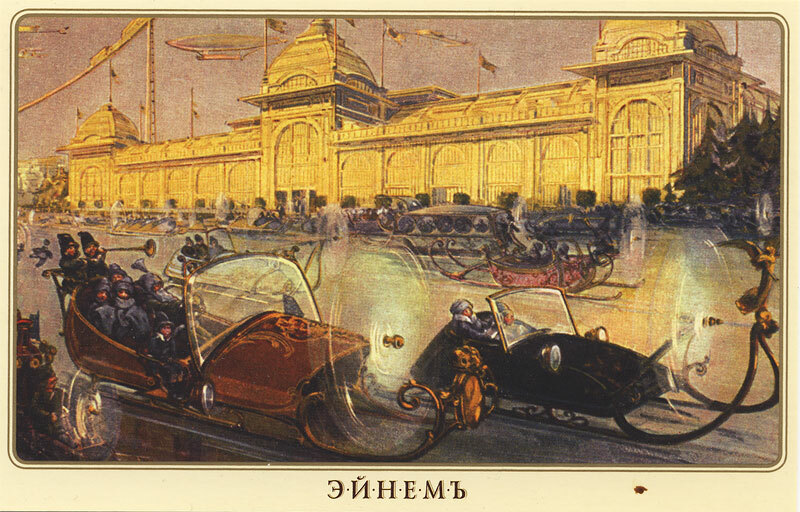 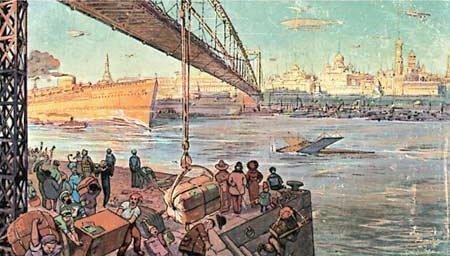 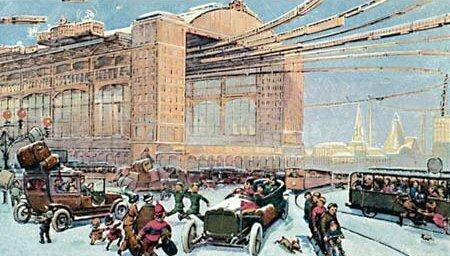 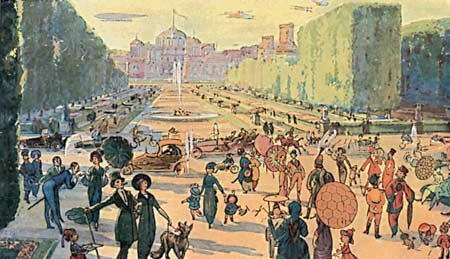 The postcards depict daily life in different parts of the city, with the addition of everything from subways to airborne public transportation, things probably seen as standard methods of transport for the future. 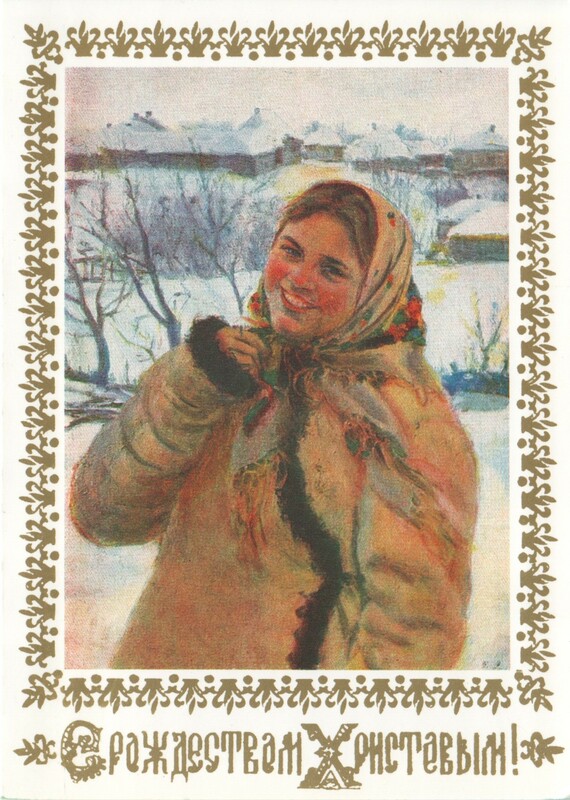 Several years ago, these postcards were apparently discovered after Eyinem, a chocolate company, included reprints of these in their products. 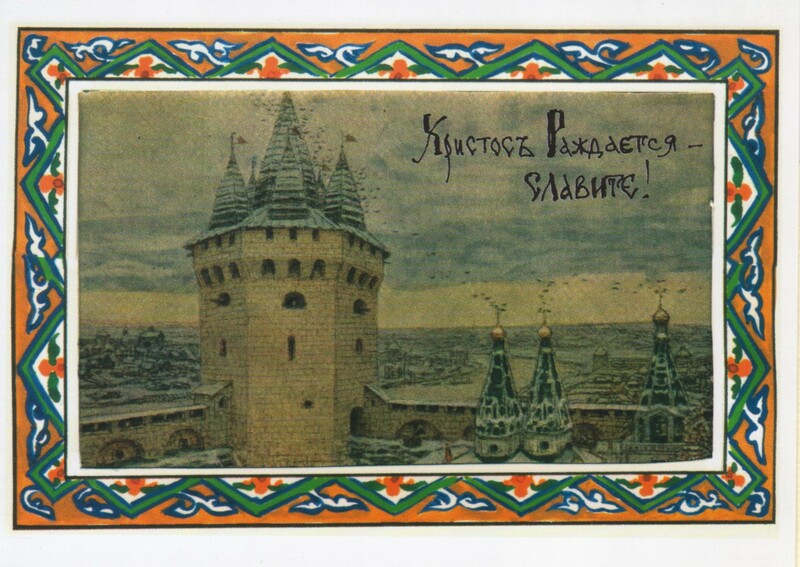 Since then, the postcards have been featured on several Russian blogs. 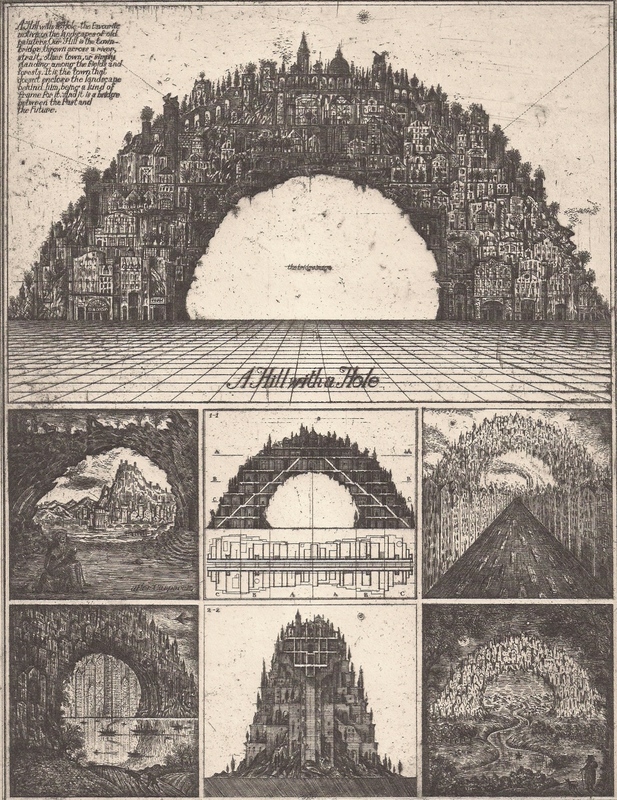 The entire set (or at least the only ones available on the internet) are below, albeit in low quality as I was not able to find the originals in any larger size. 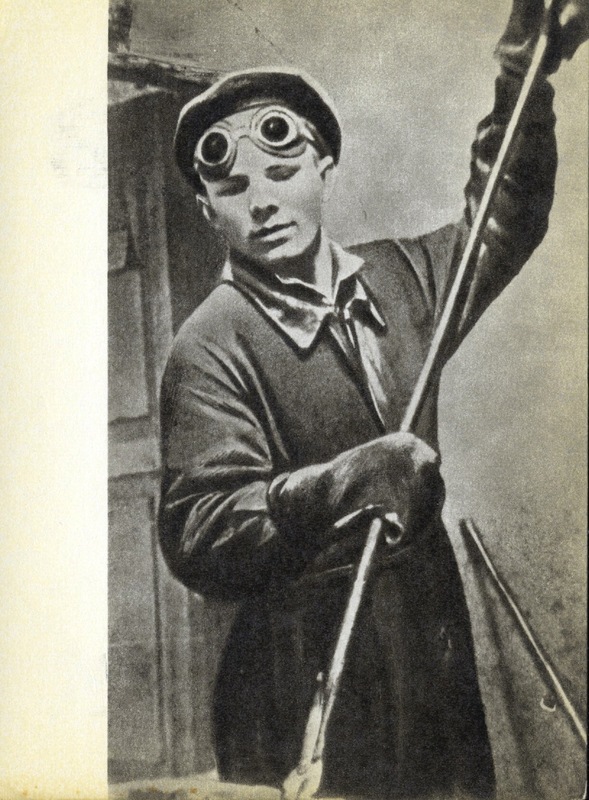 Accompanying captions originally included on the back of these cards have also been included here. 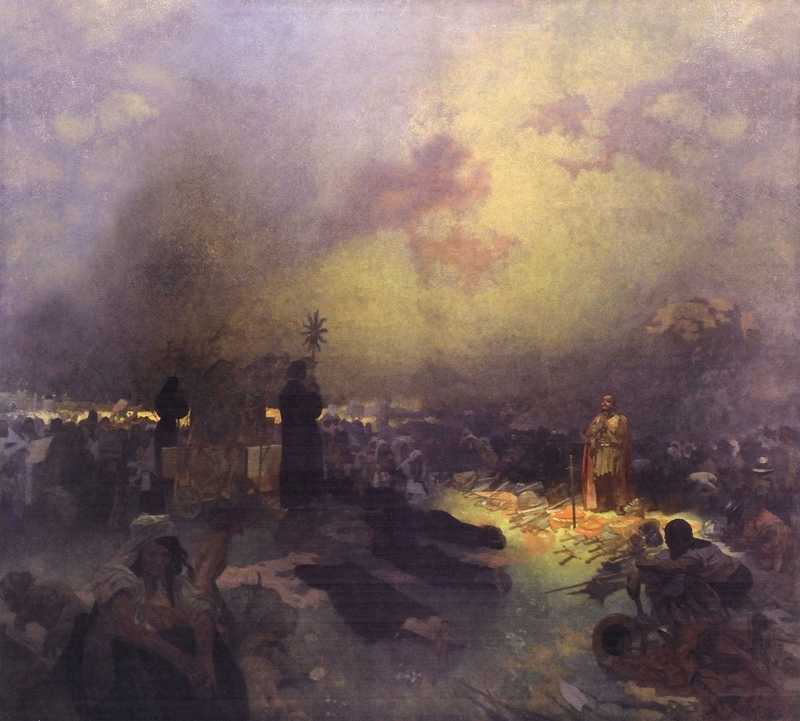 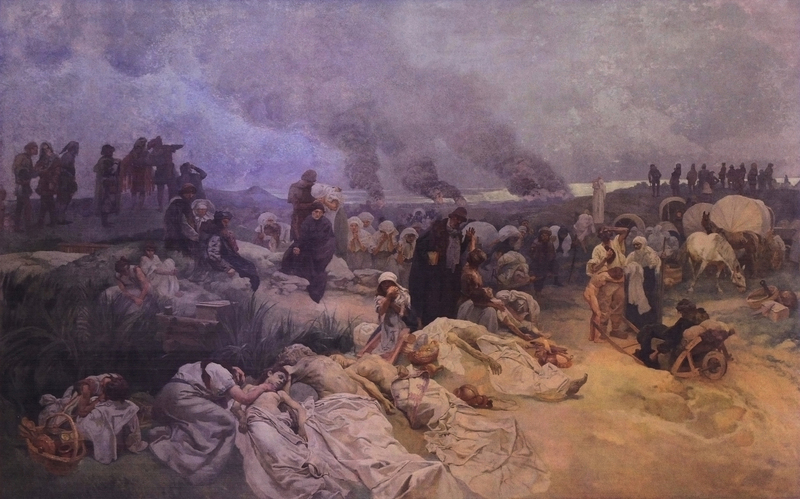 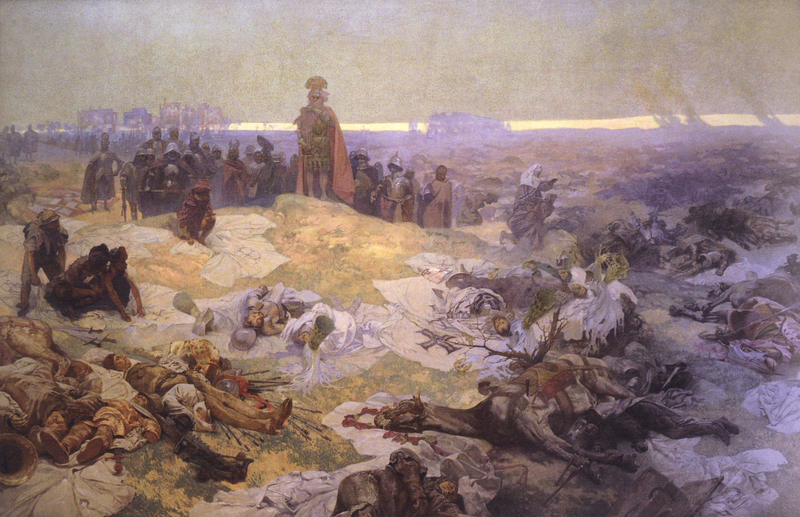 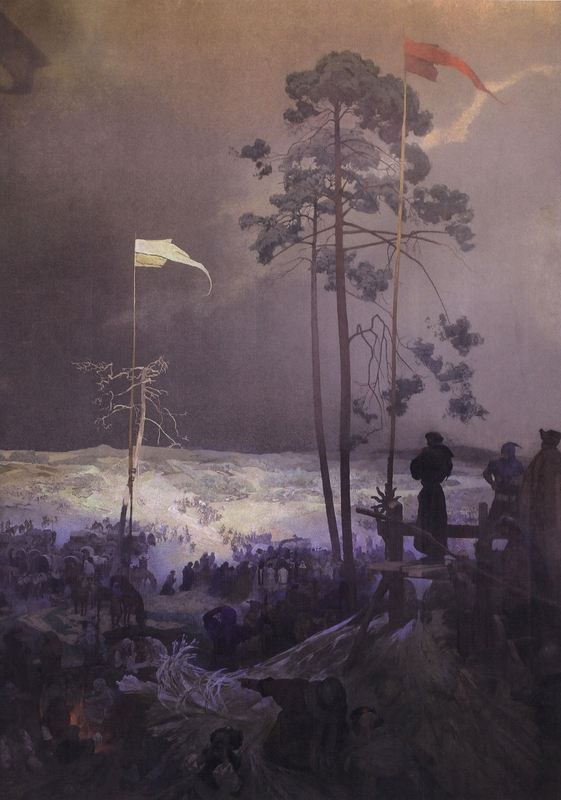 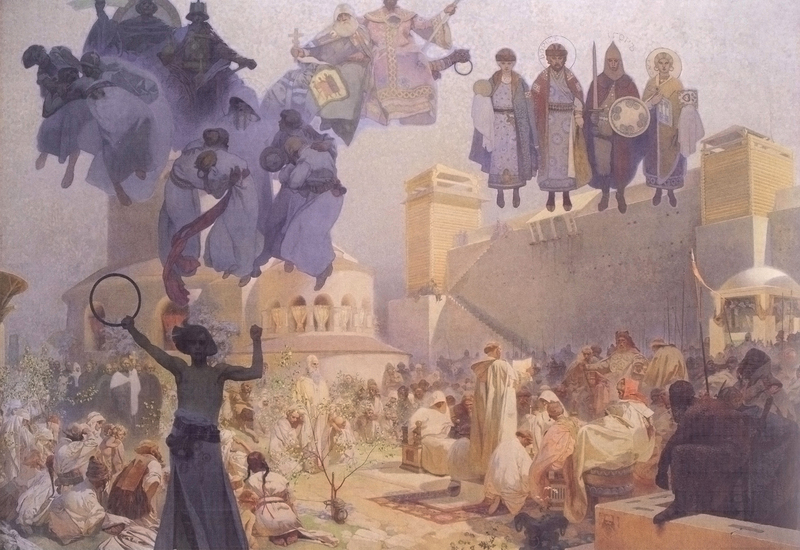 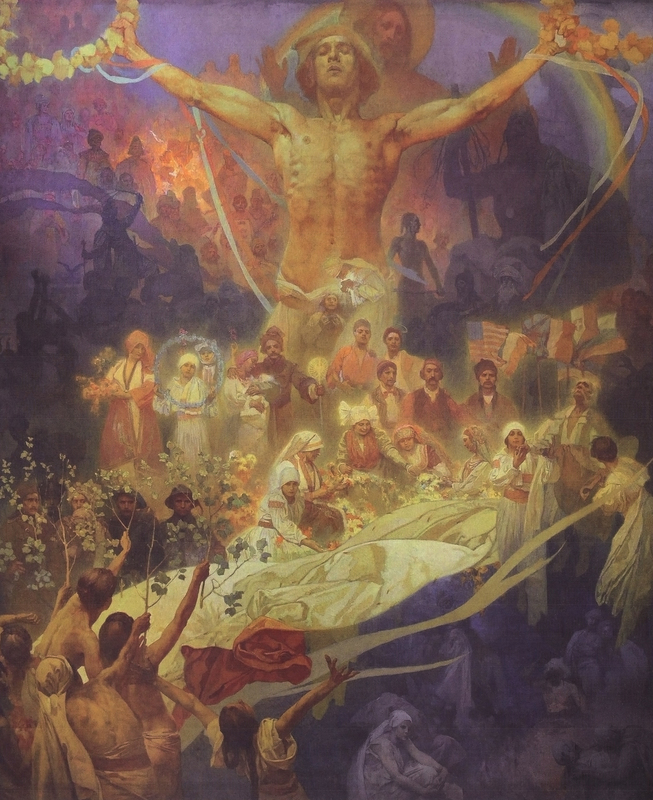 Those who are familiar with Czech artist Alphonse Mucha know of the vivid works he created during his time abroad, but few know of what he considered his greatest work of all, the Slav Epic (or Slovanska Epopej). 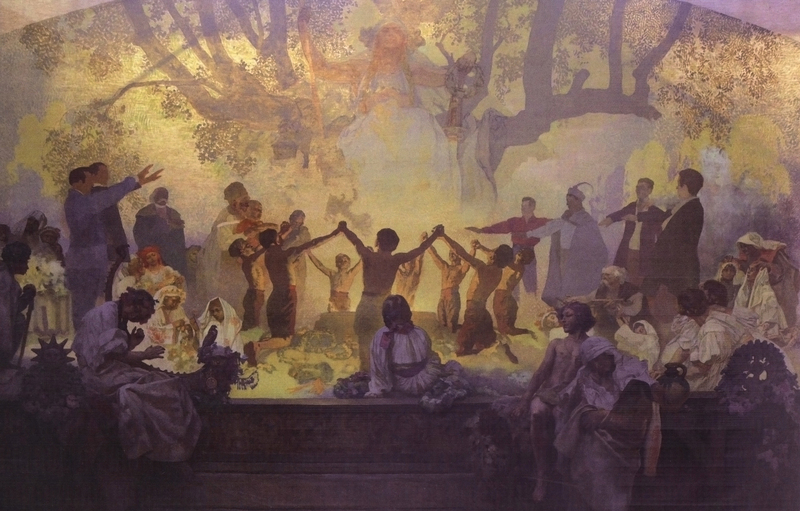 Through the course of sixteen years, Mucha had created twenty large paintings displaying various moments in history of the Slavic people. 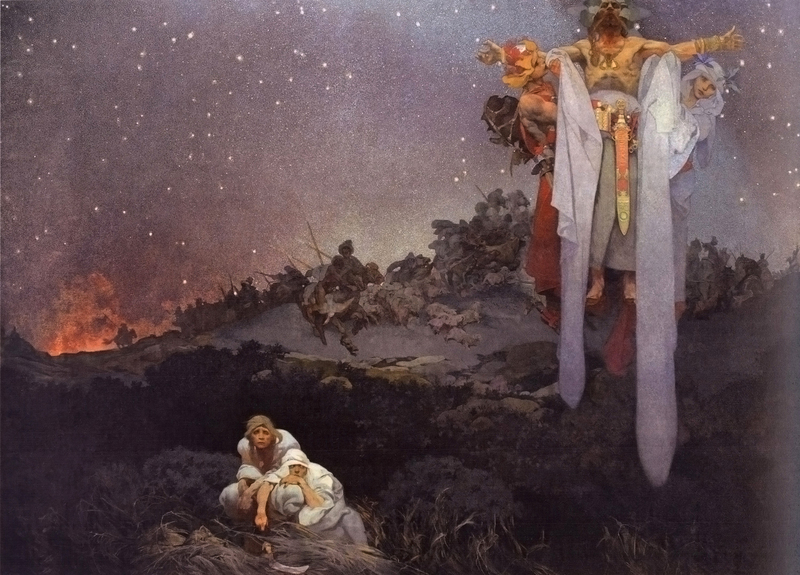 Unfortunately this great collection of works had hardly been brought to the attention of the rest of the world as a number of unfortunate circumstances prevented Mucha from seeing his life’s greatest work receive the praise it deserved. 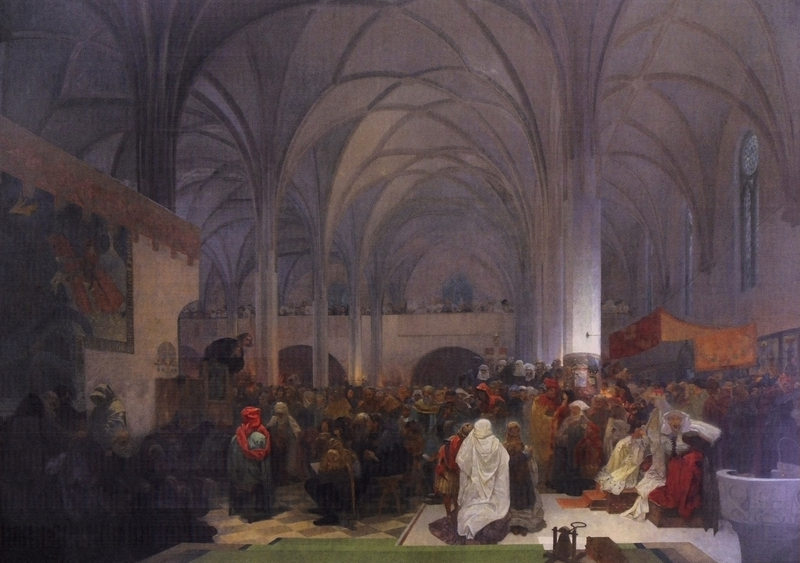 The Slav Epic had an ill-fated history. 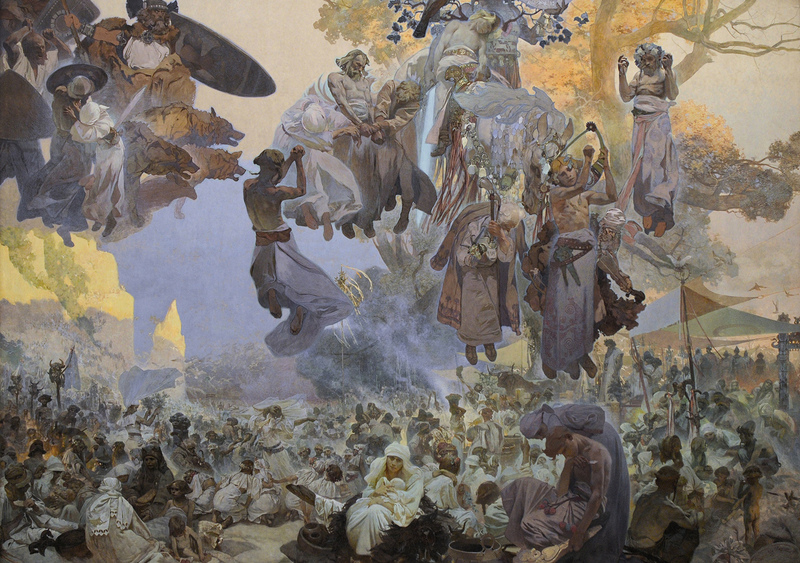 The series began in 1910 when Mucha had returned from Paris so that he may embark on the creation of what he saw would be his defining work. 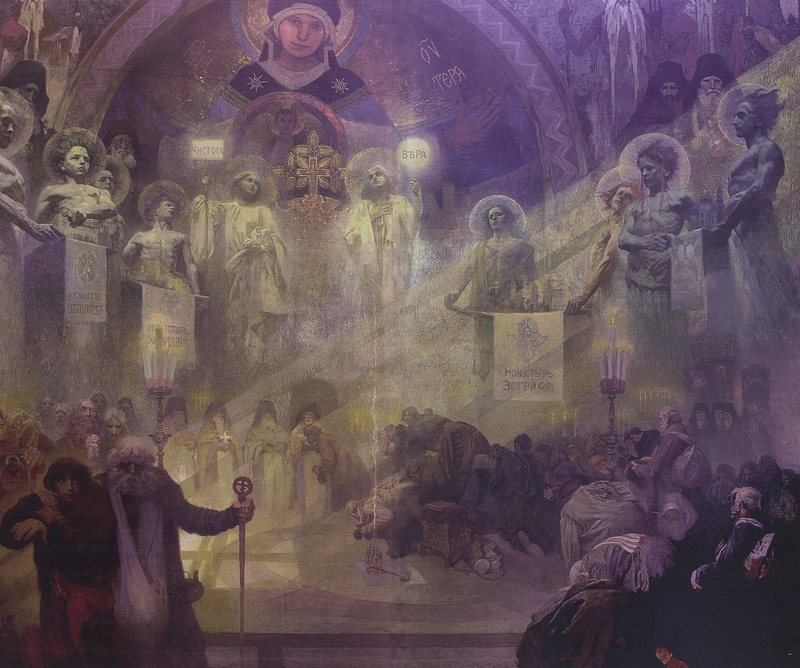 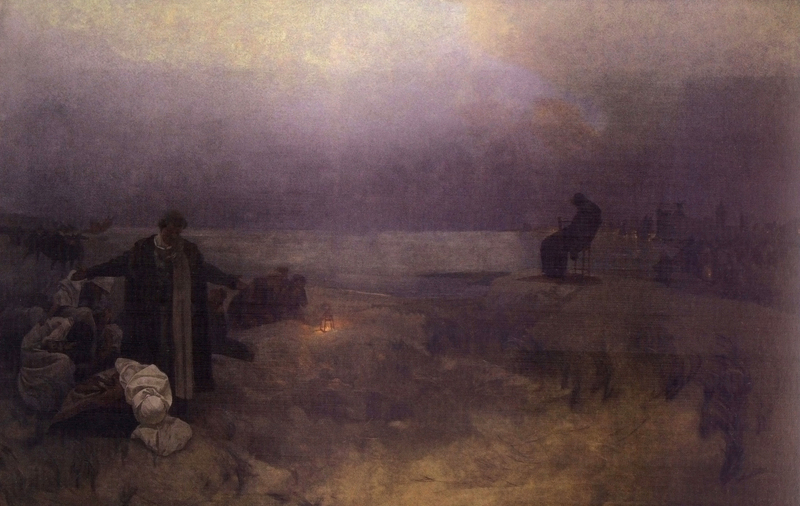 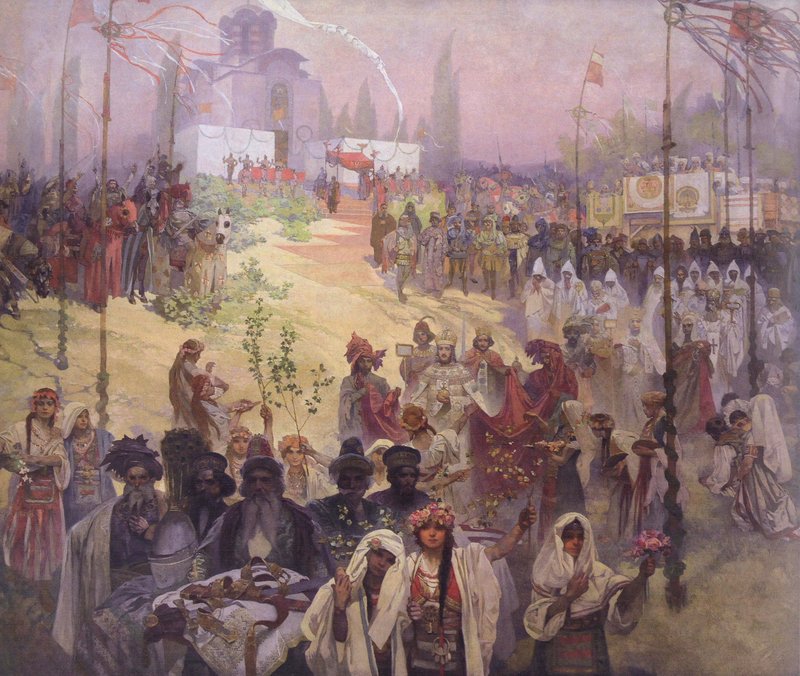 Before he began his work, Mucha had traveled across Russia, the Balkans, Poland, and the Orthodox monasteries on Mount Athos, consulting historians along the way to ensure accurate depictions of events in his works. 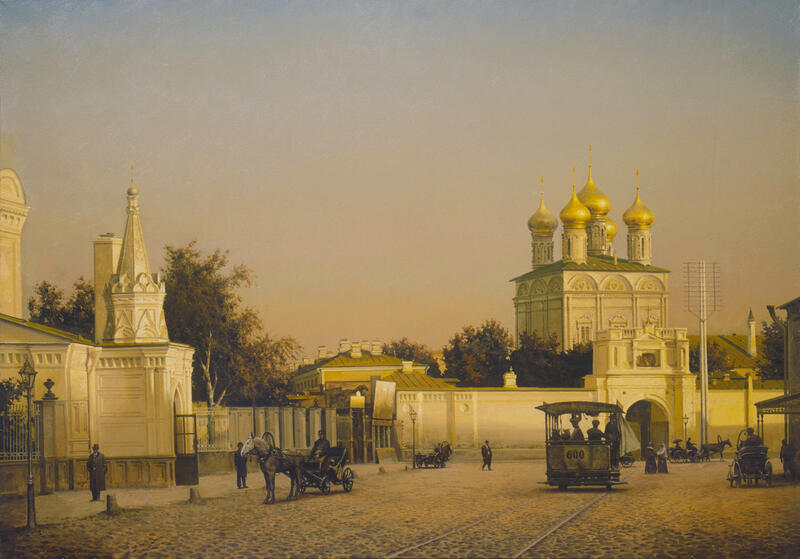 Two years later, he received funding from Charles Richard Crane, a wealthy businessman who had held an interest in Eastern Europe and Slavic nationalism in particular. 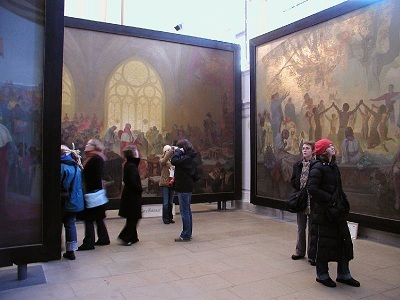 Over the course of seven years, Mucha had completed eleven works, which he presented in Prague, receiving much interest public from the public. 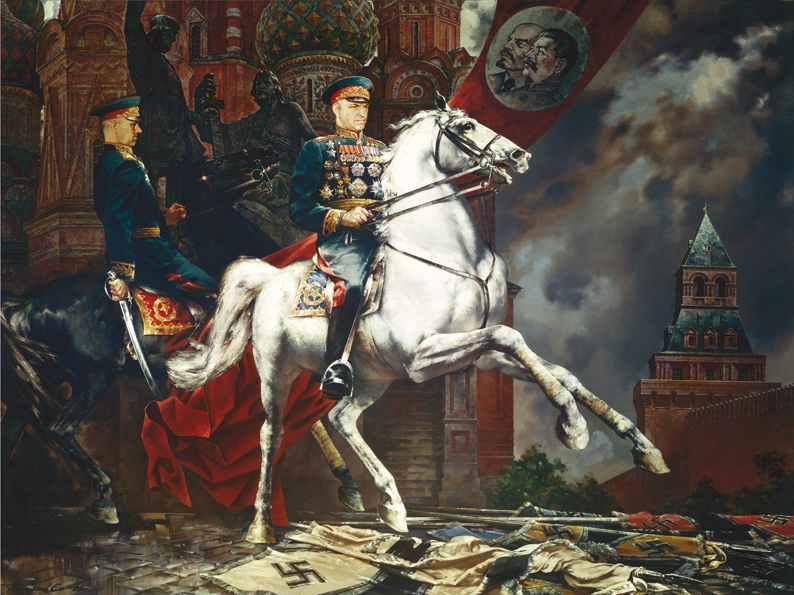 Unfortunately, critics were quick to label the work as an expression of an outdated, nationalistic style. 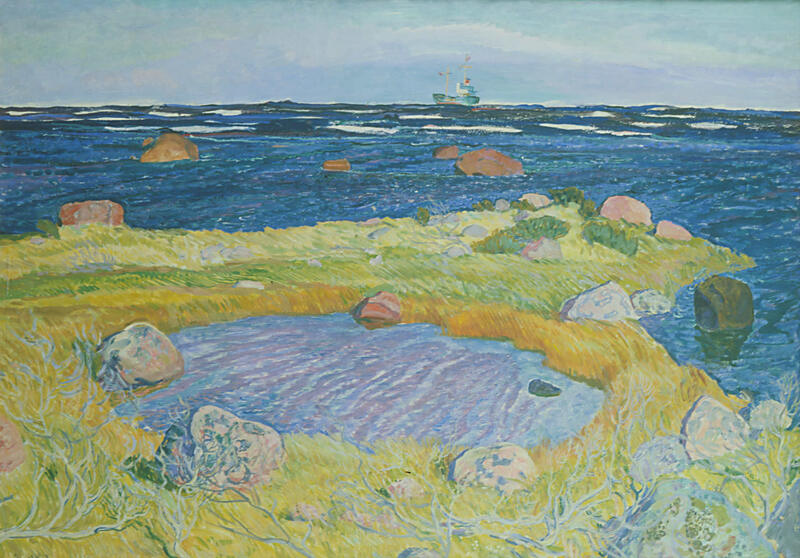 His full work had later been displayed in America and Czechoslovakia, although it received similar reactions. 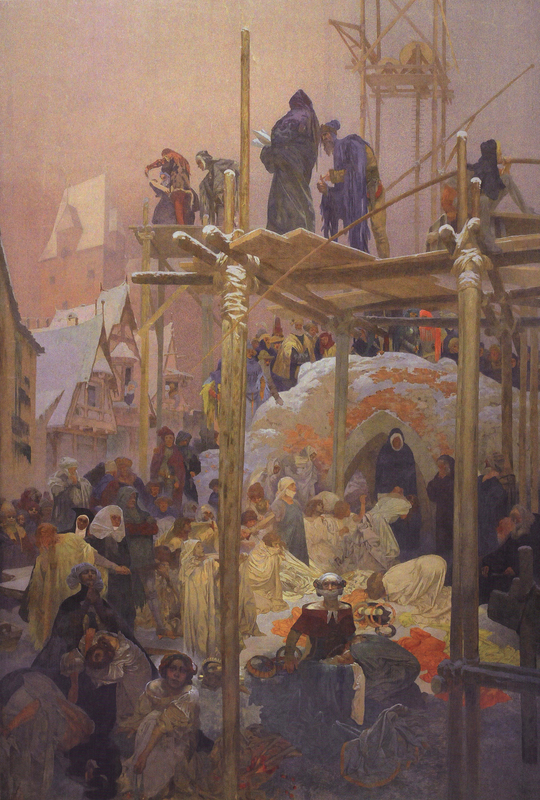 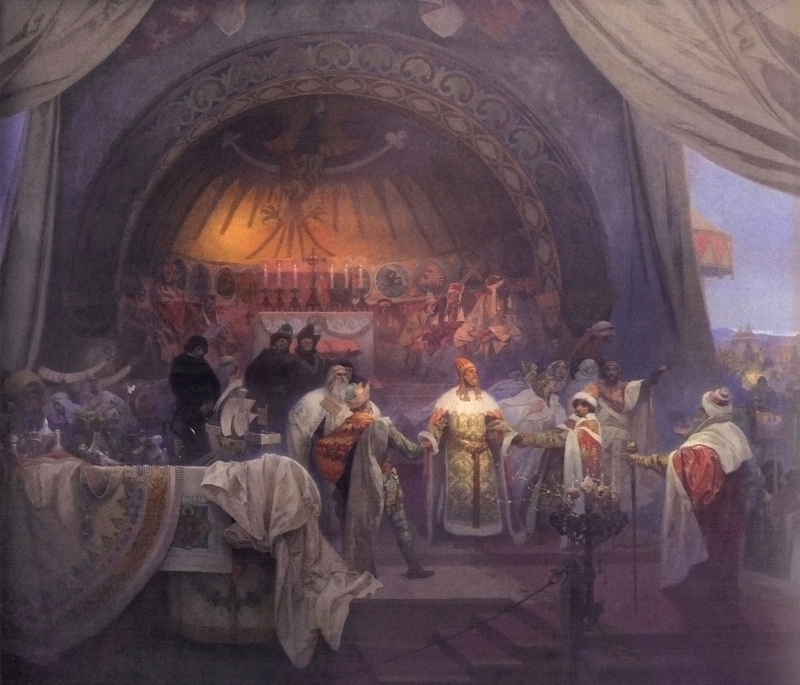 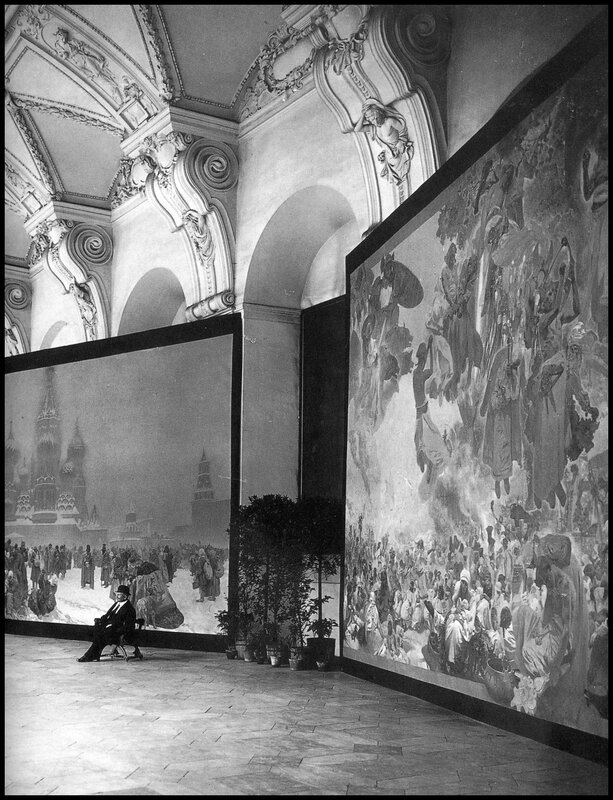 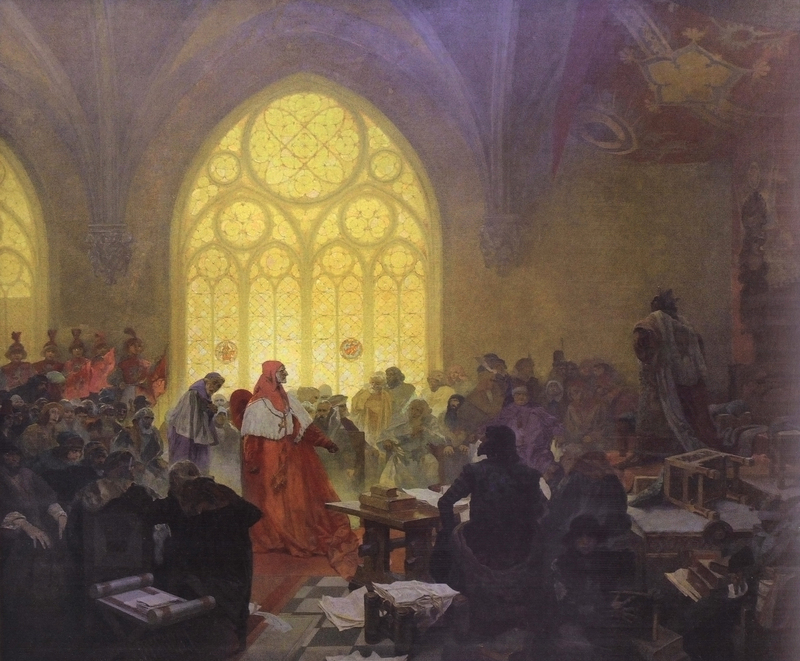 In 1935, the Slav Epic had it’s final exhibition before the death of Mucha, after he had gifted the works to the city of Prague. 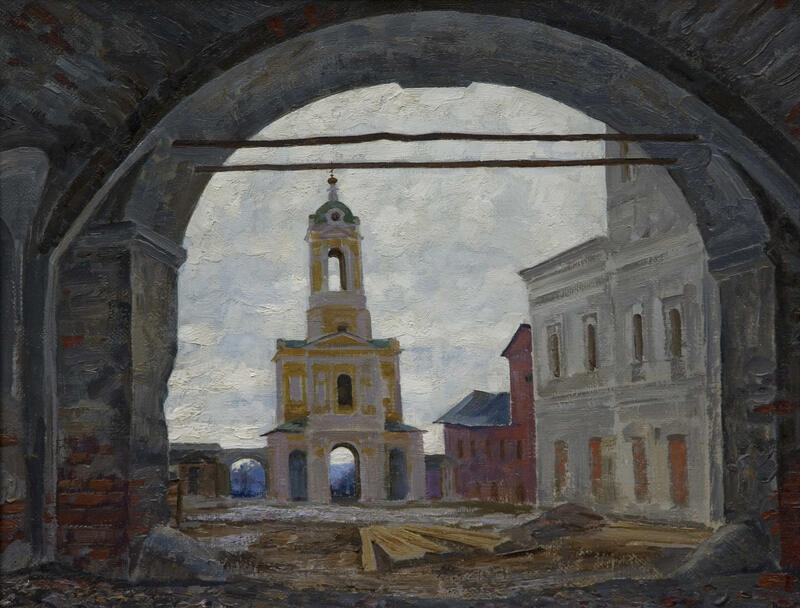 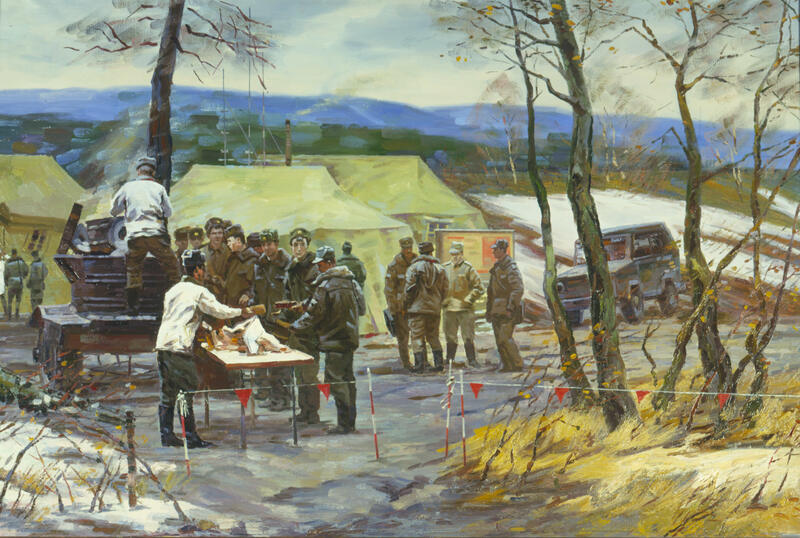 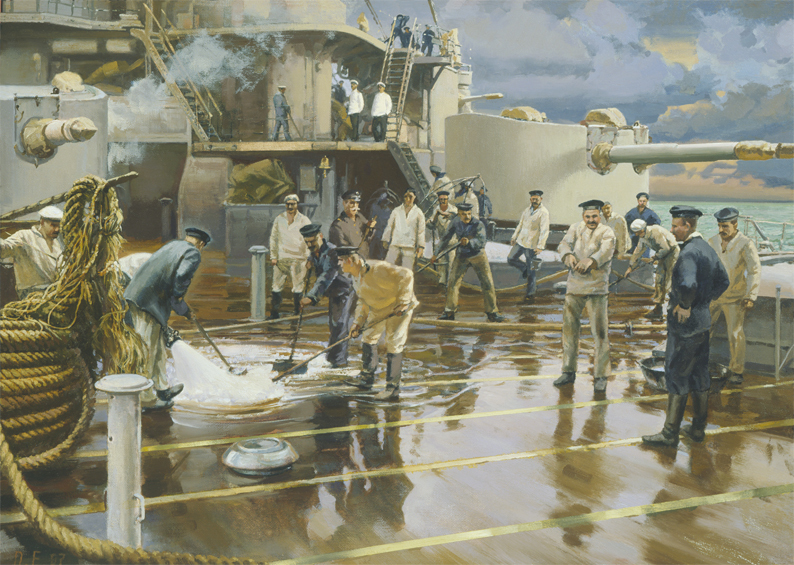 Because the city was not able to provide a permanent place to display the works, the paintings were rolled up and placed in storage, although some say this was done in order to prevent confiscation from invading German forces. 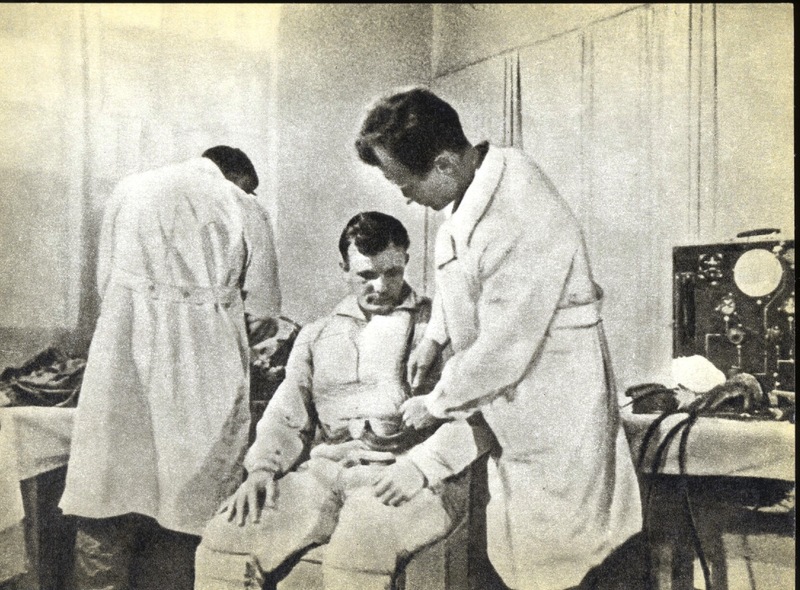 Four years later, Mucha was captured by German troops during the beginning of World War II and interrogated. 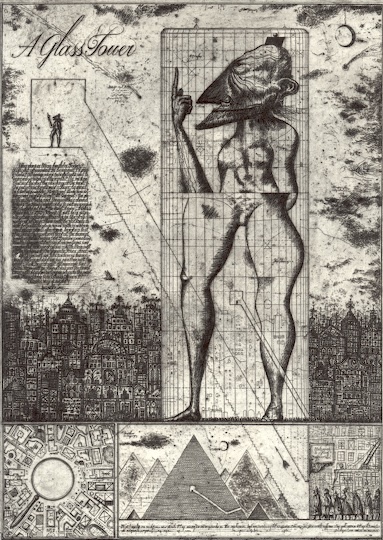 Shortly after being released, the artist succumbed to a lung infection and died, disappointed that his greatest work had seen such an unfortunate fate. 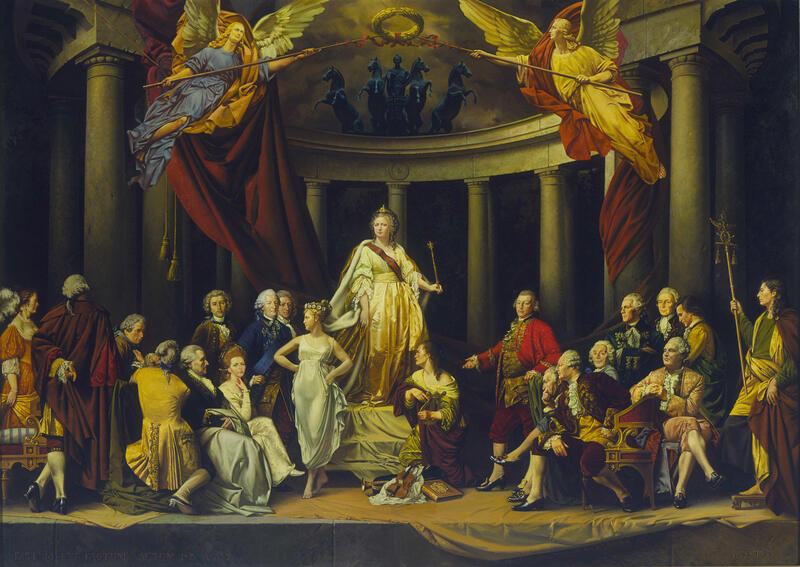 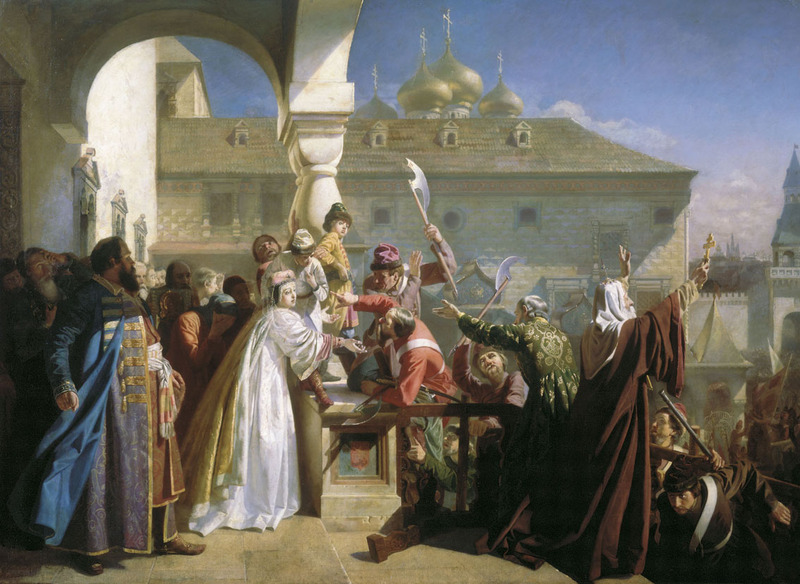 Up until 1950, the government refused to put the works on display again, in fact it would only be until 1967 when the full set of paintings would be displayed again after being brought to the city of Moravsky Krumlov by a group of patriots. 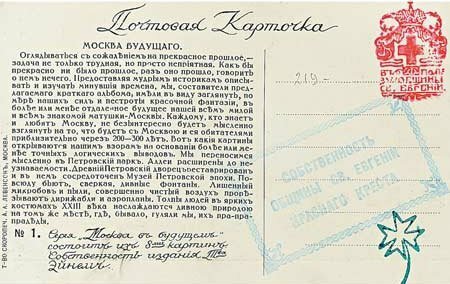 Indeed this may be something some governments should take heed to today. 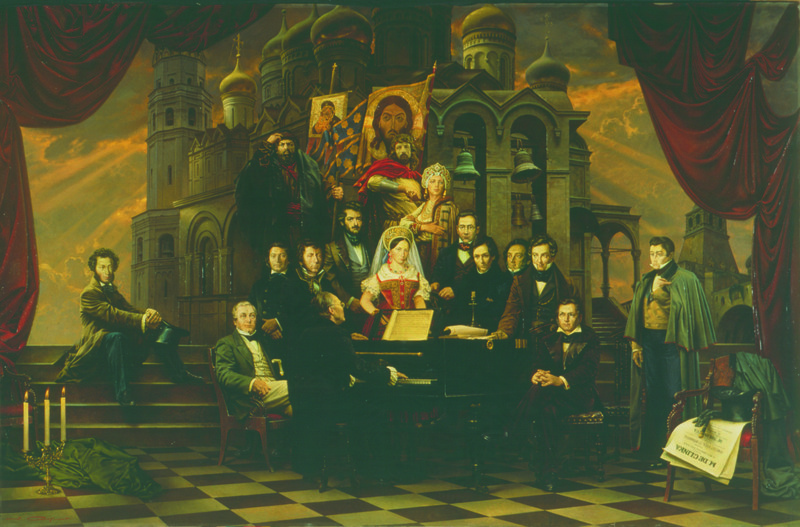 Nevertheless, this work remains a great achievement (and a tribute to an even greater culture), which is sadly, devoid of much praise. 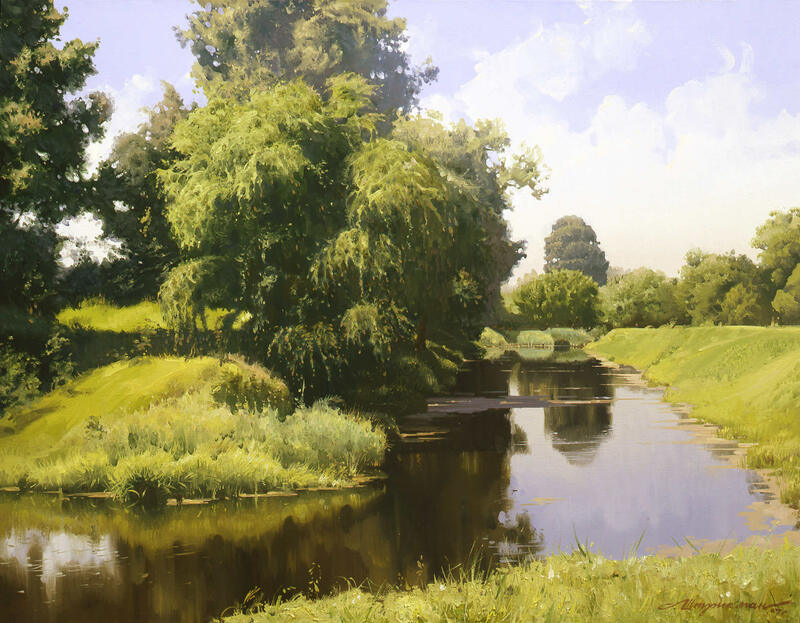 But today, I hope to bring the readership of this site all twenty of these tremendous works so that a different audience will be able to see these works and possibly appreciate them more than the previous had. 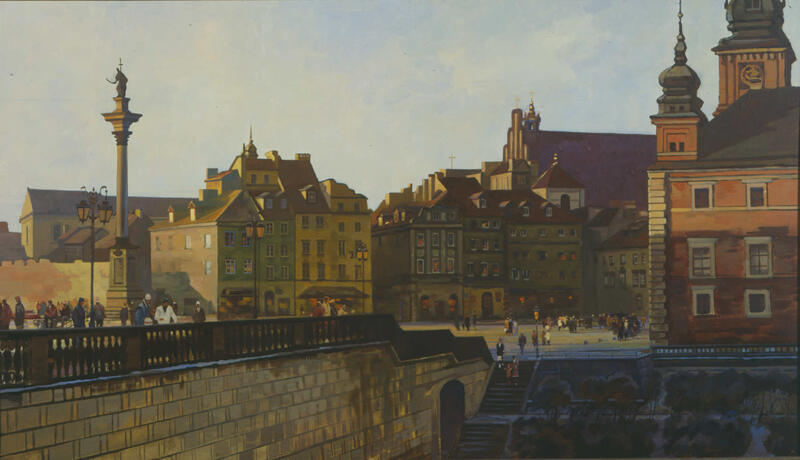 Currently, the Czech government hopes to accomplish the same by moving the works to the city of Prague so that it may be seen by a wider range of people, notably tourists.